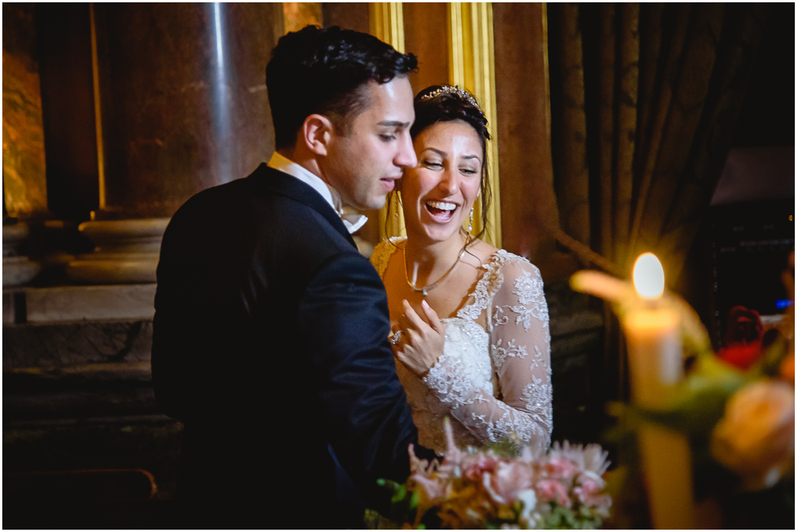 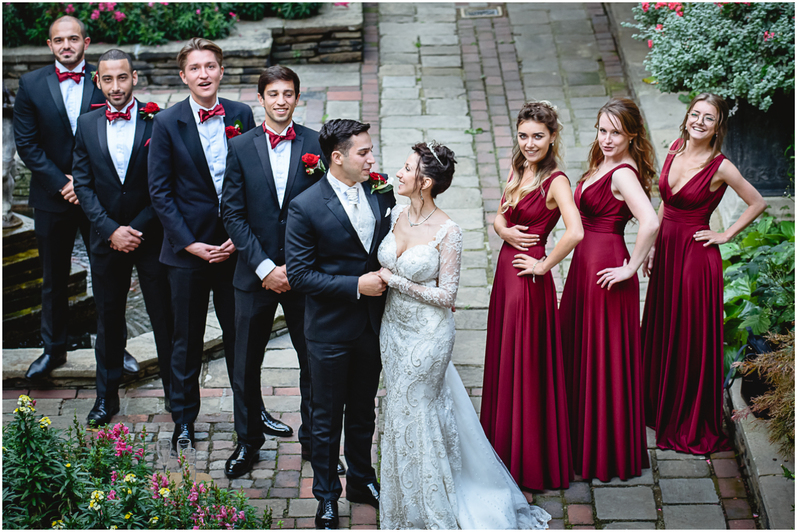 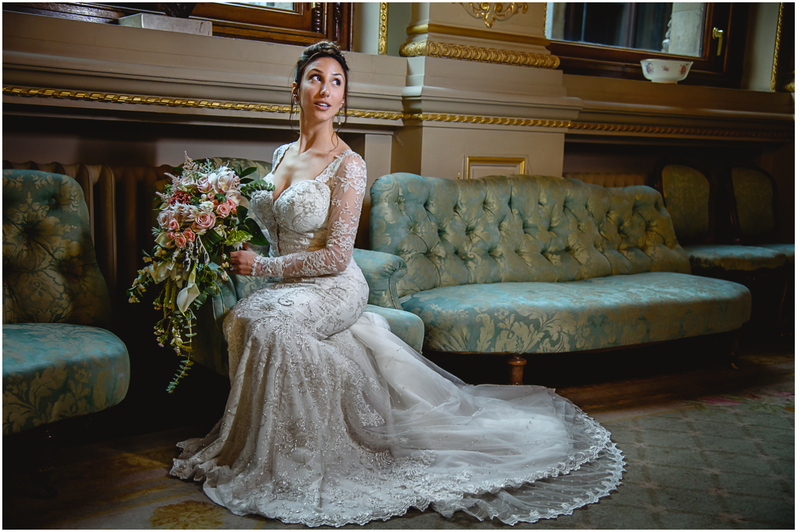 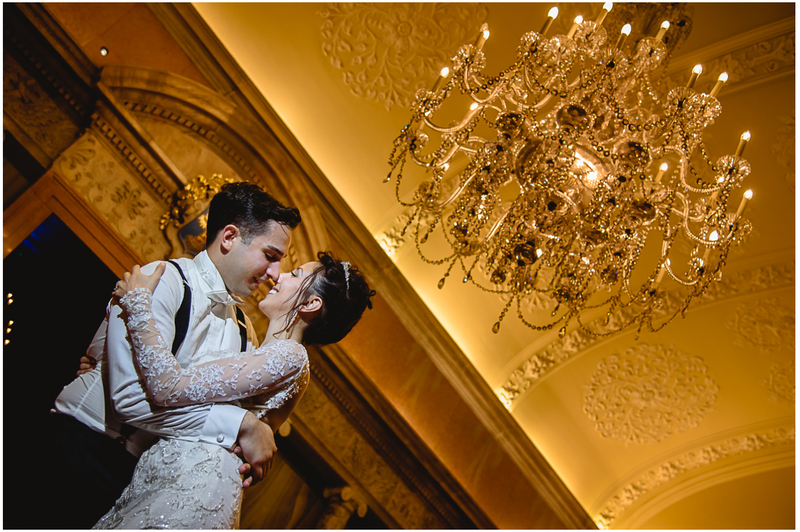 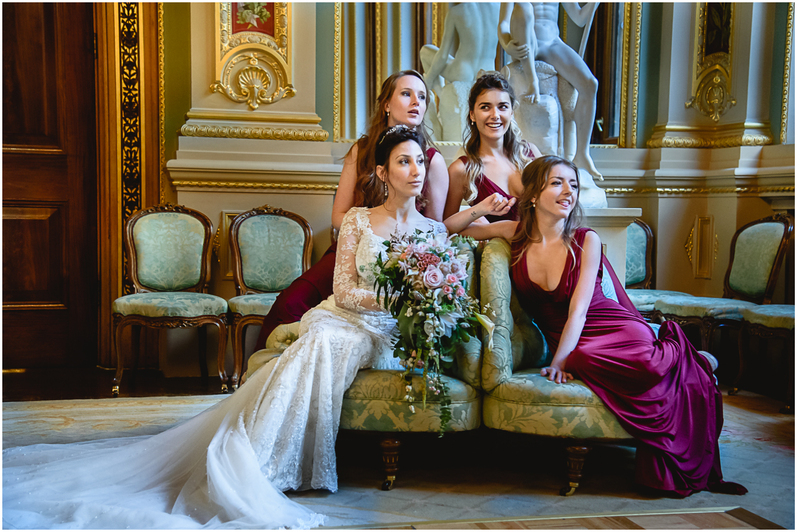 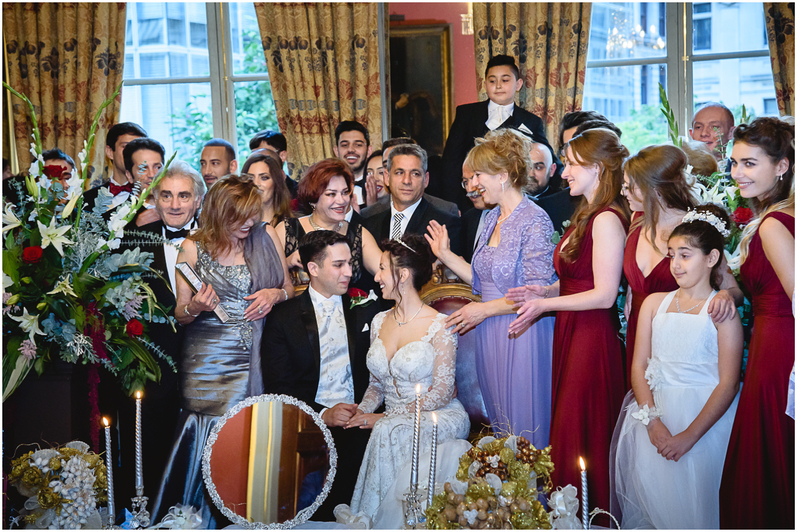 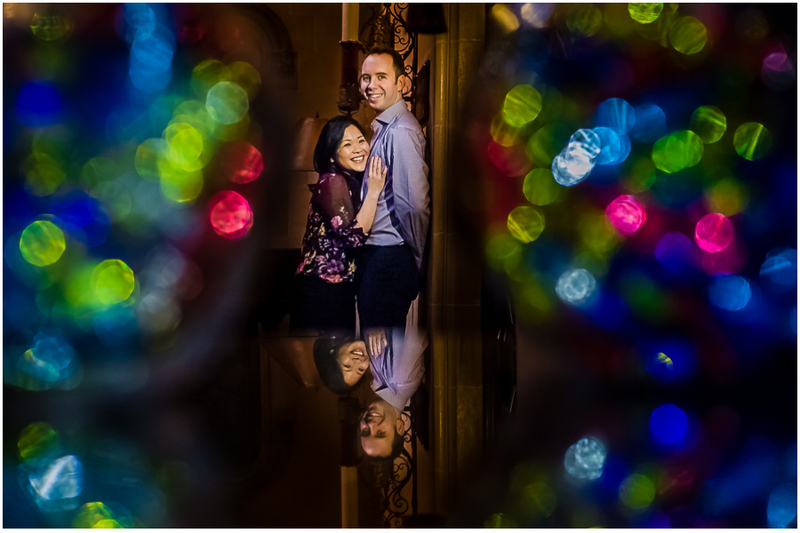 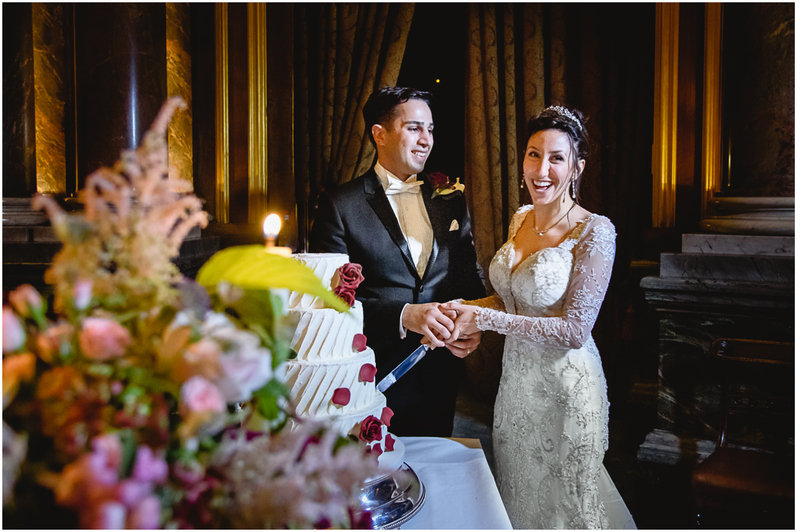 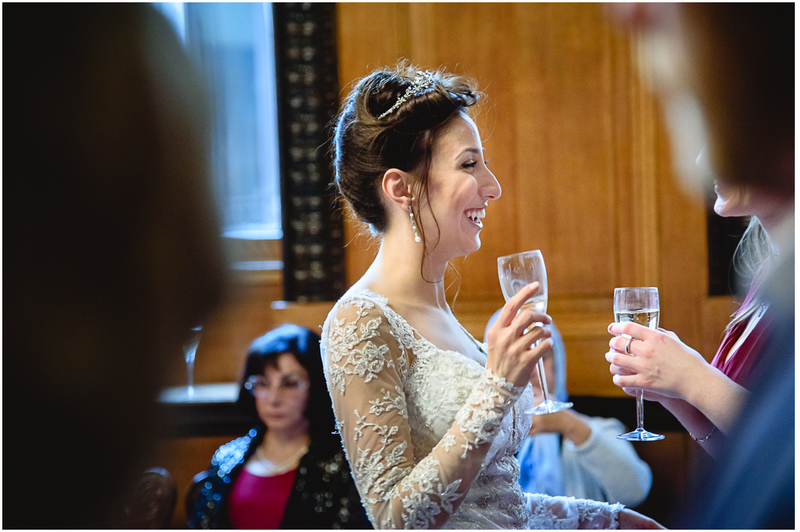 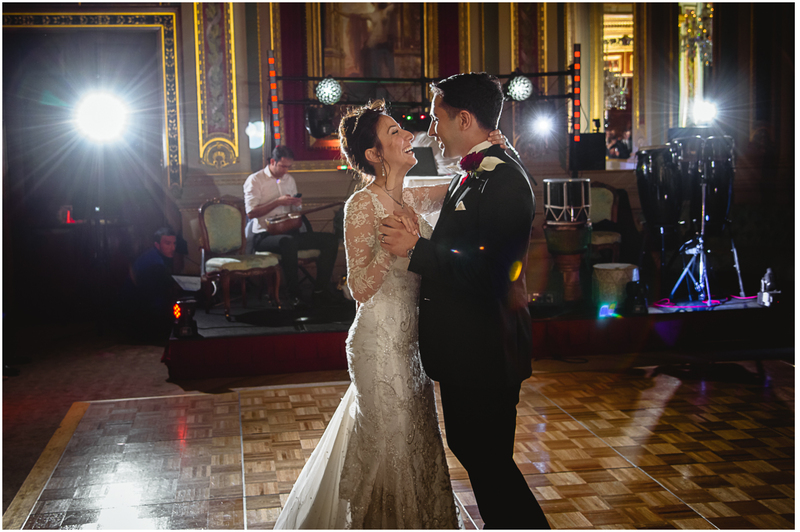 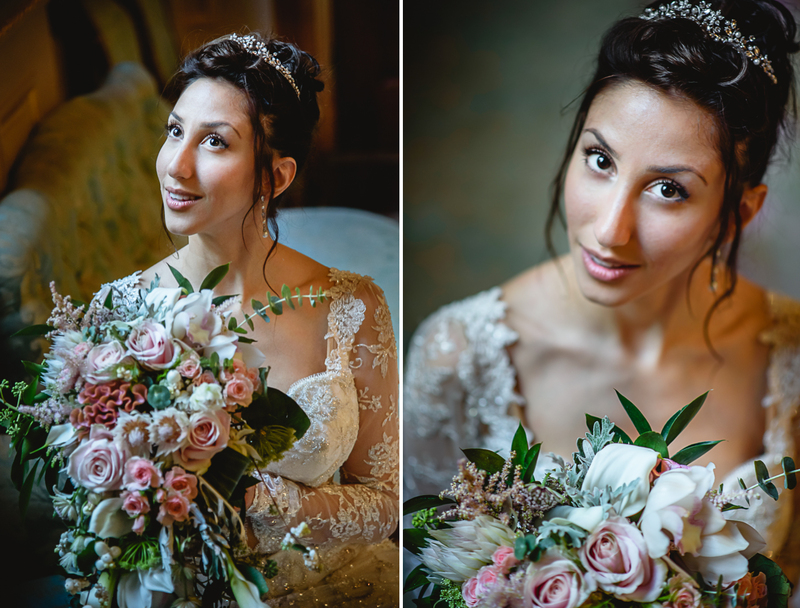 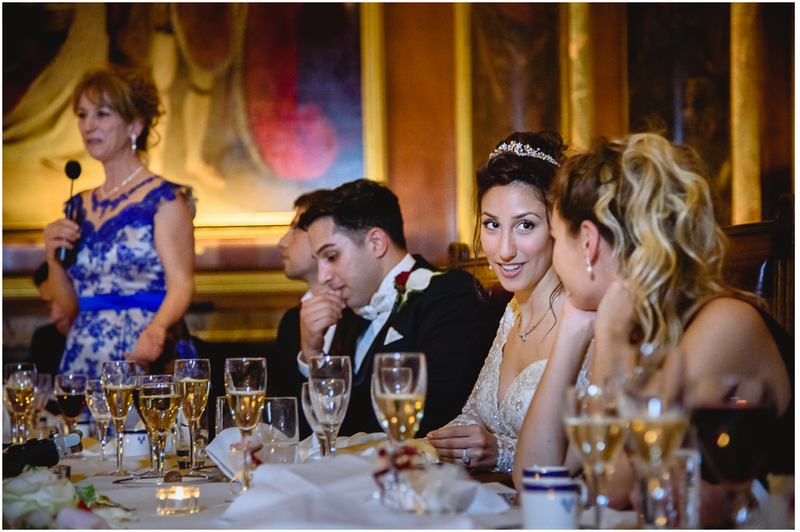 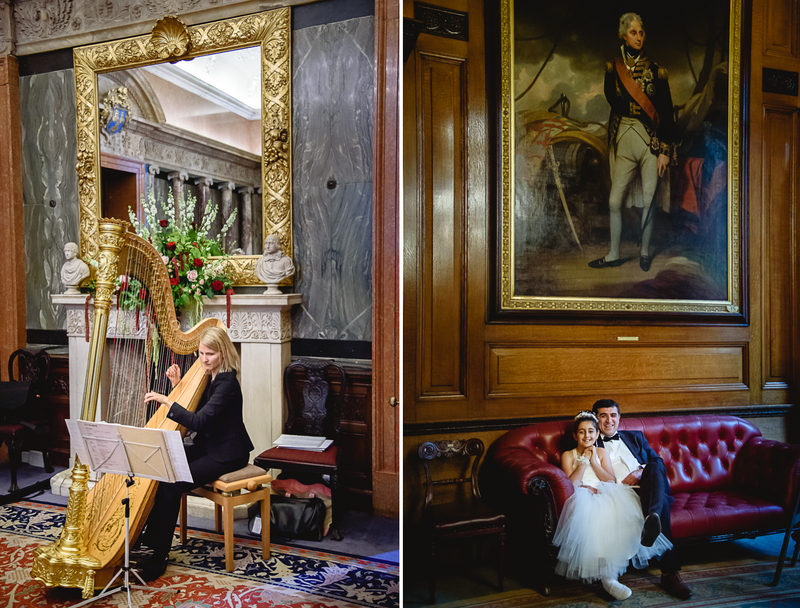 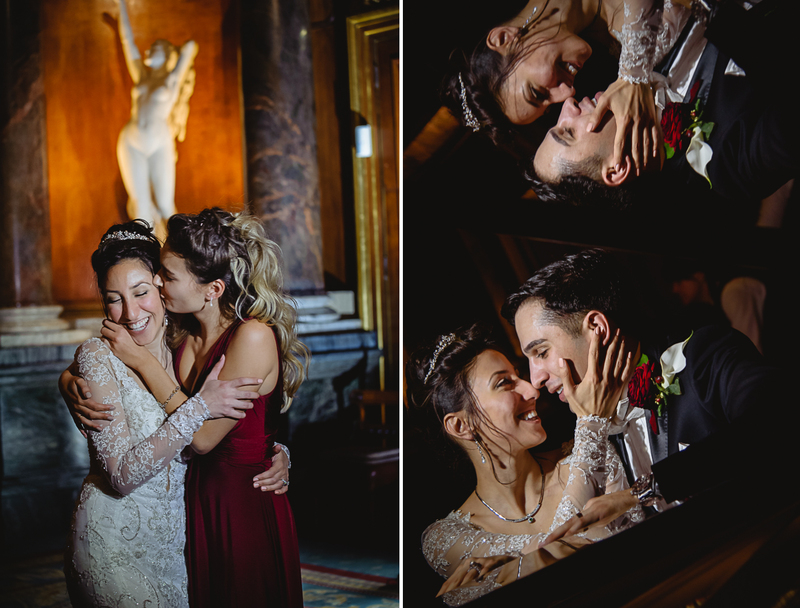 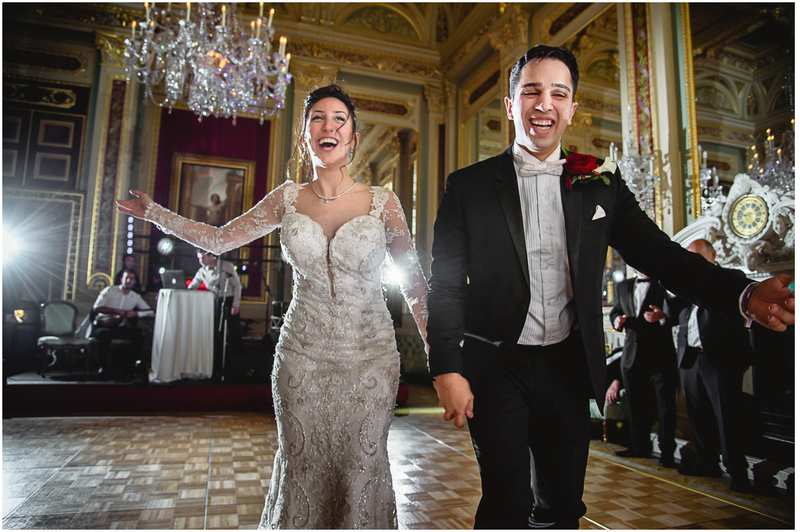 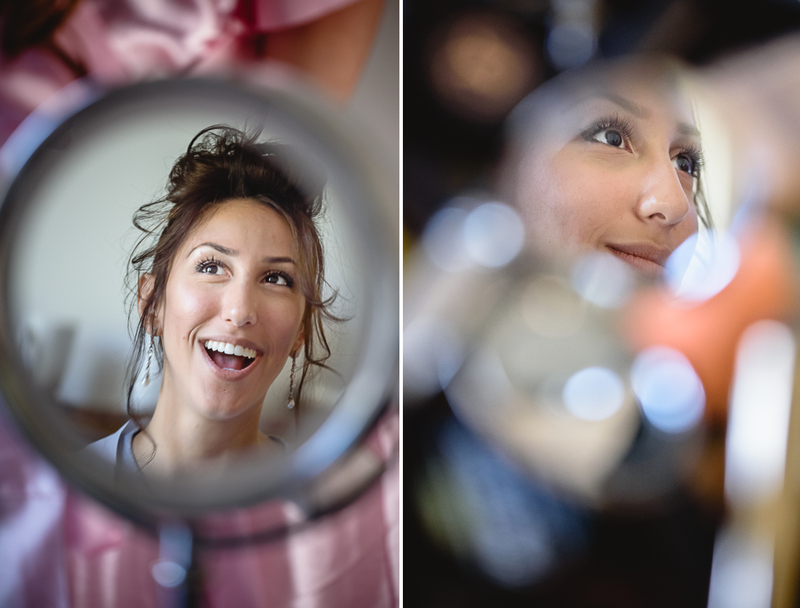 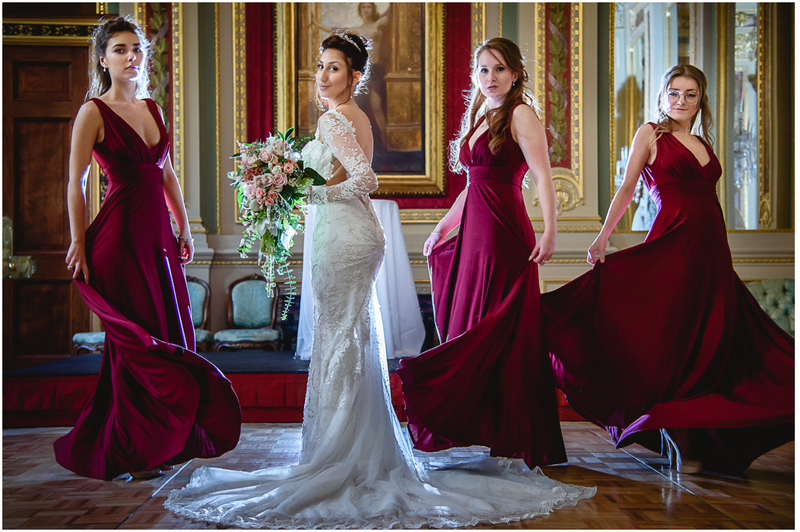 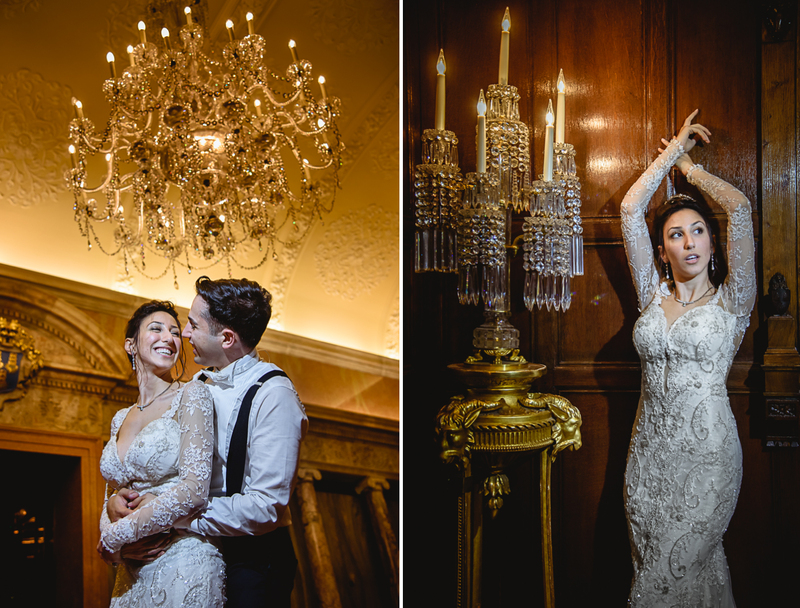 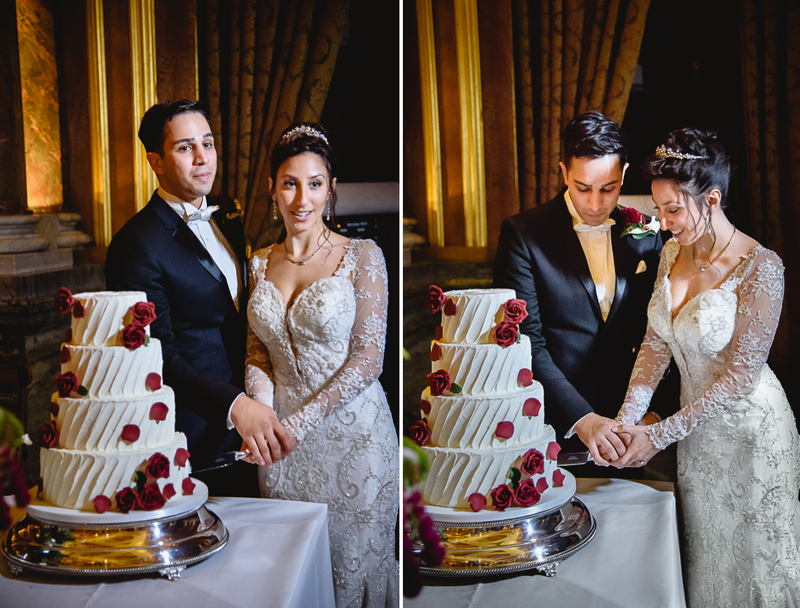 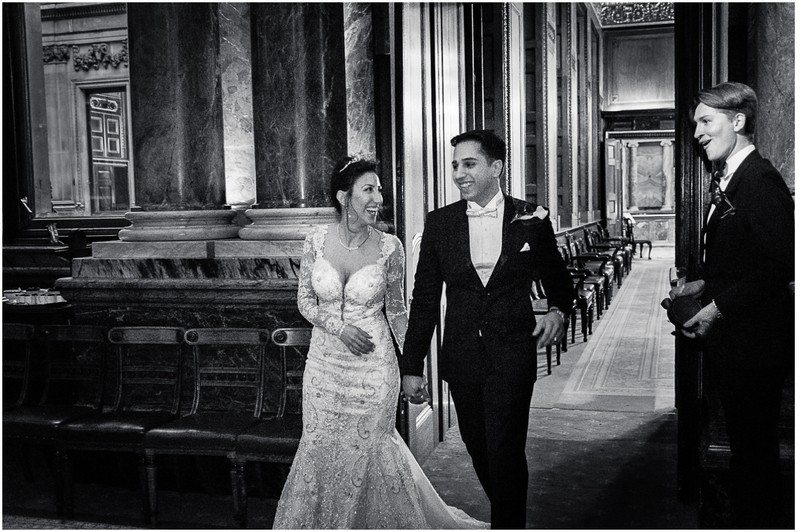 Today we are very excited to present an exquisite wedding of beautiful couple Abtin and Kristina in the Drapers Hall London, who would be a joy to photograph for every London wedding photographer. 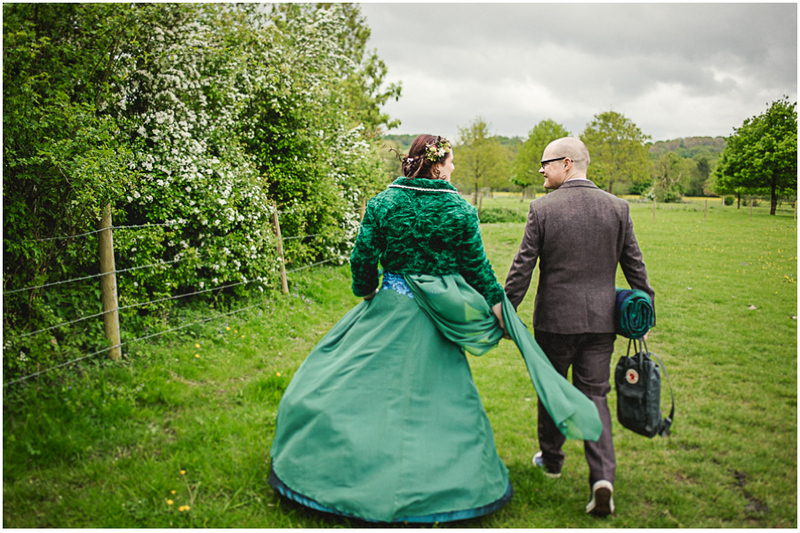 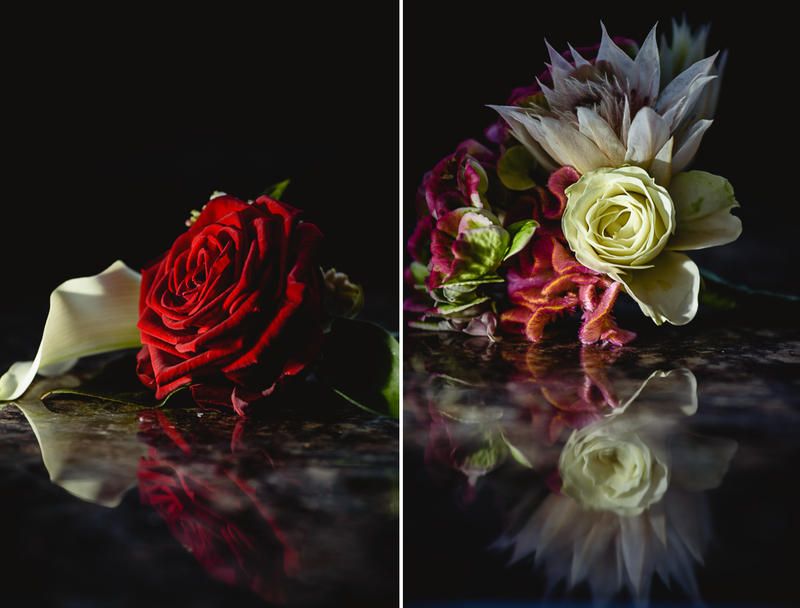 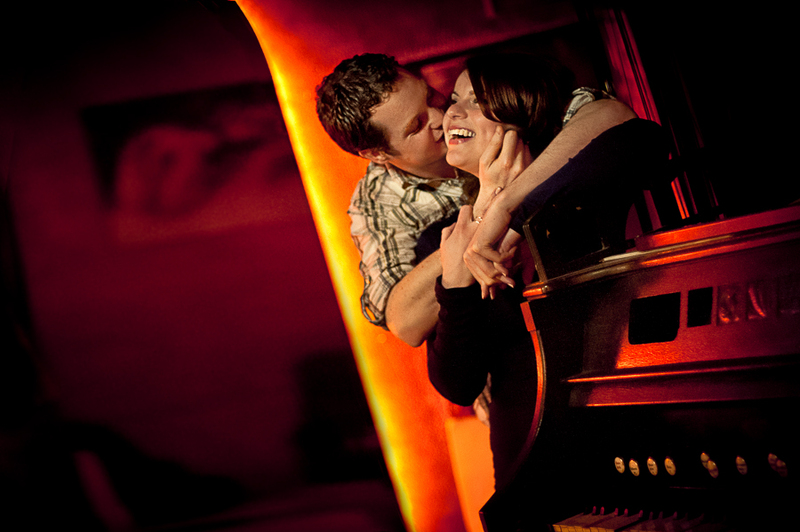 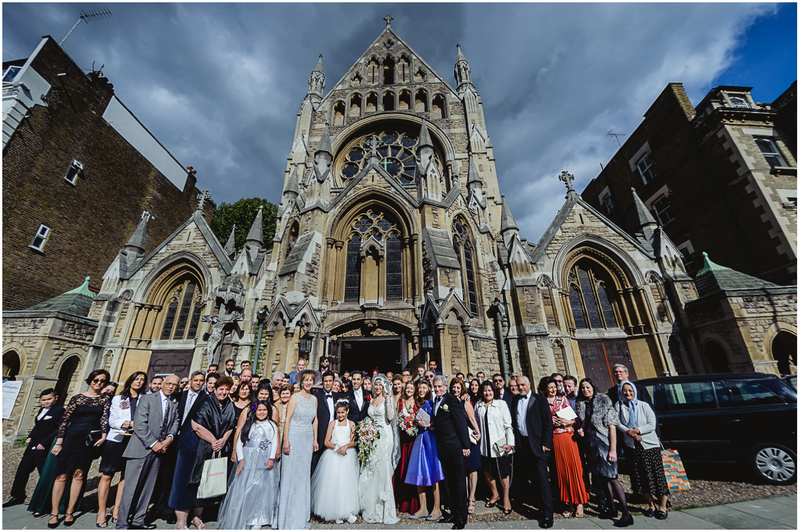 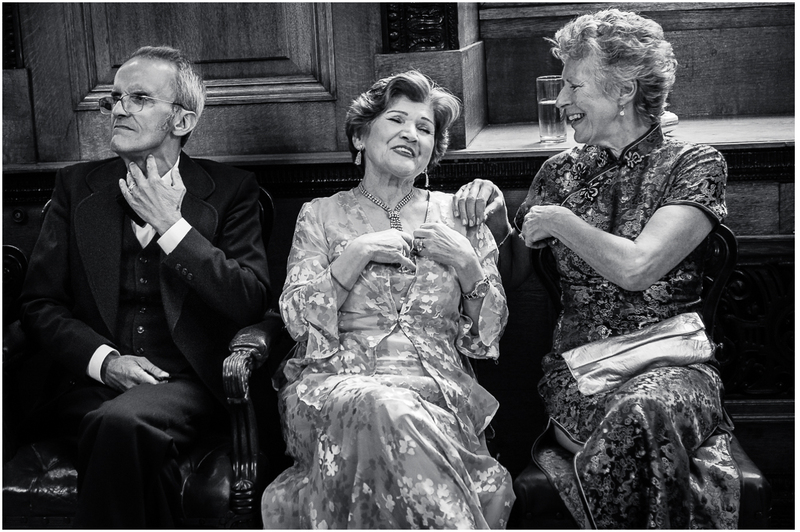 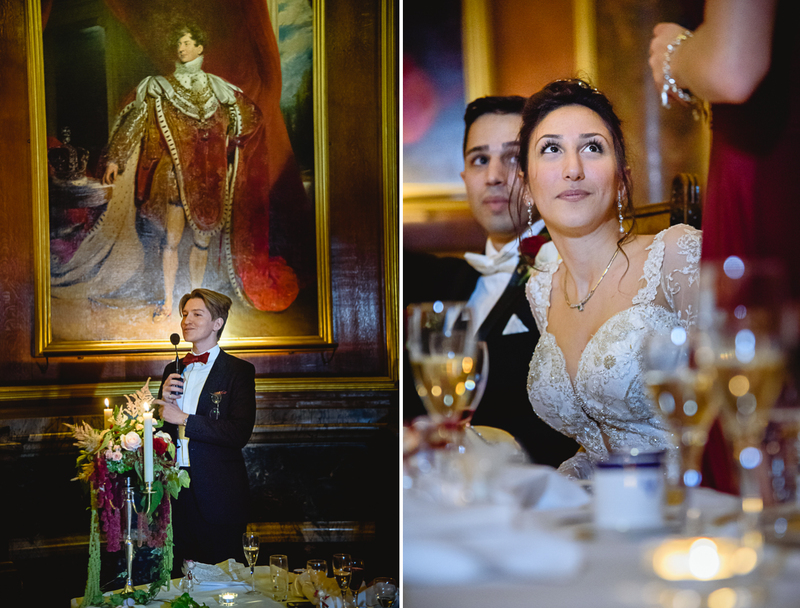 Being a London wedding photographer is sometimes a very good fun. 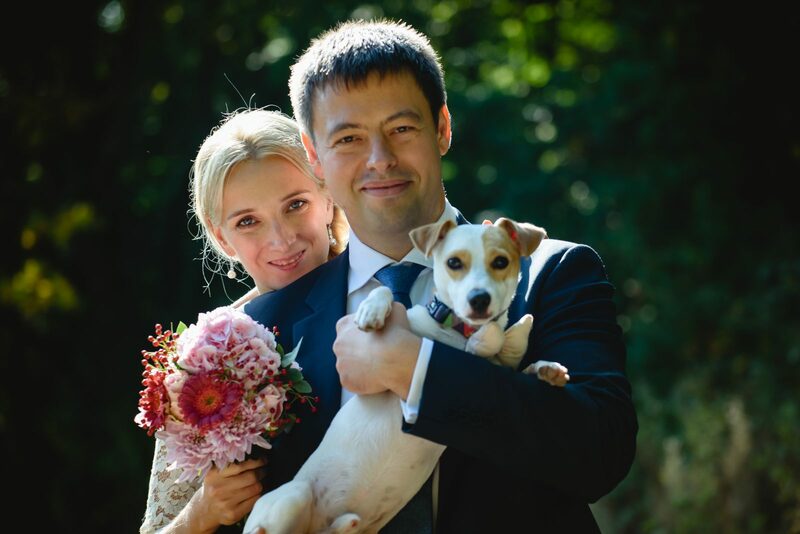 It was a very sunny September day. 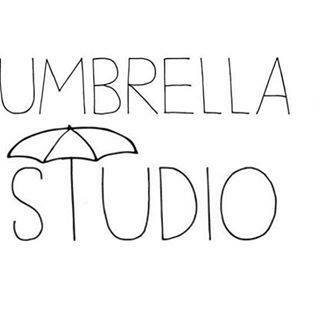 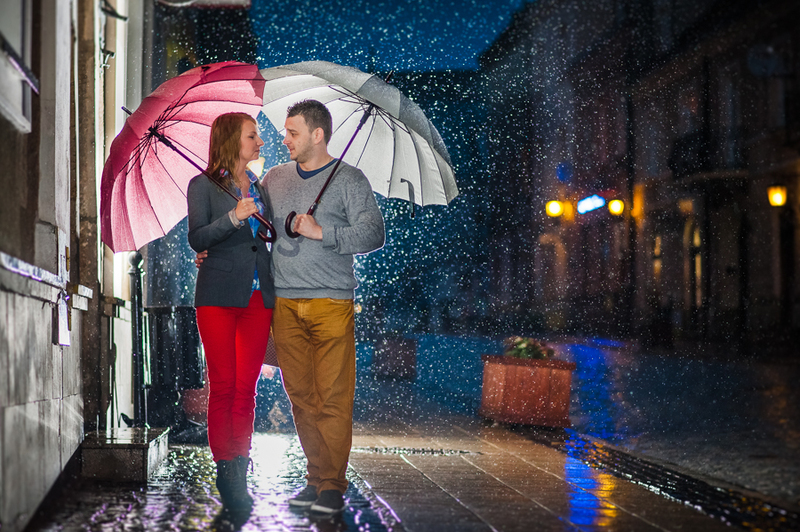 We were very happy that we won’t have to work in rain this time. 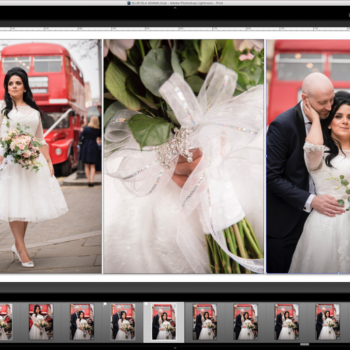 We’ve started the work early at grooms place photographing the details. 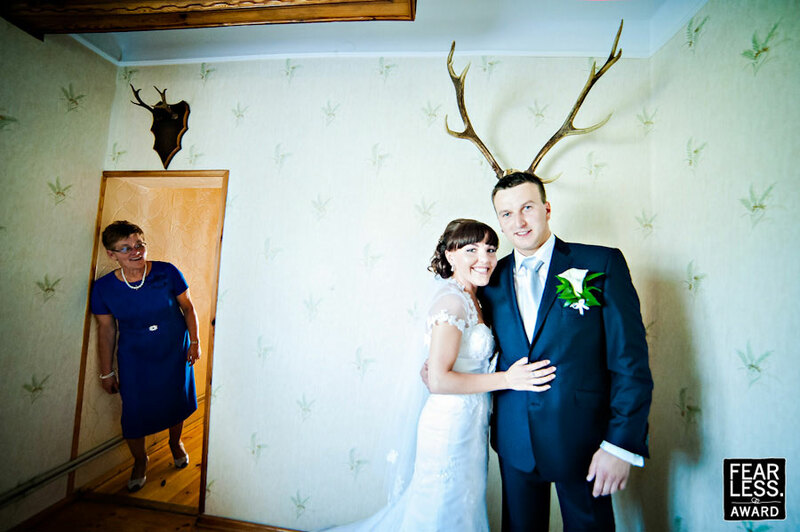 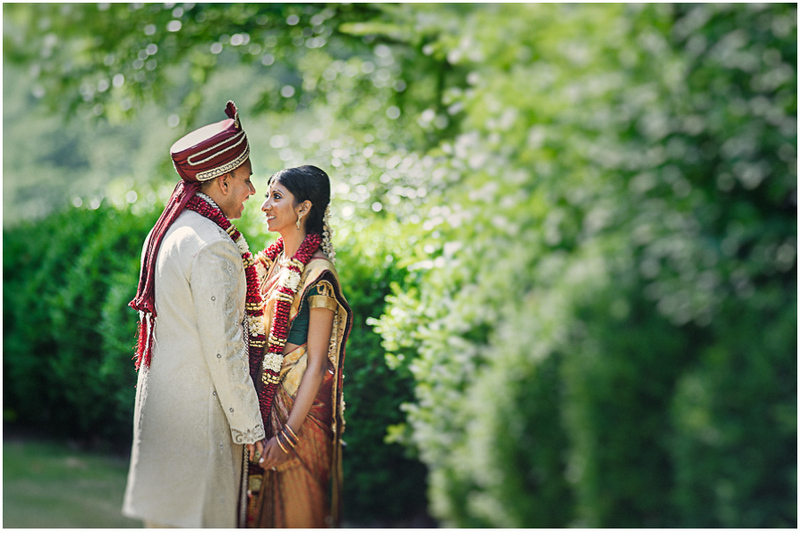 All the details were perfectly matched and we really loved them. 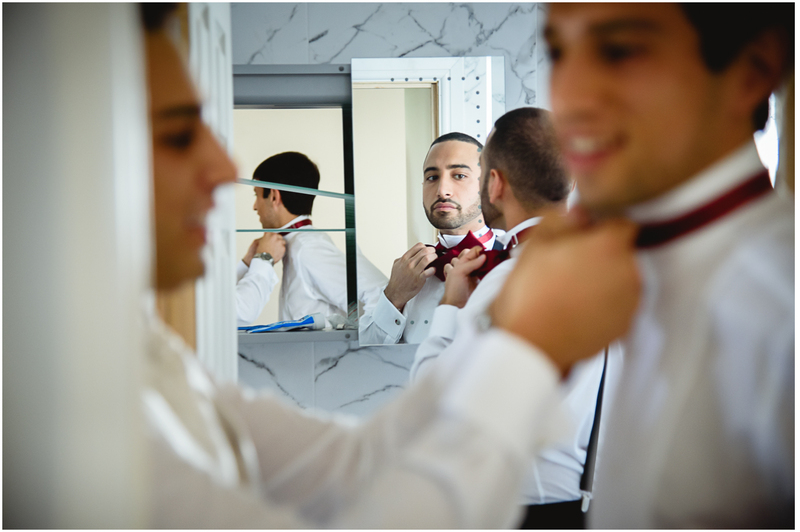 The groom prepared with the help of brides father and his cousin. 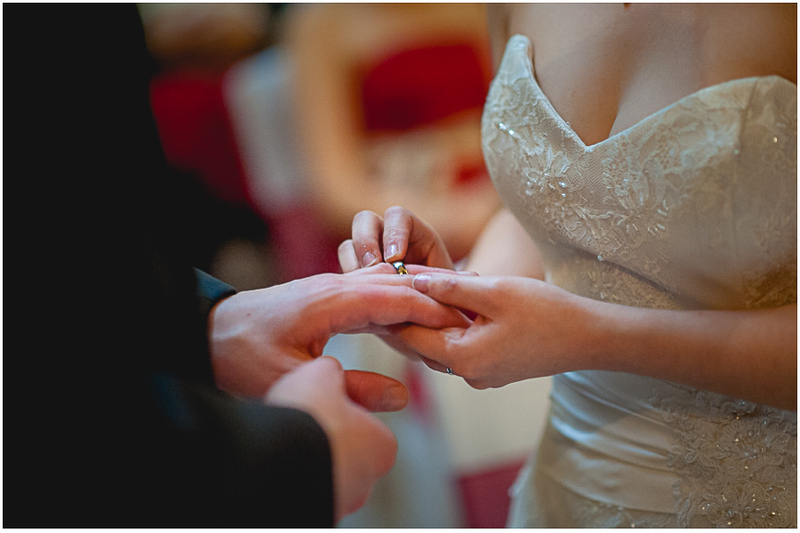 We love to photograph the details, especially engagement rings. 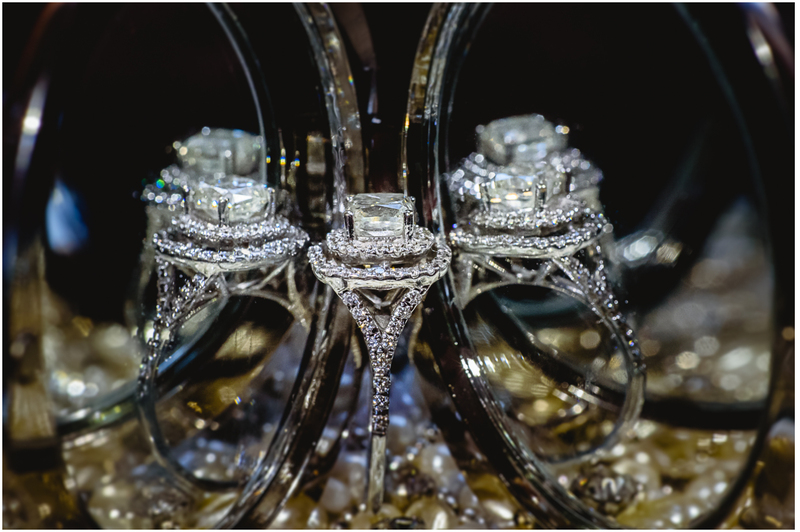 The beautiful engagement ring of the bride doesn’t need anything else to look fantastic. 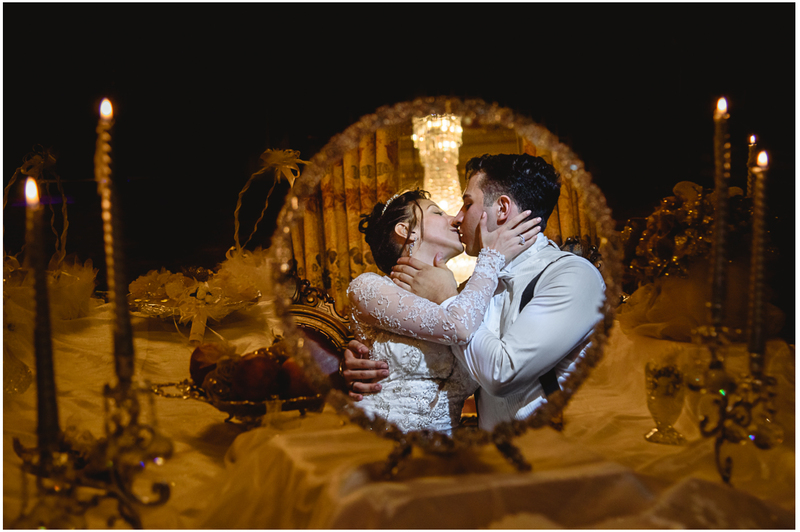 All we needed to reveal its beauty was a good light and the mirror. 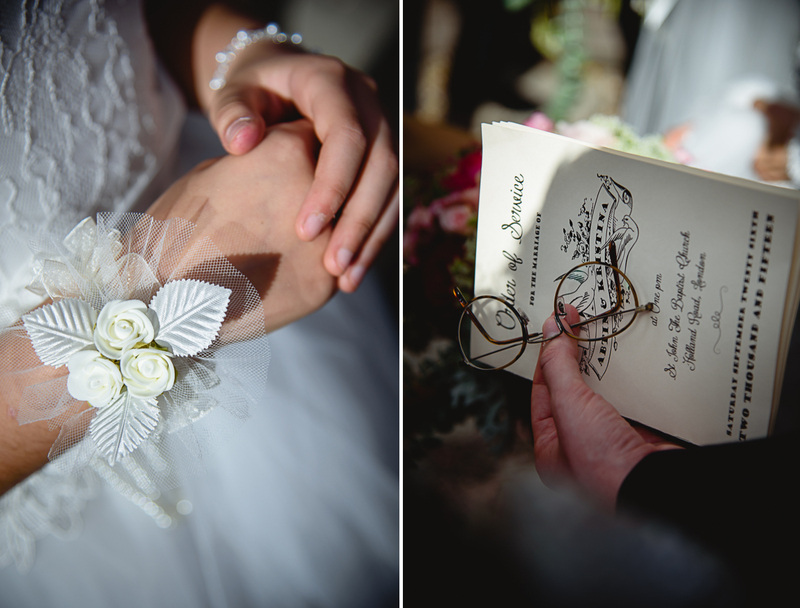 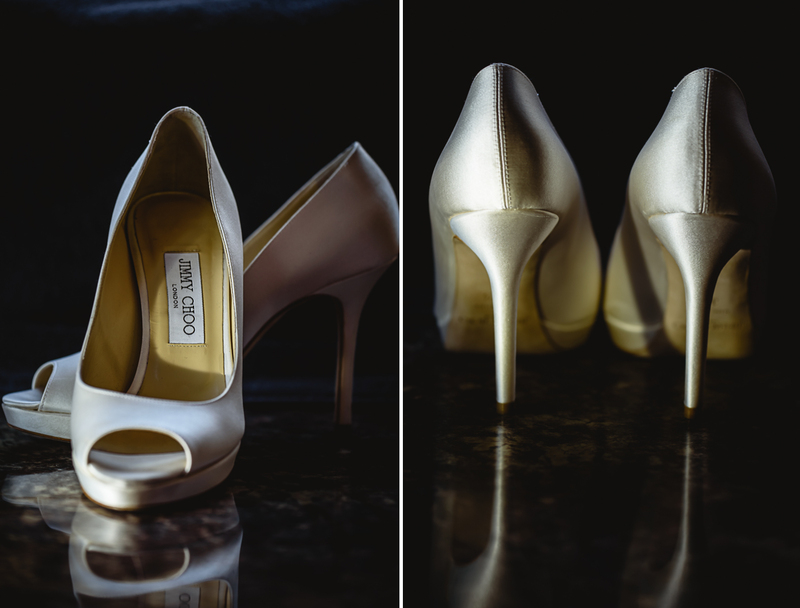 The bride’s shoes are also very important detail in the wedding photography album. 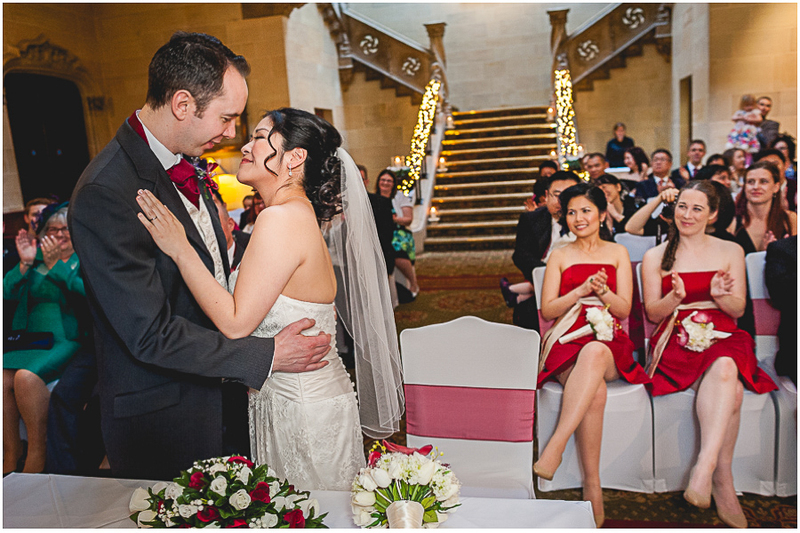 Kristina’s choice was Jimmi Choo marvellous shoes ideally matching her wonderful dress. 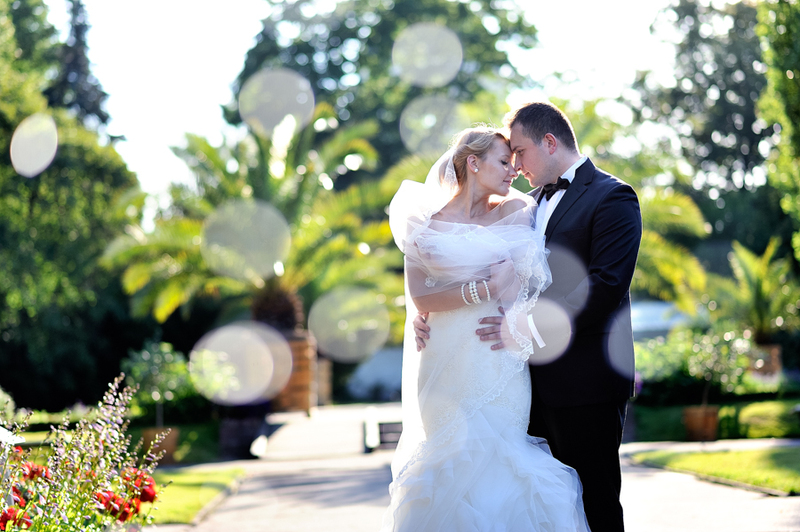 The beautiful sunny weather helped us a lot in making very cheerful photos. 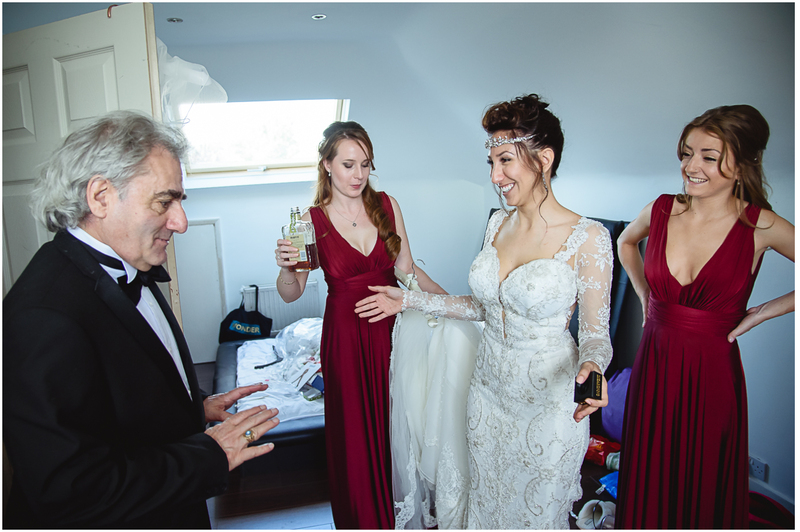 We only regret that the tense timeline didn’t allow us to make some sunny portraits of the bride. 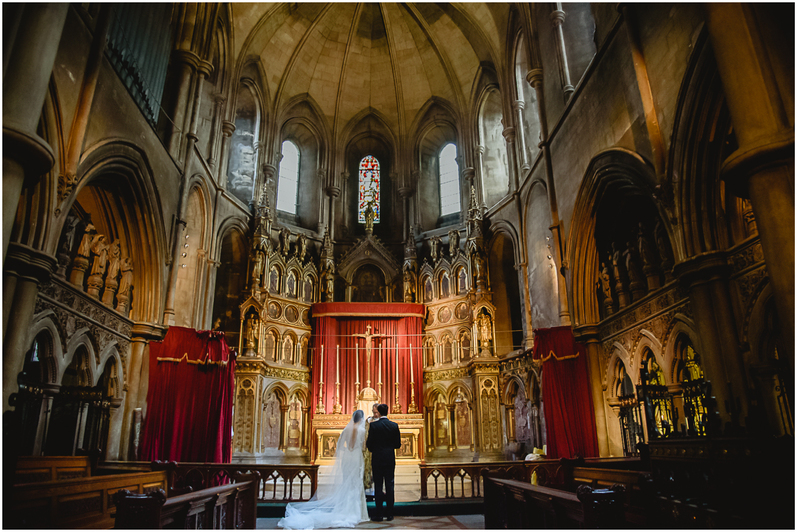 We were stunned by the beauty of the St. John church. 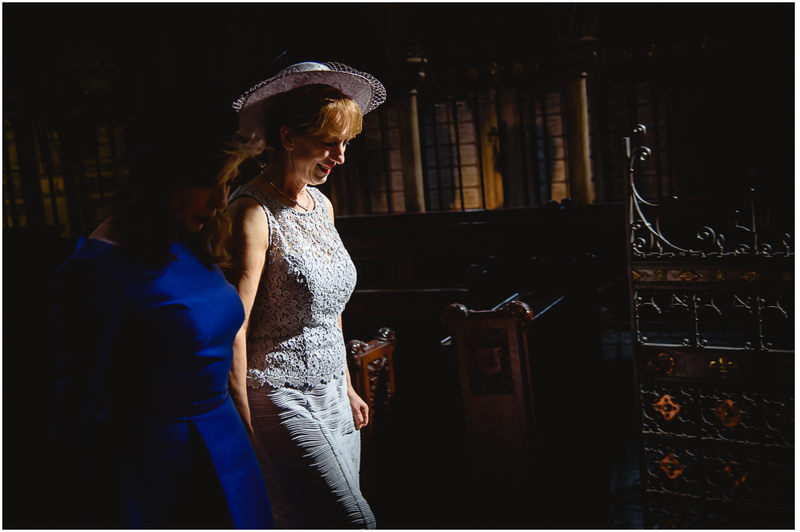 The sun inside the church created beautiful rays of light, we seen such a wonderful light inside the church maybe a couple of times in our 6 years of adventure with photography. 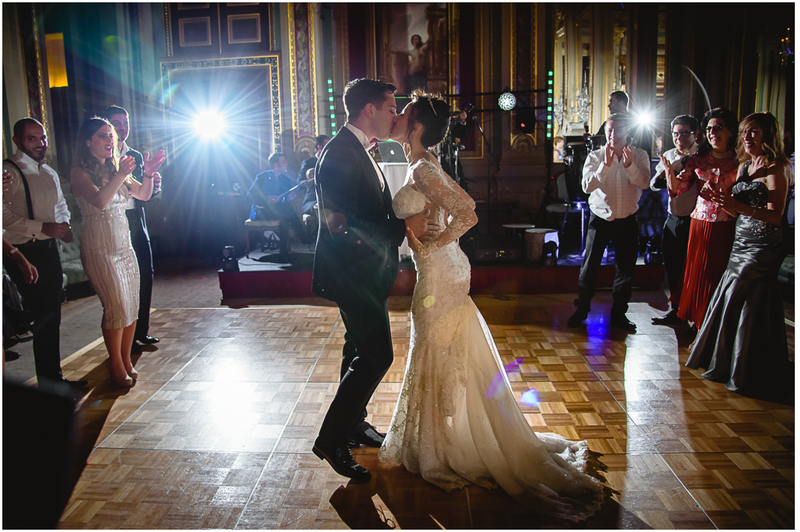 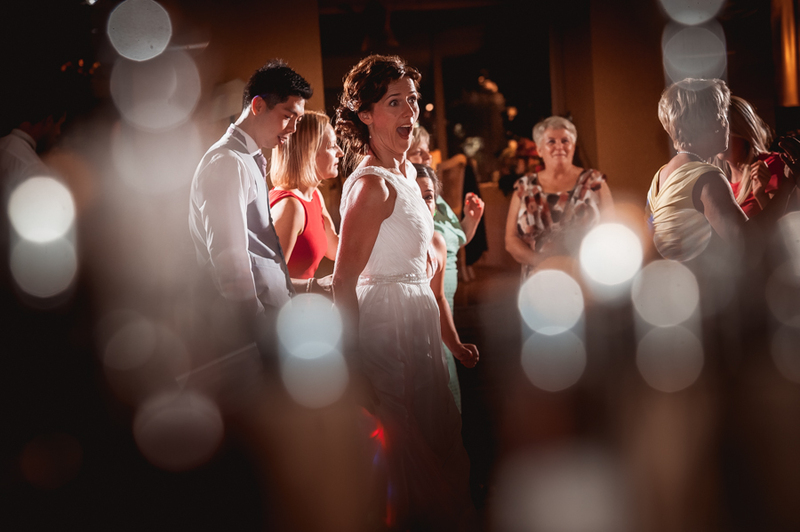 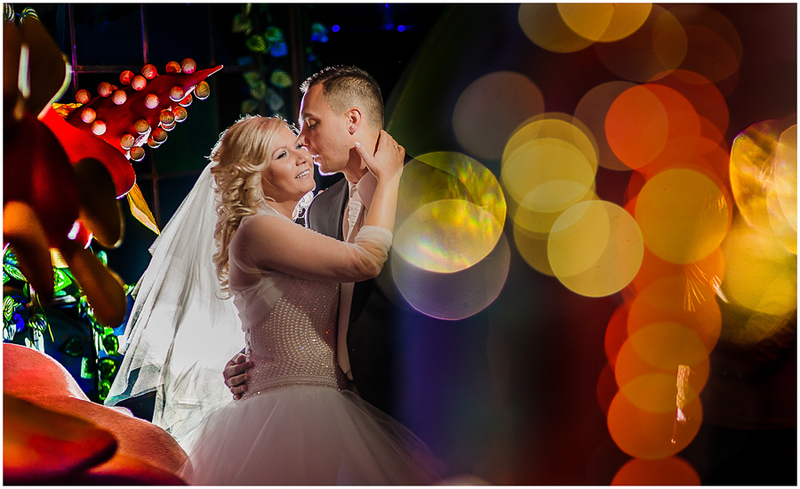 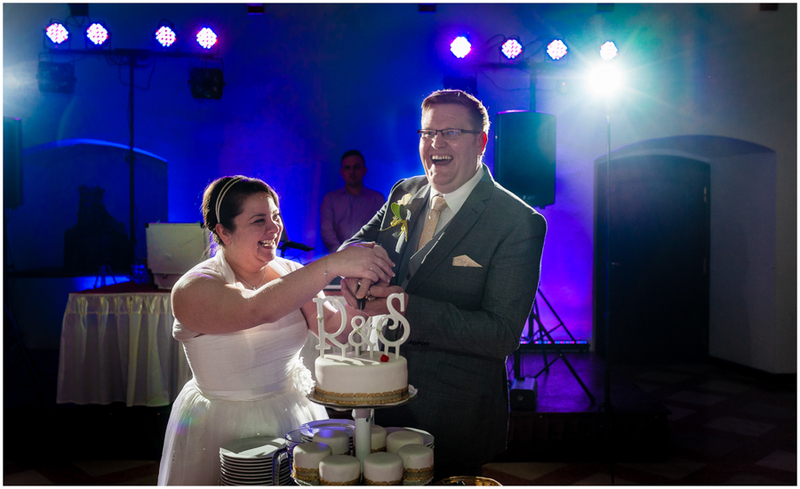 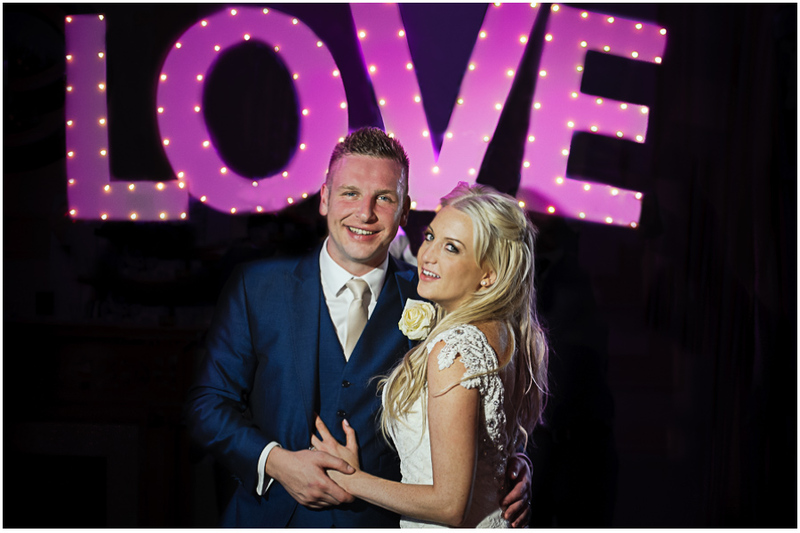 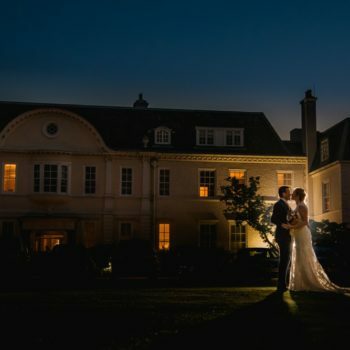 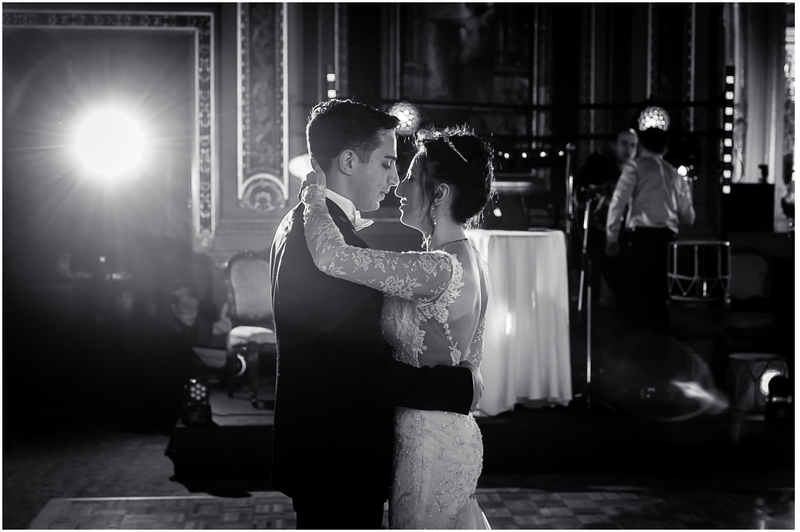 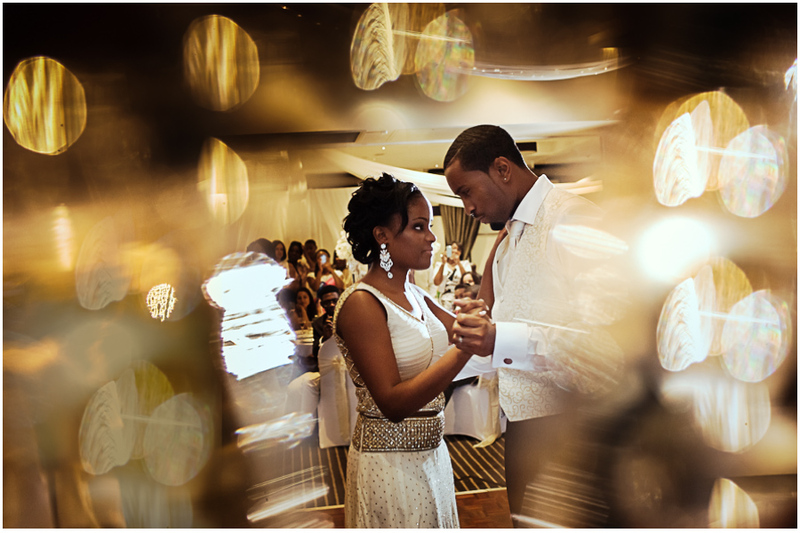 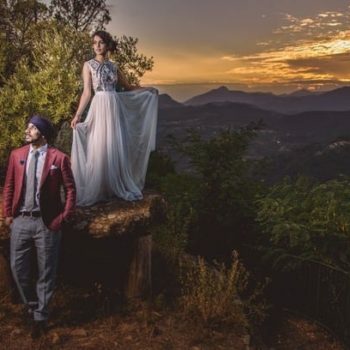 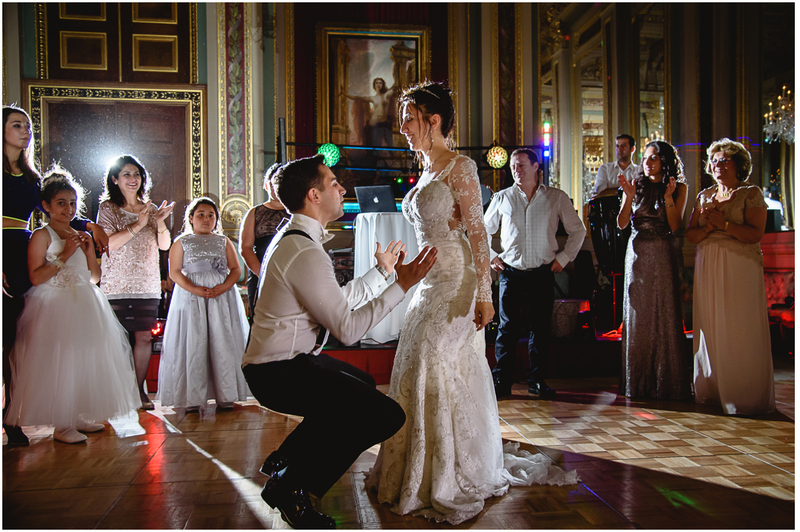 These exceptional lighting conditions and the true emotions of the bride and groom worked together perfectly and created a beautiful environment in which every wedding photographer would like to work. 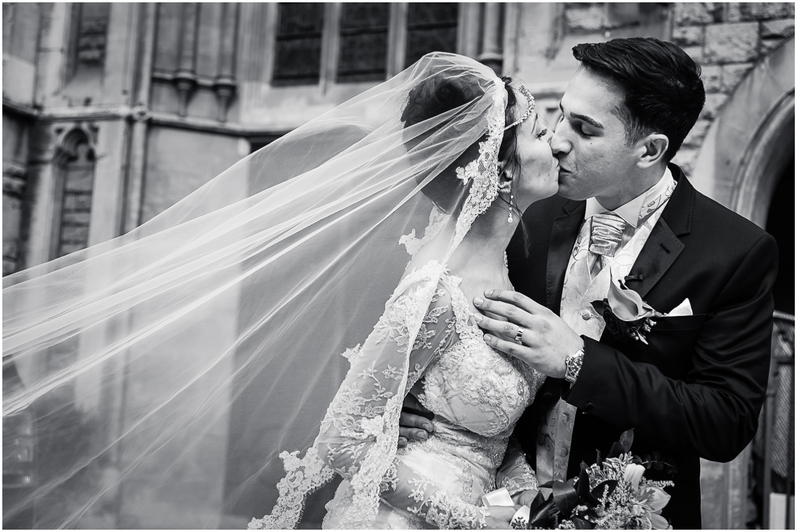 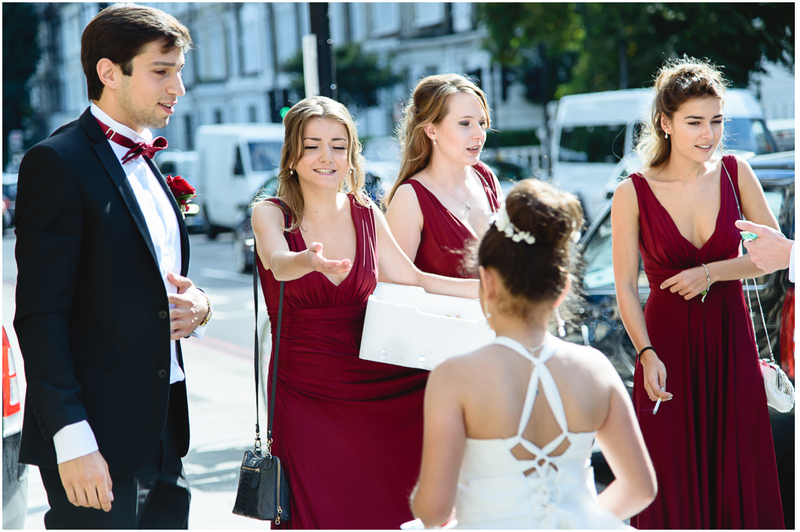 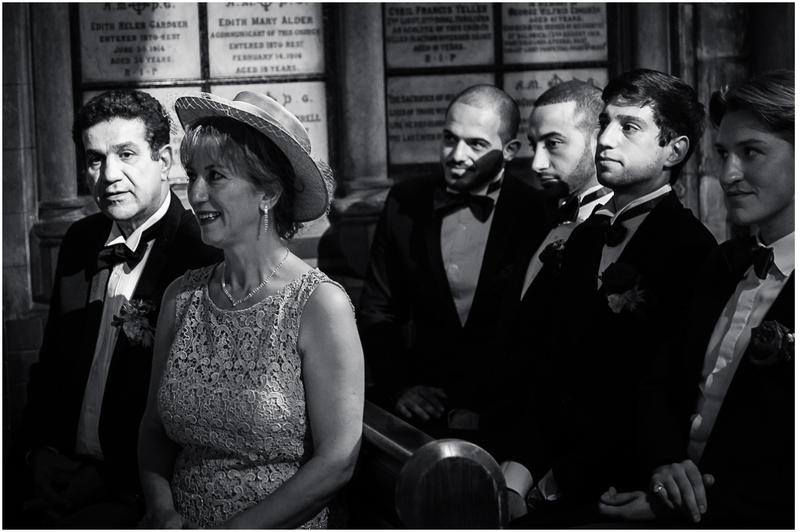 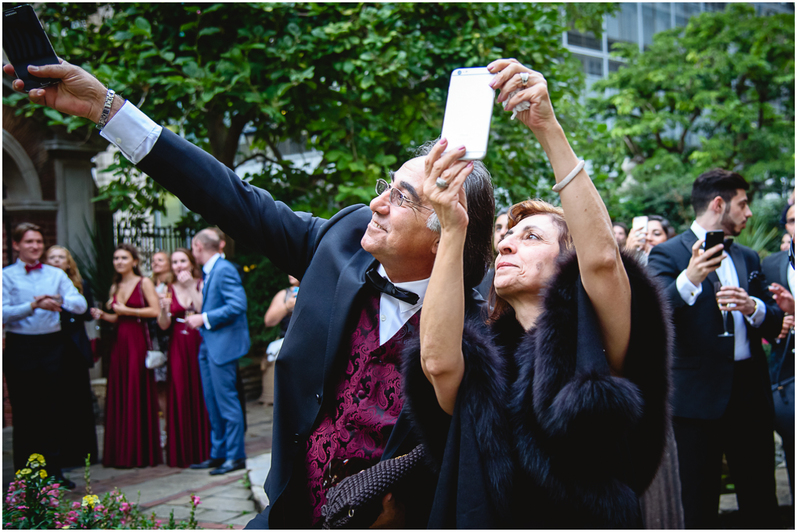 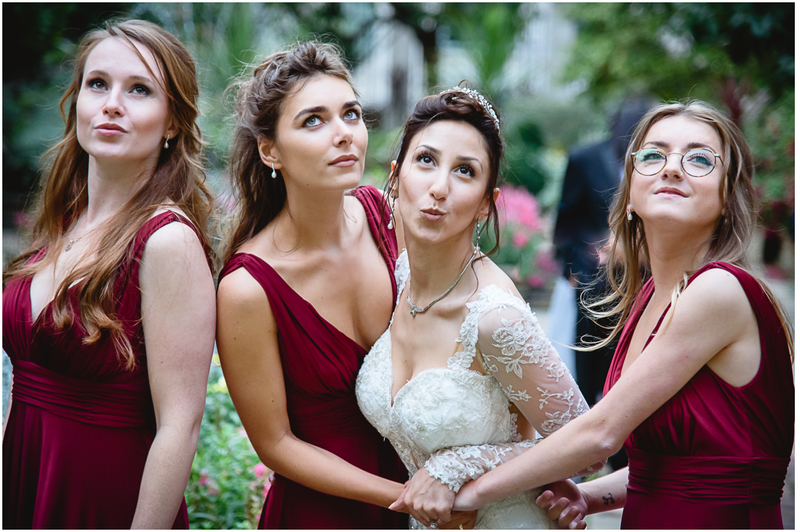 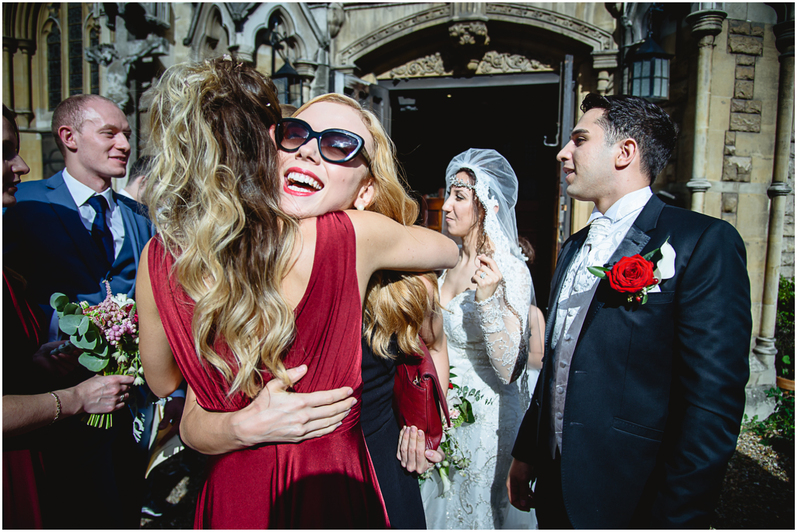 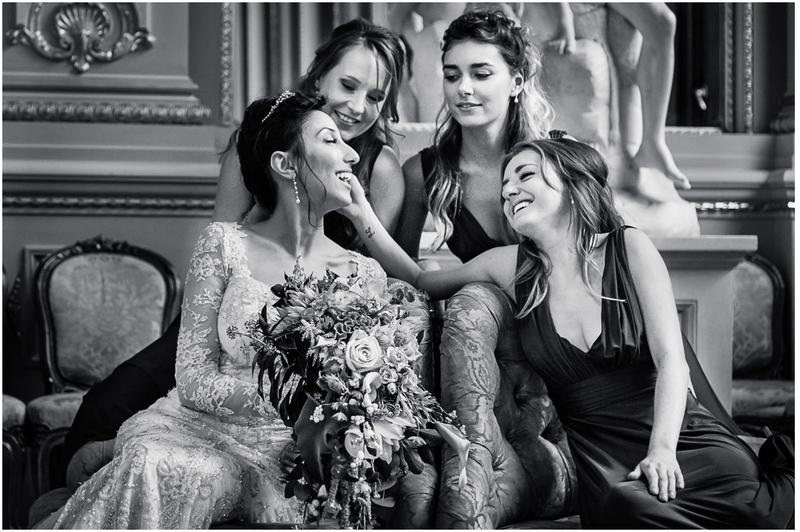 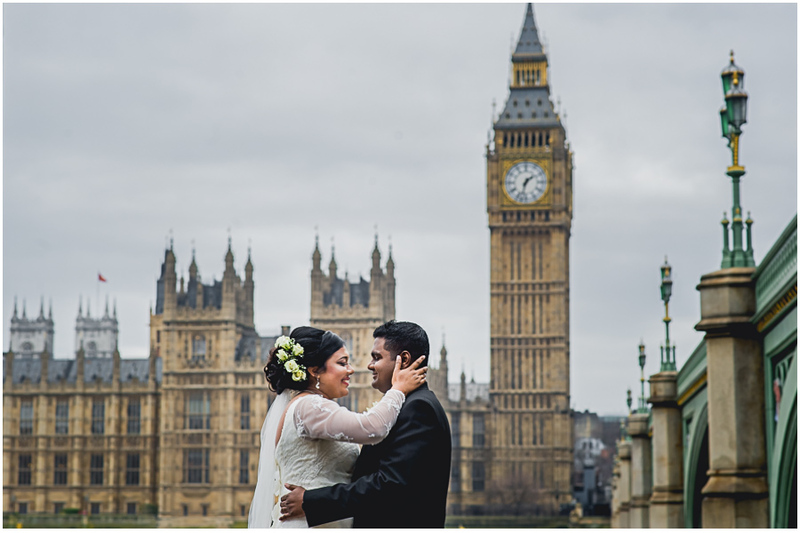 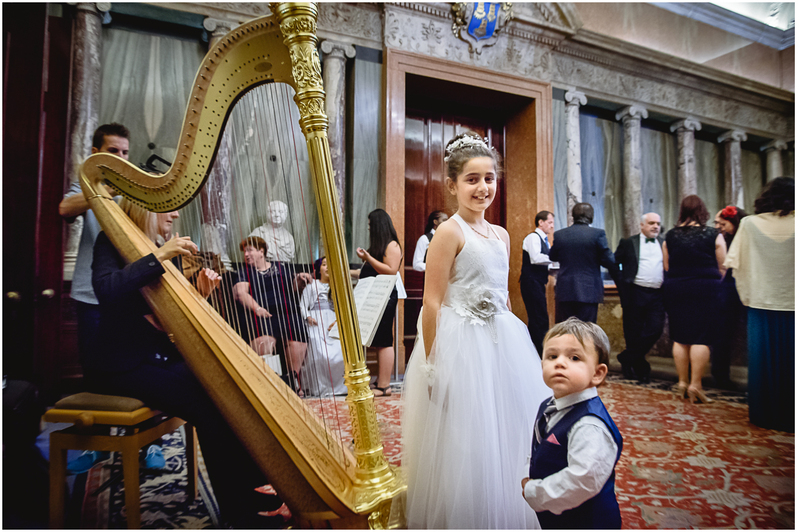 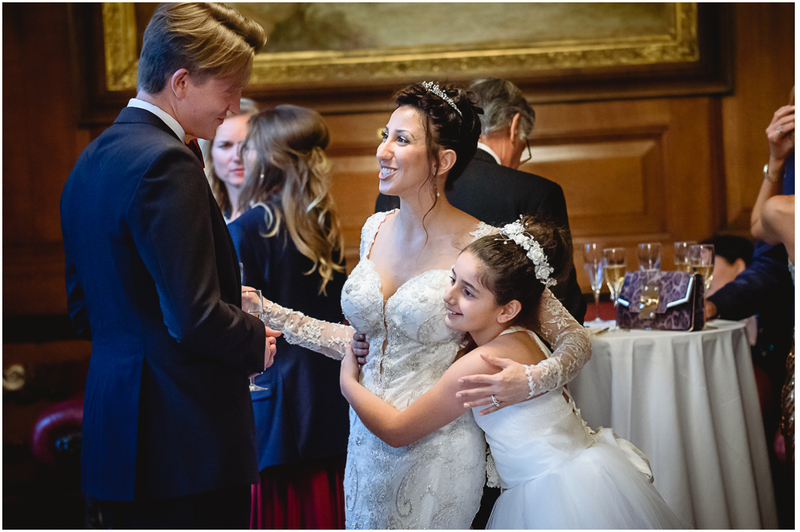 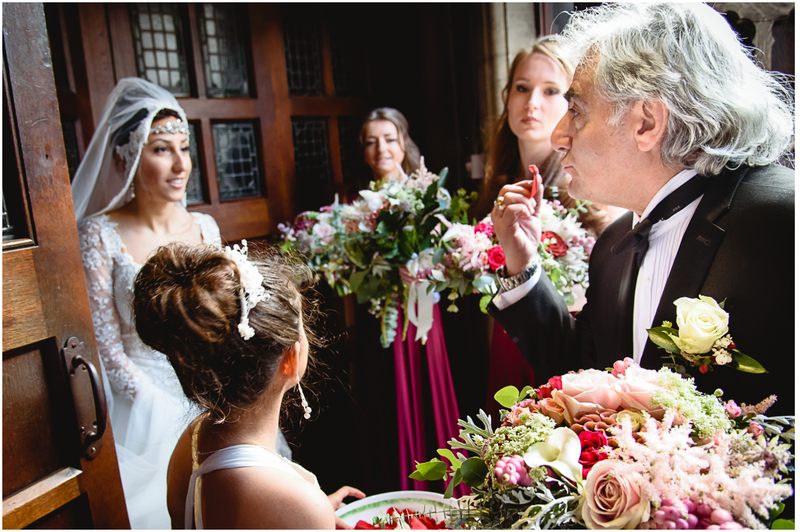 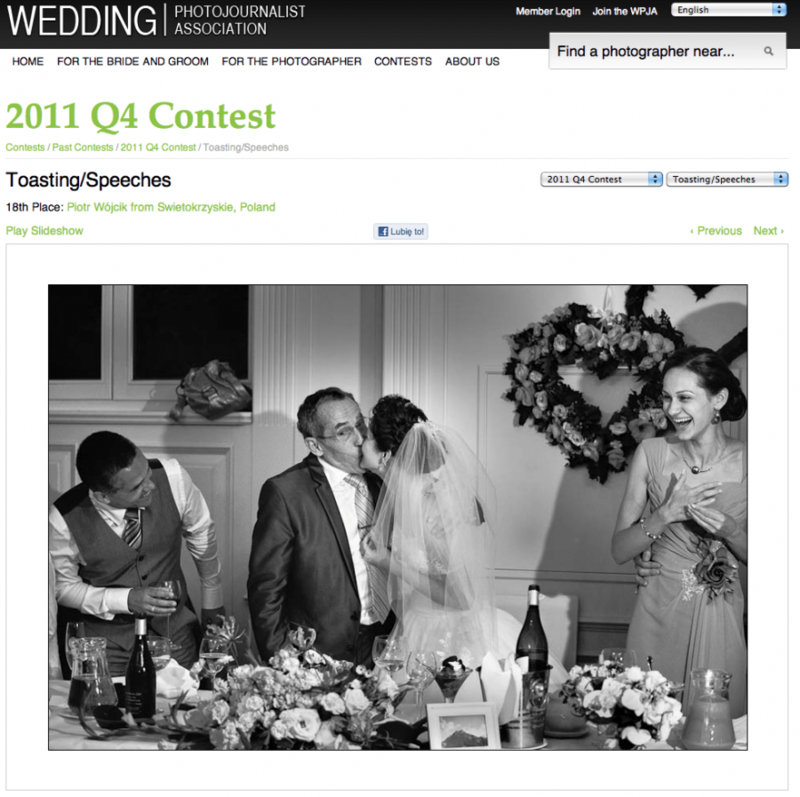 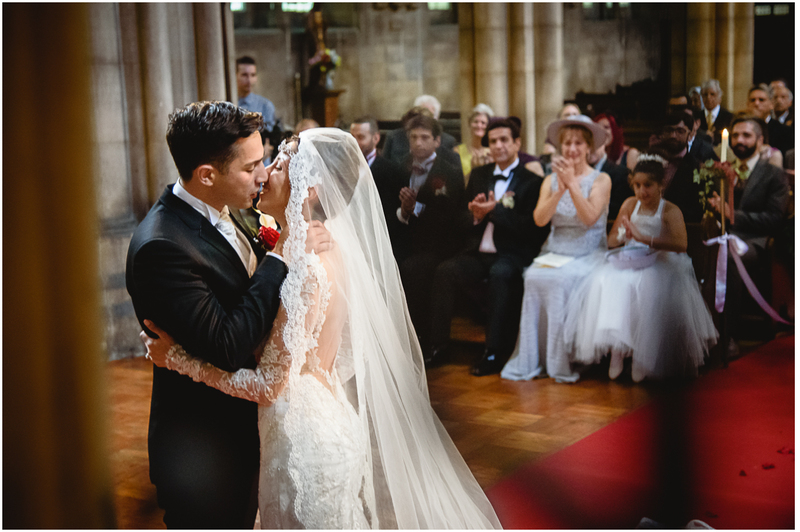 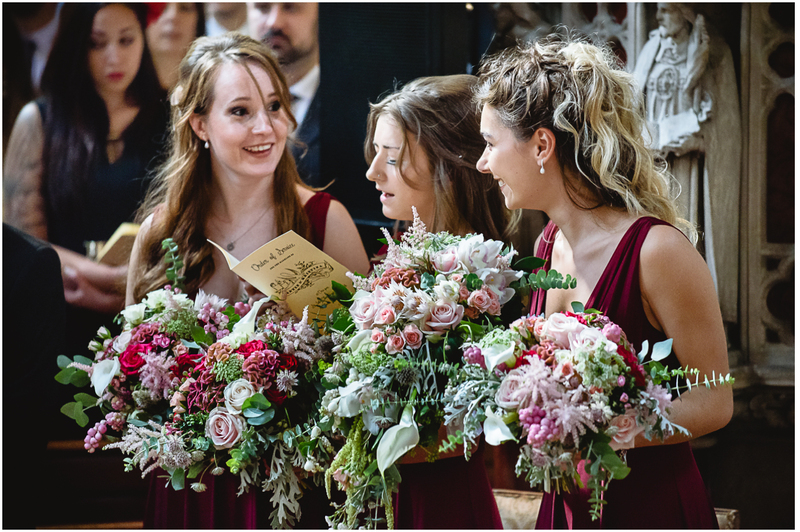 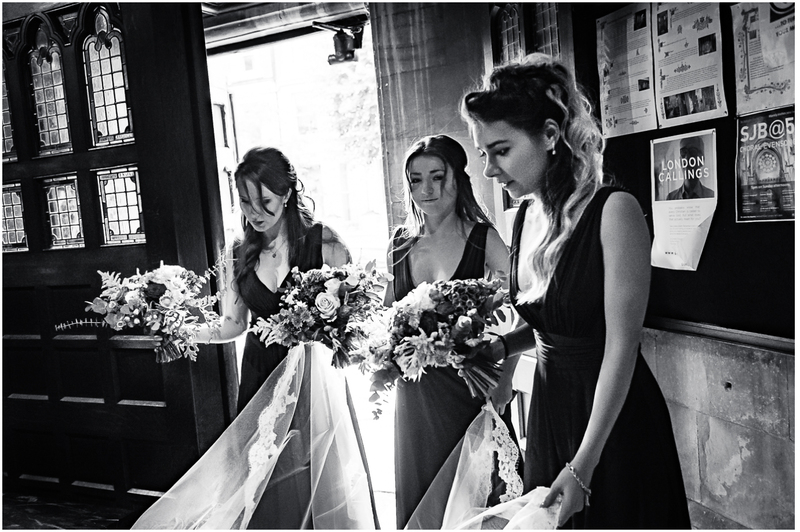 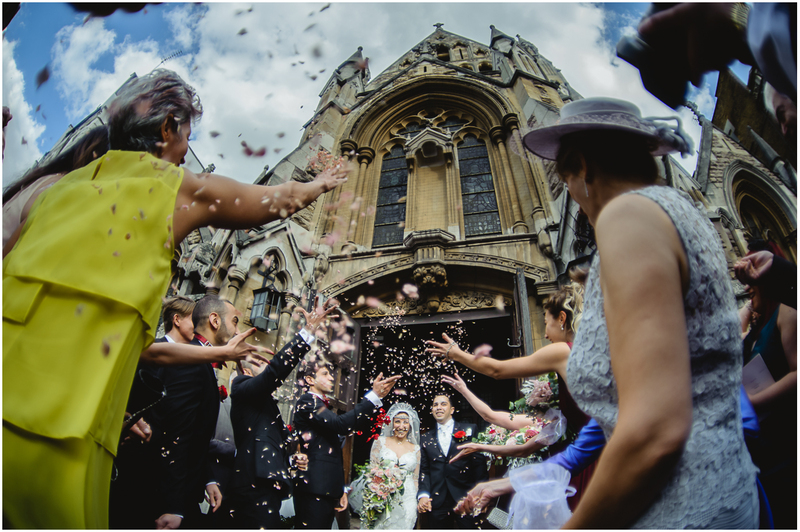 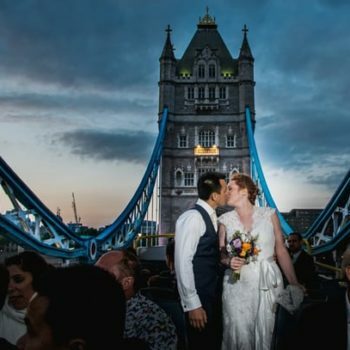 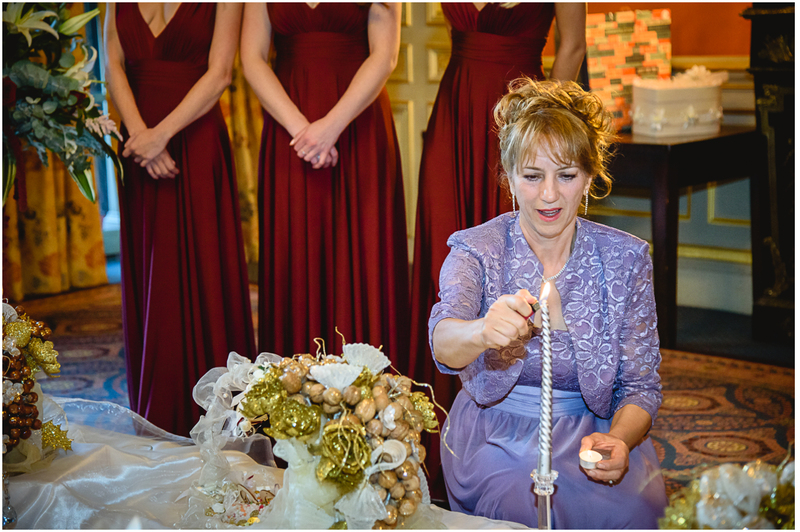 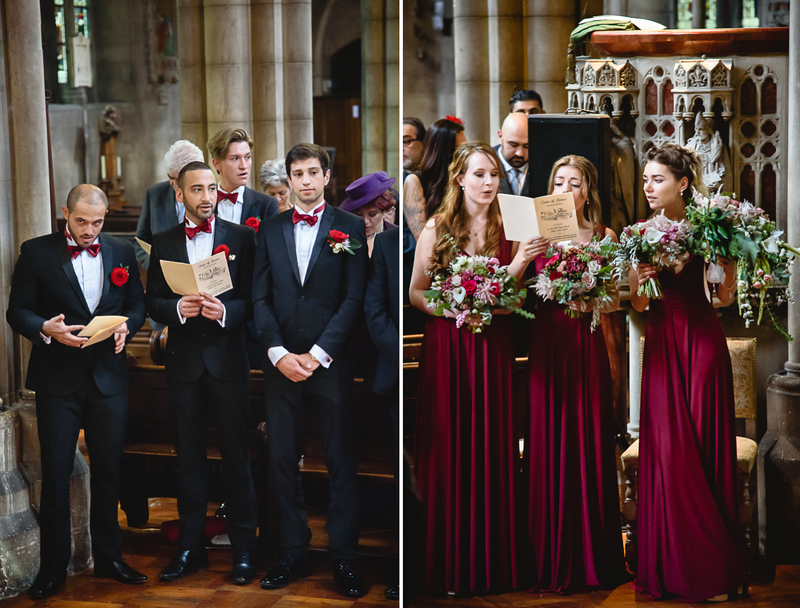 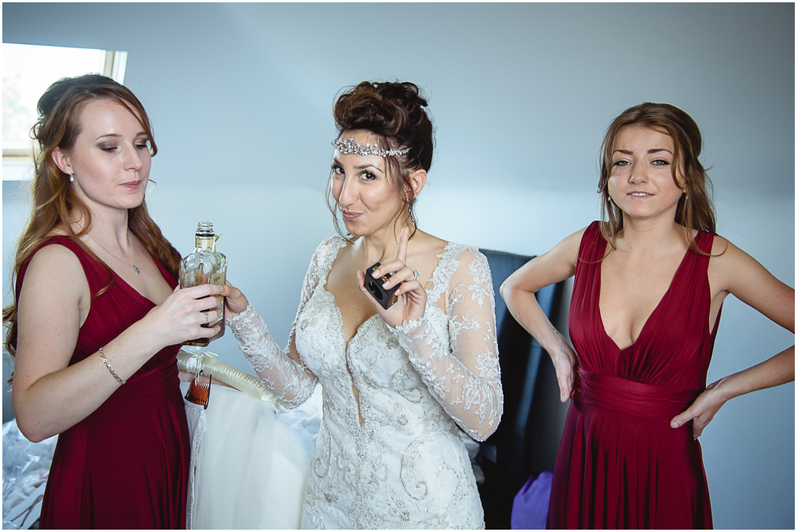 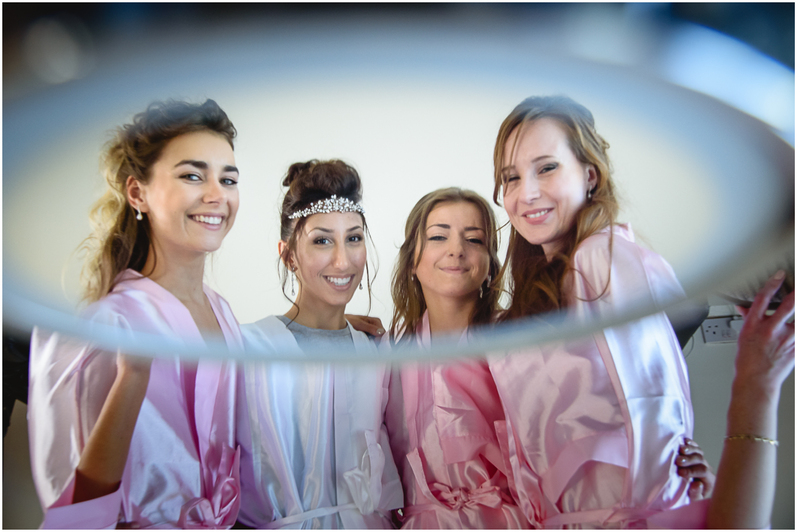 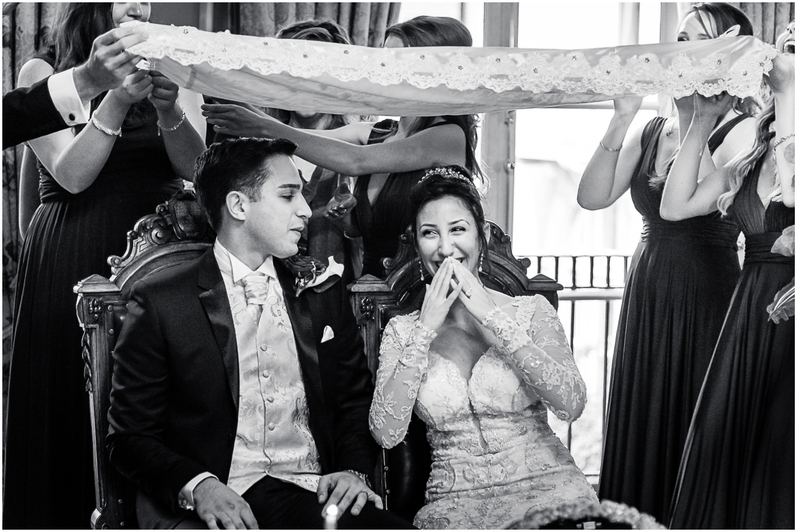 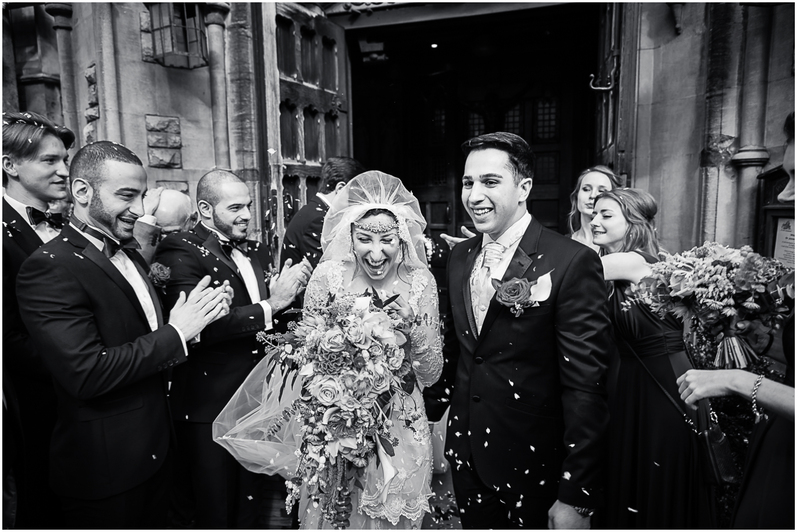 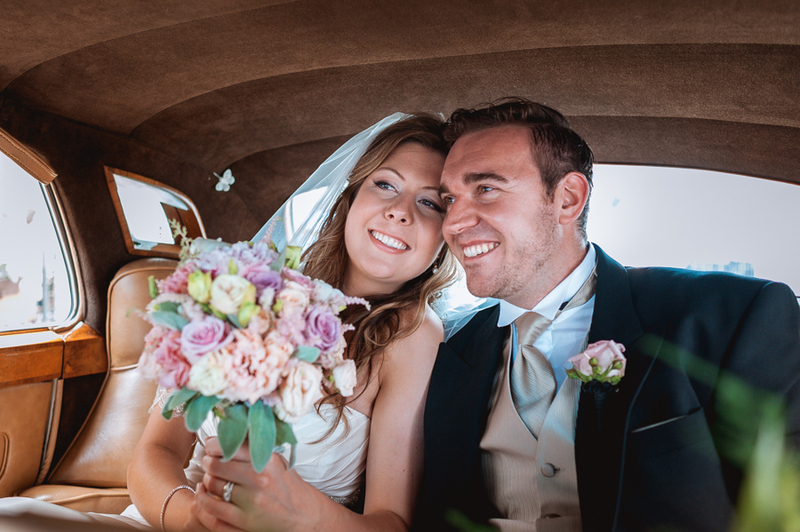 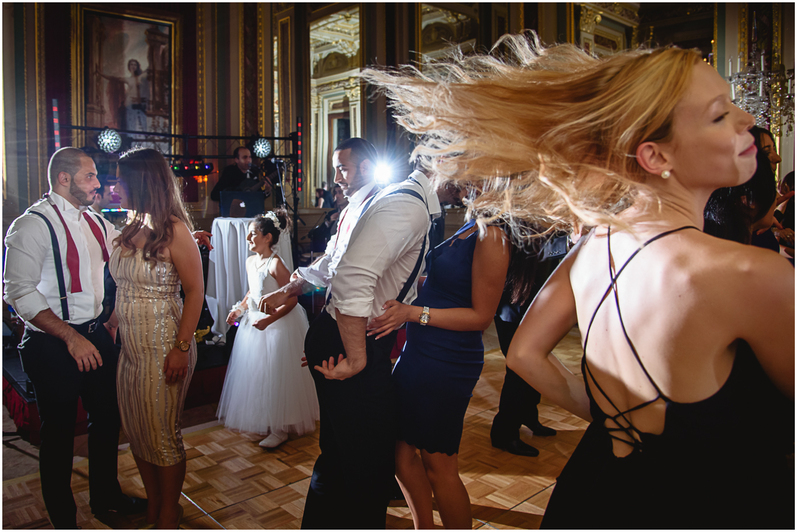 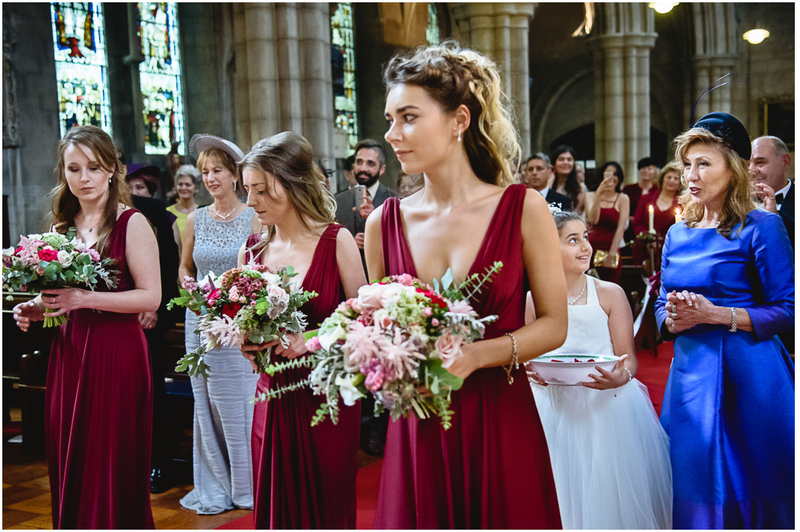 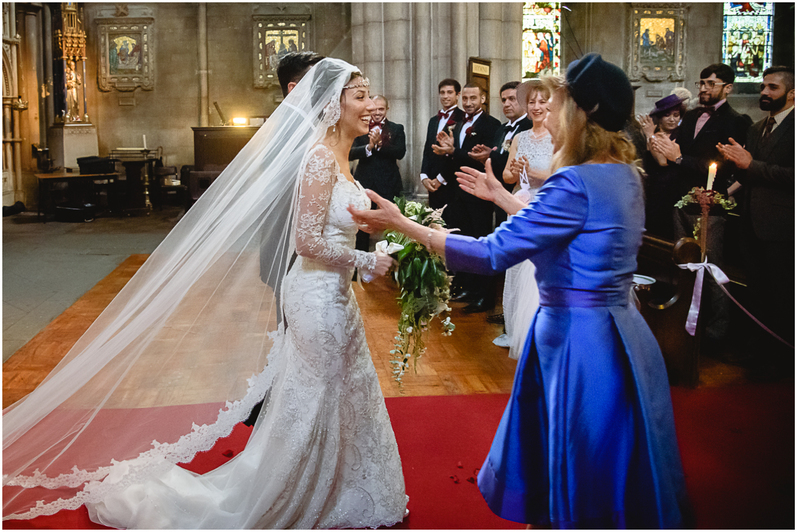 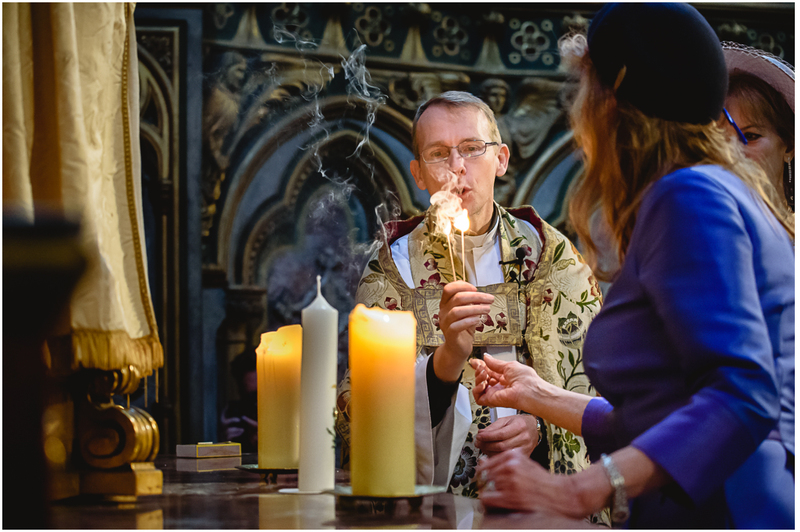 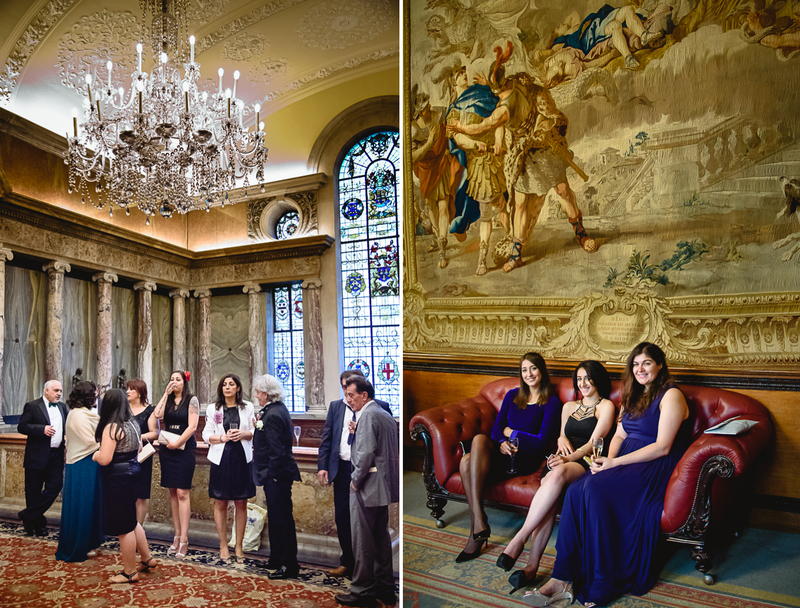 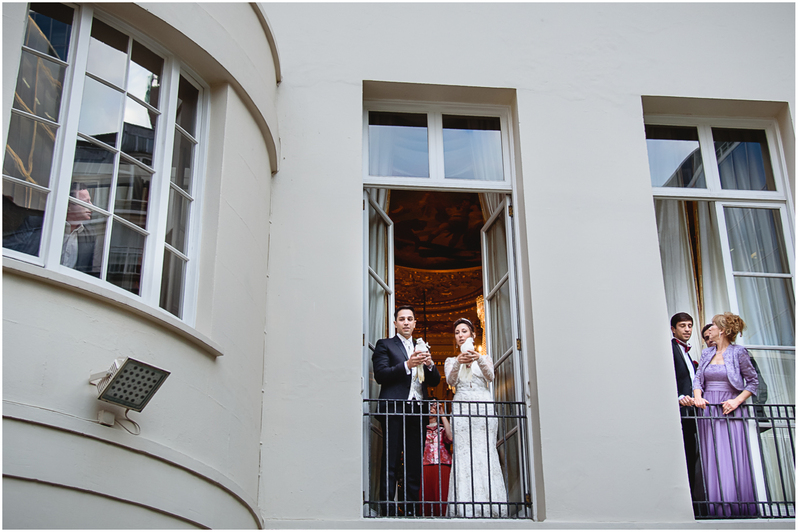 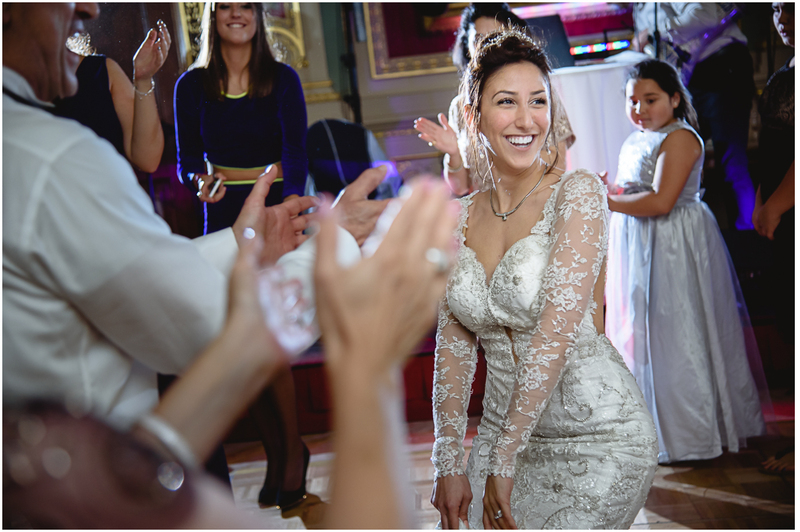 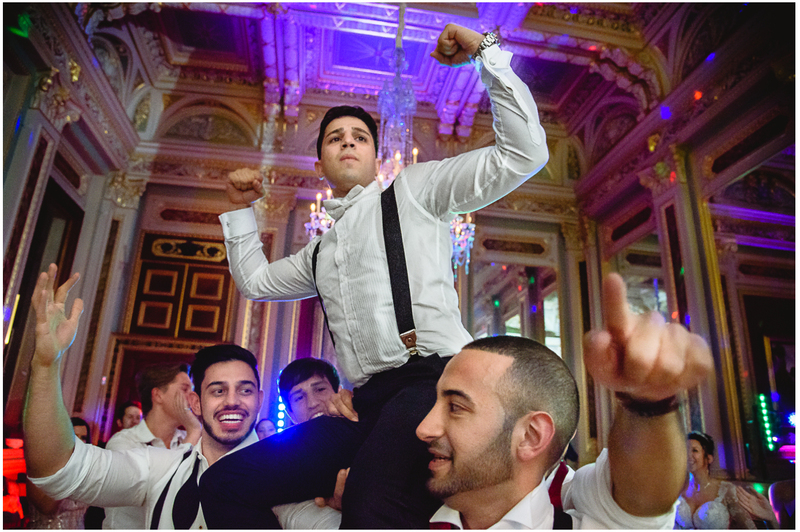 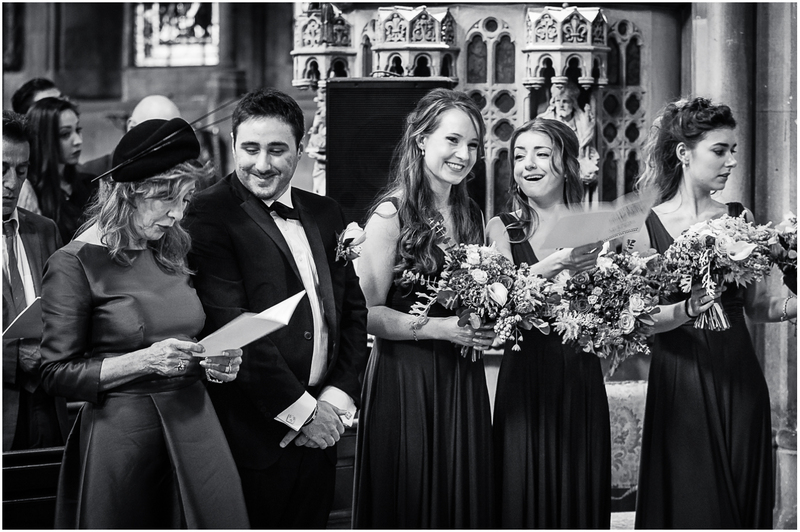 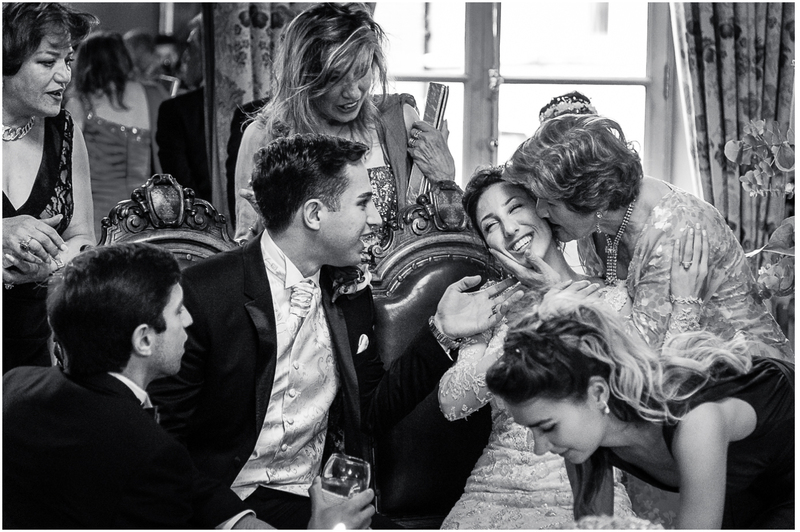 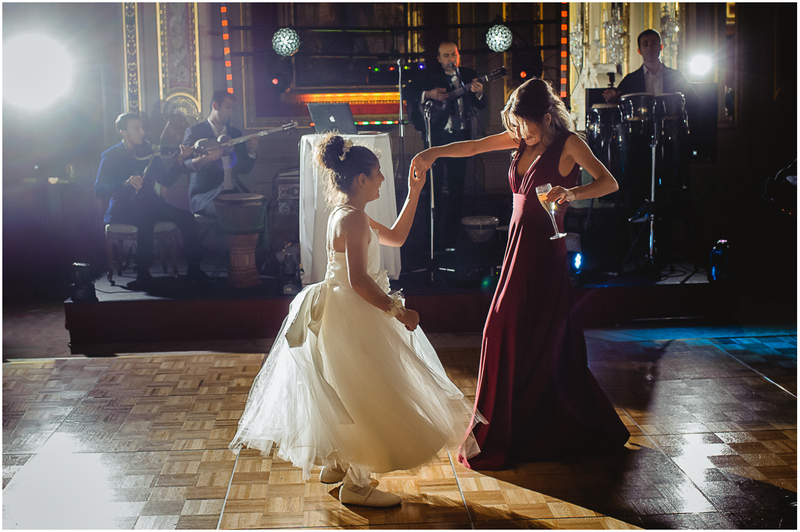 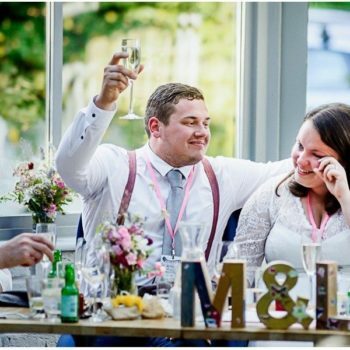 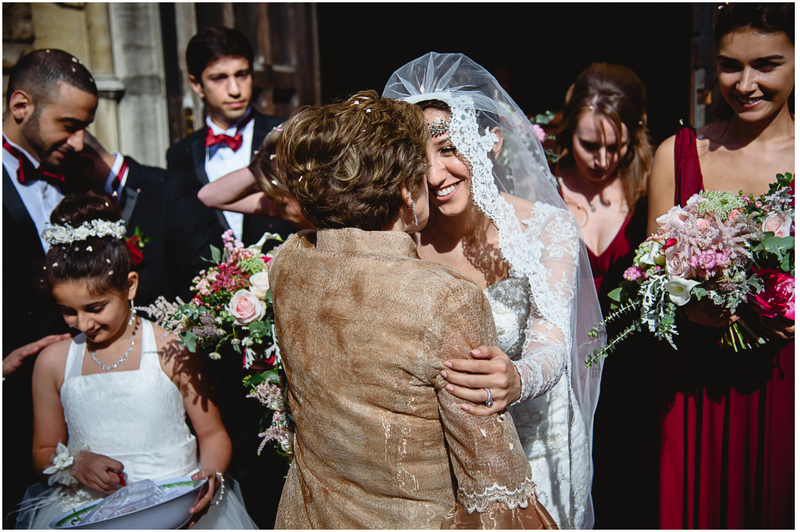 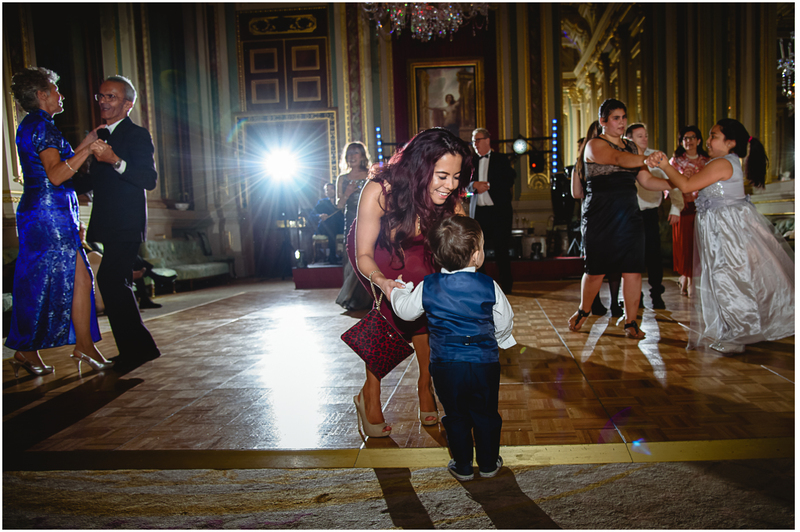 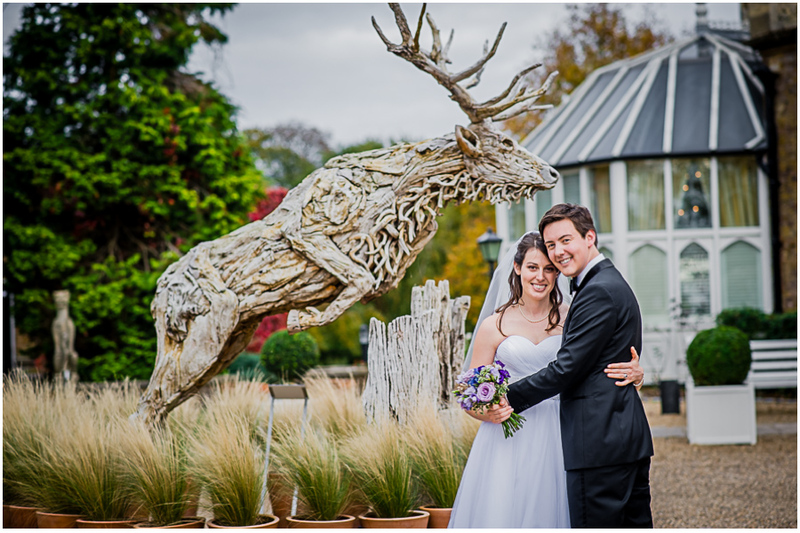 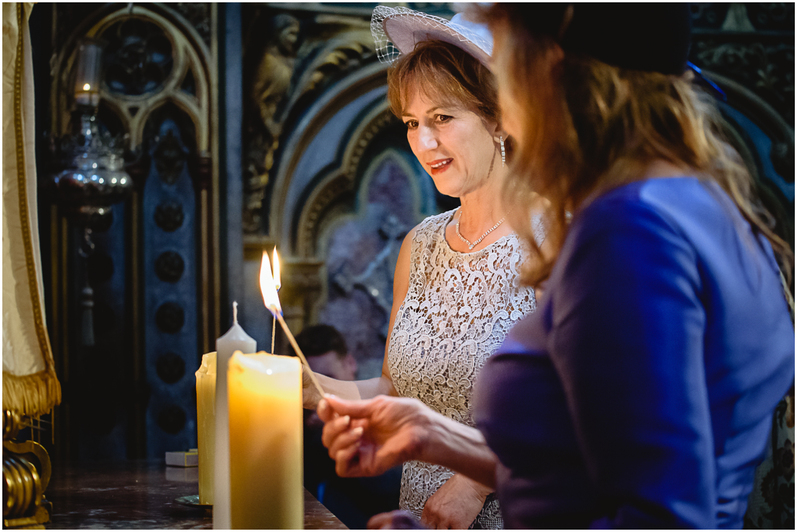 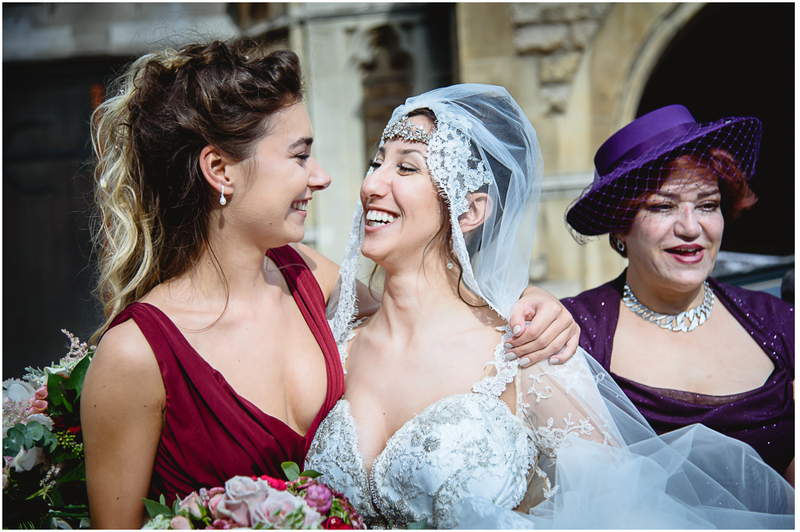 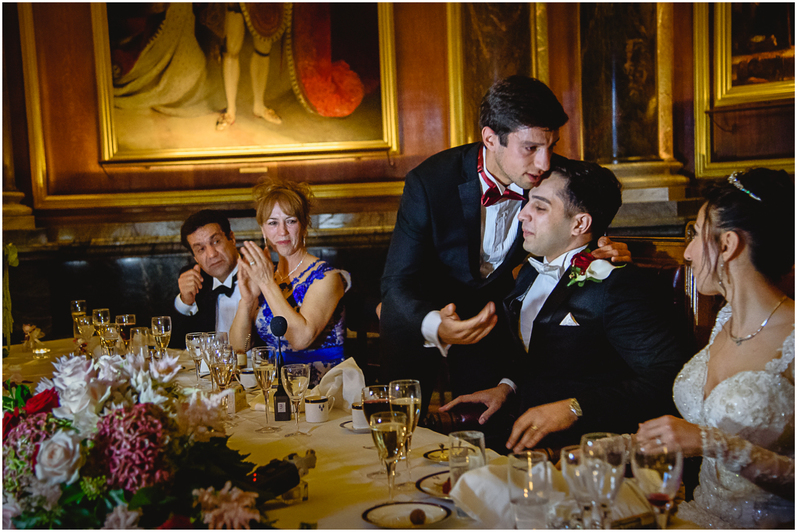 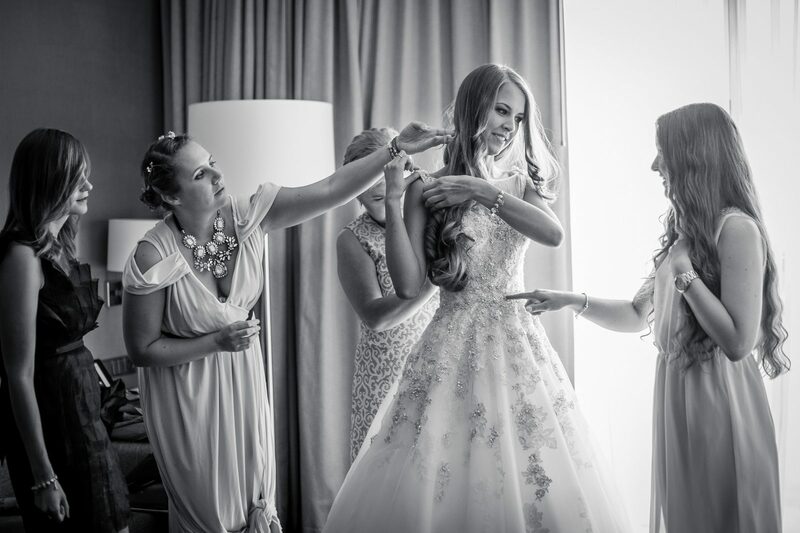 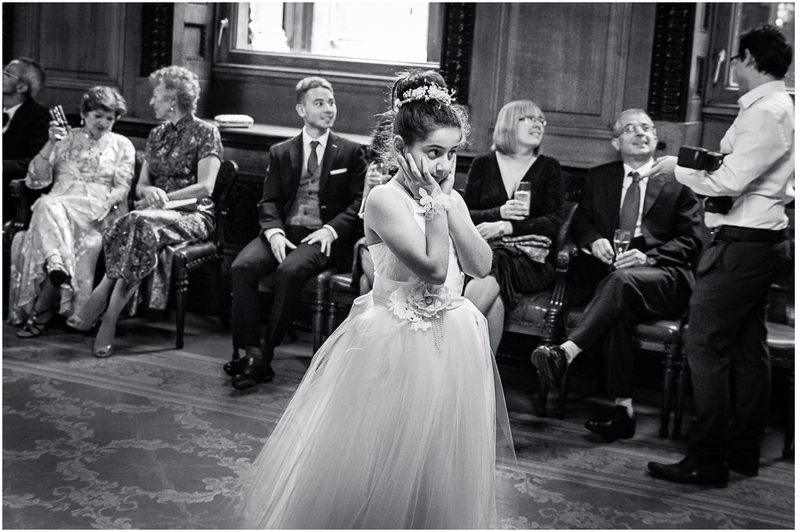 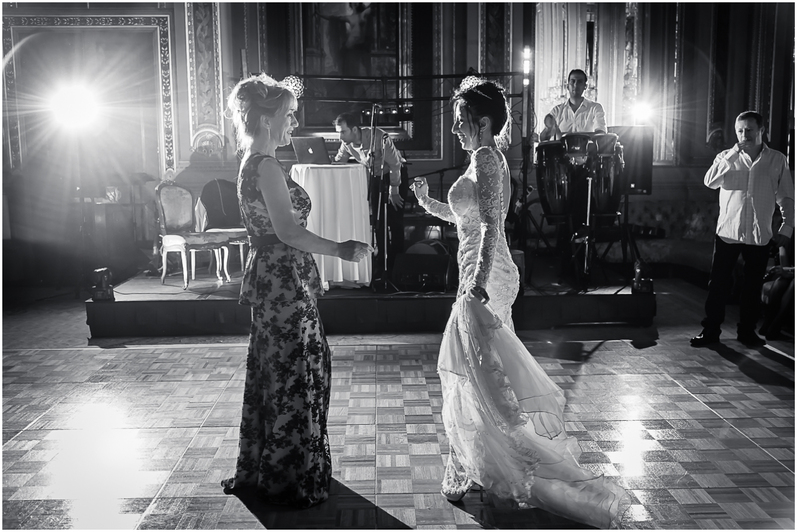 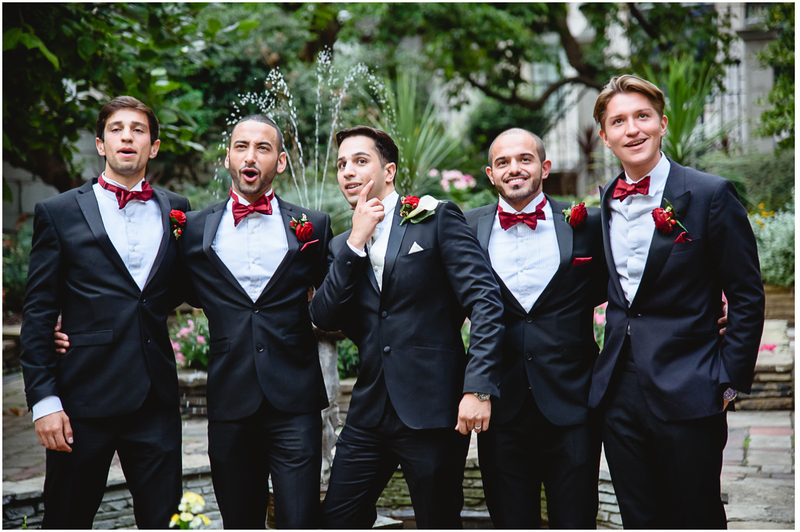 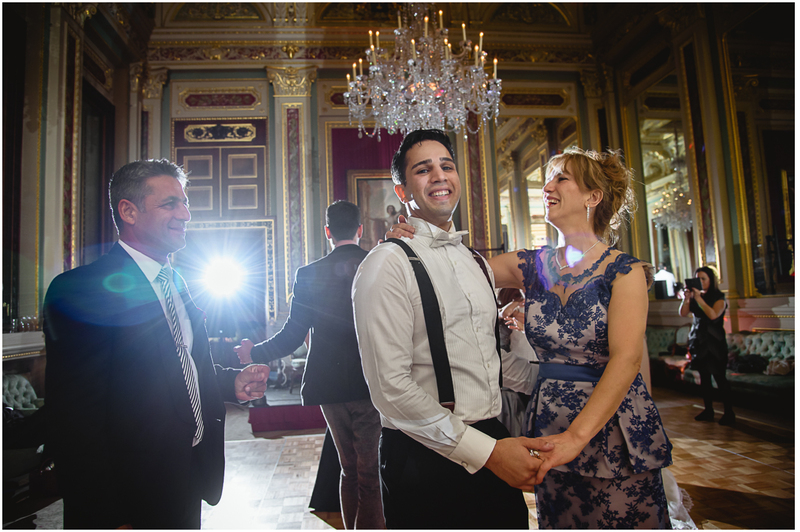 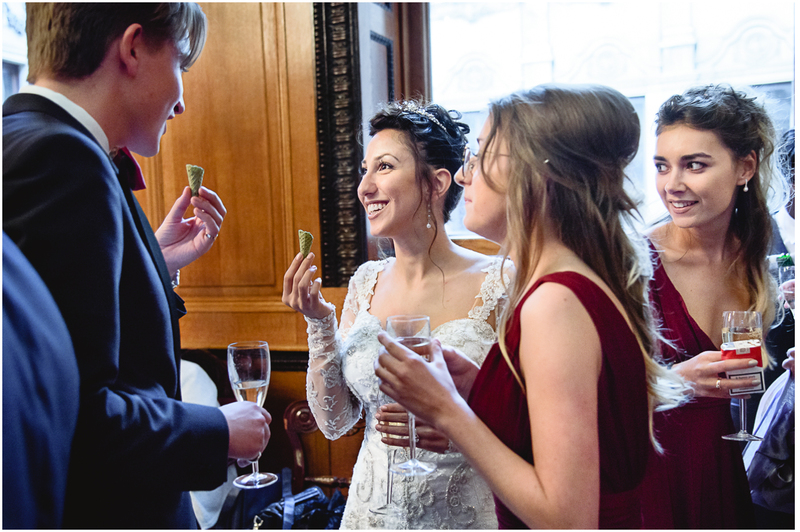 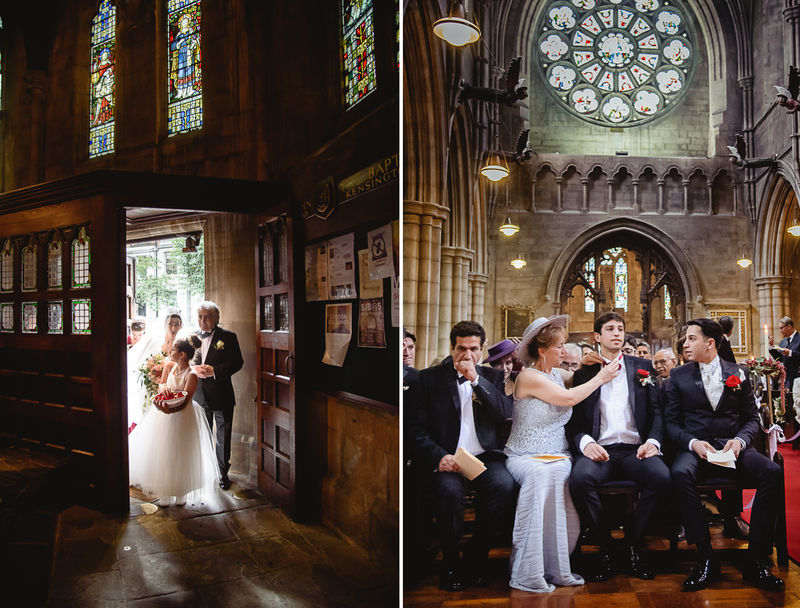 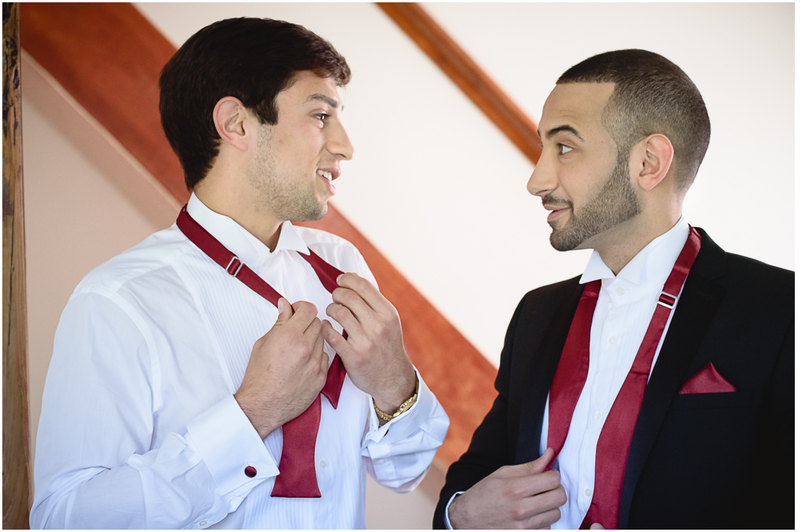 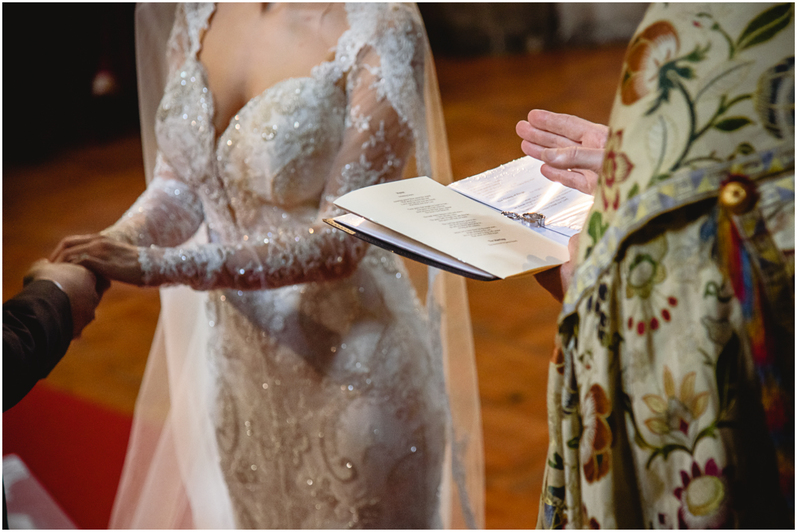 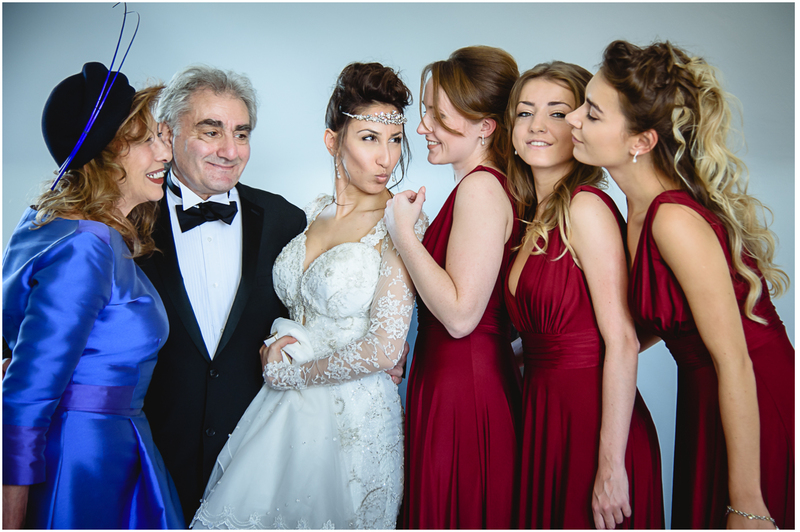 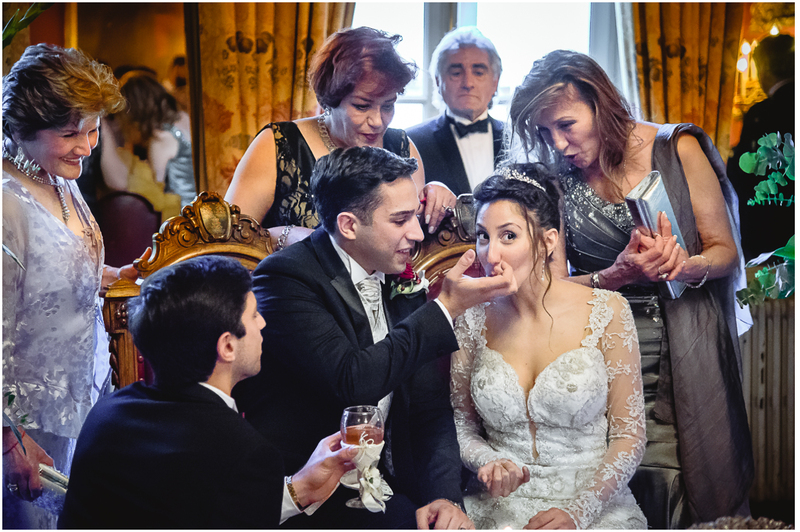 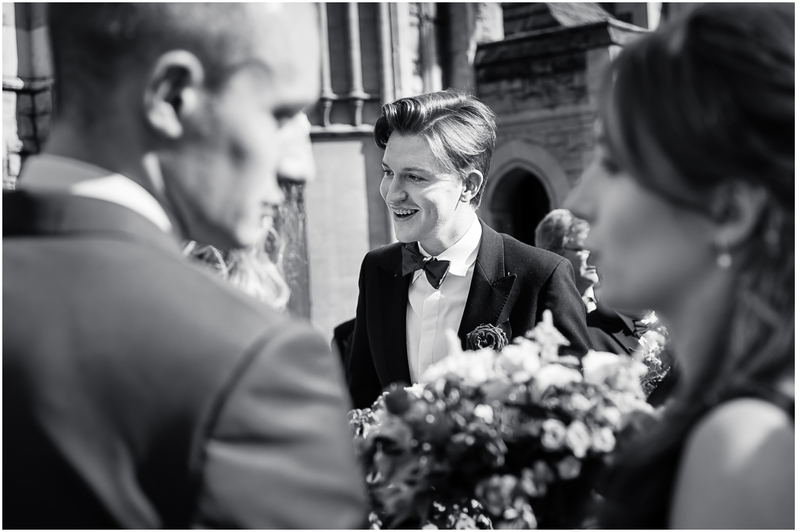 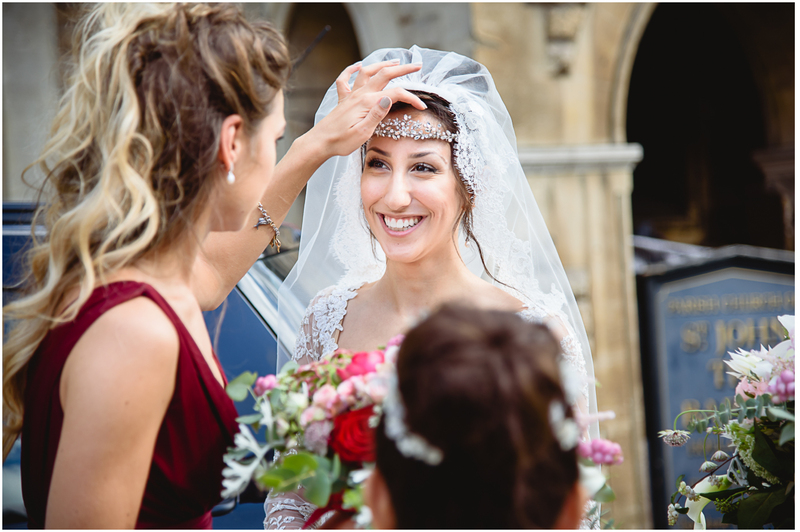 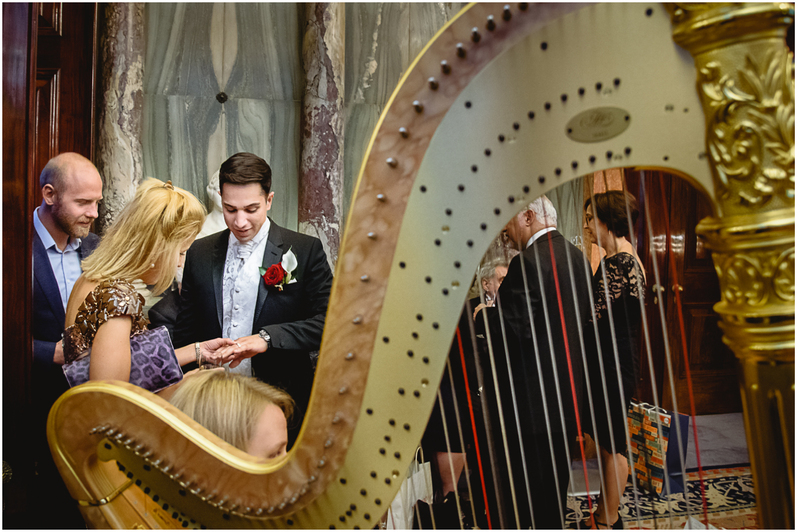 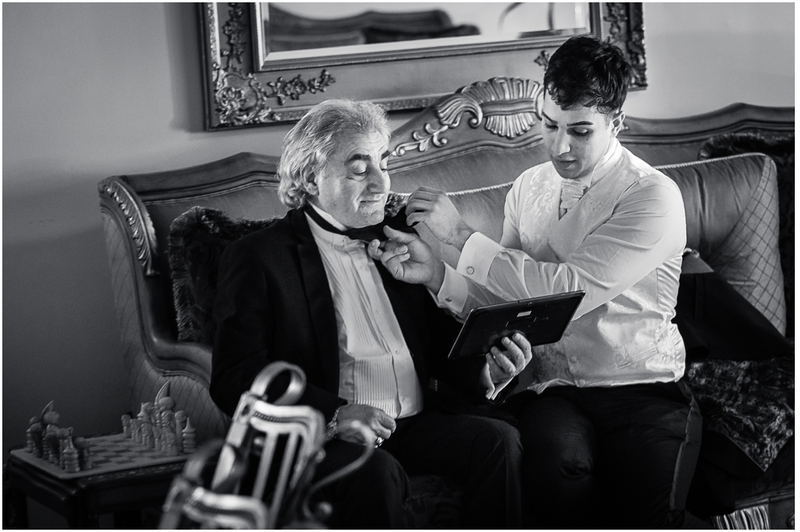 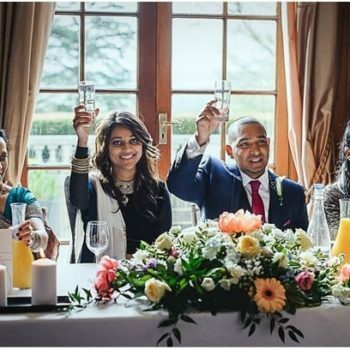 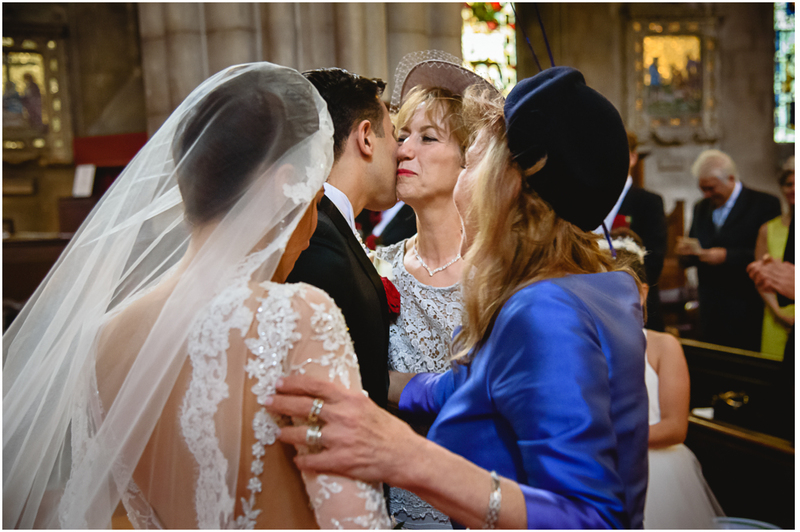 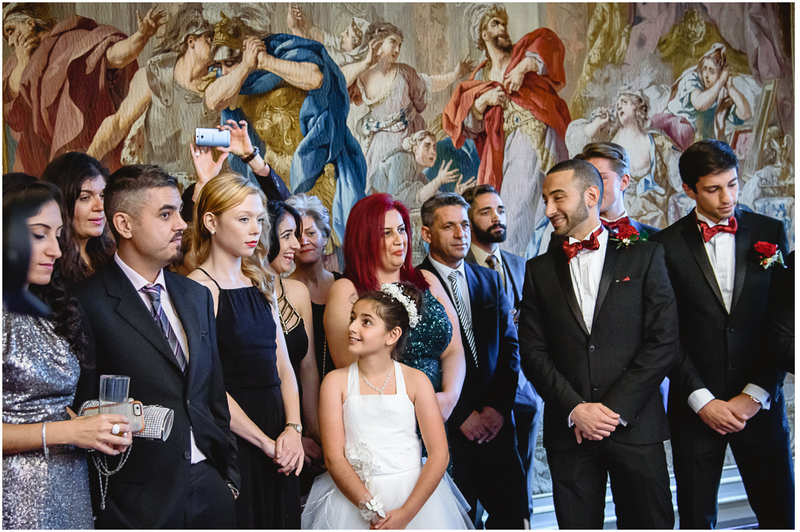 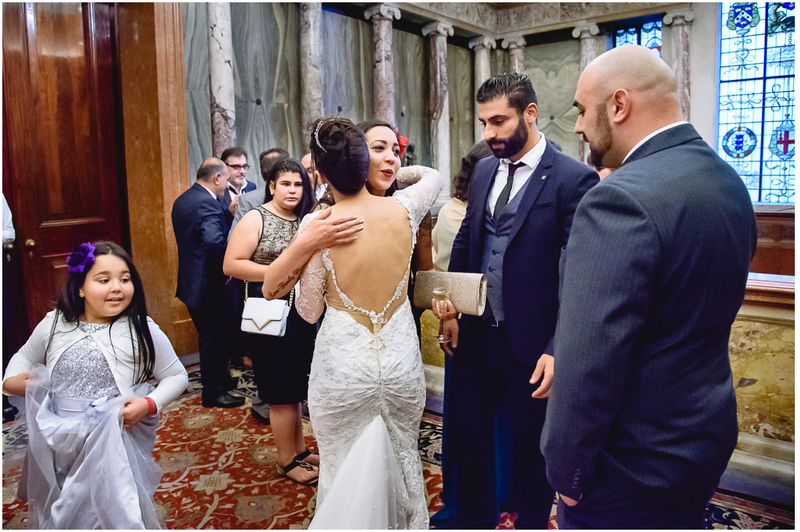 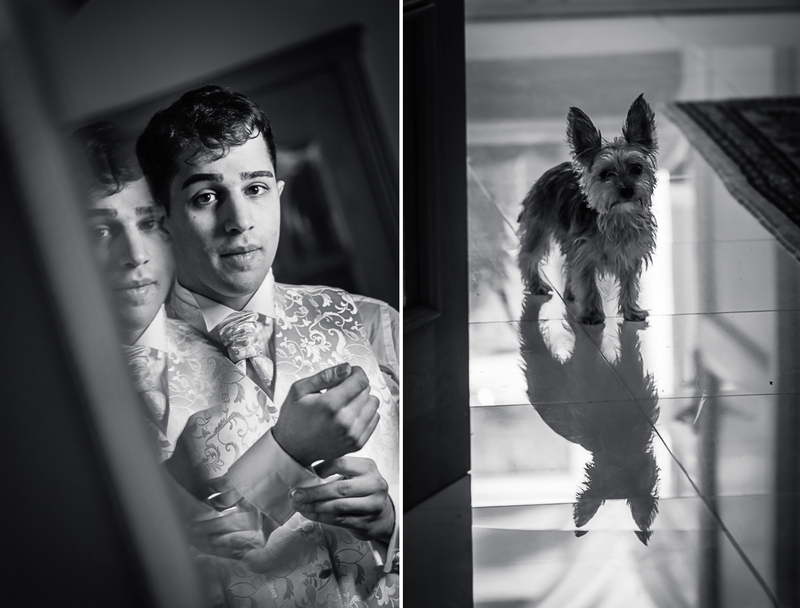 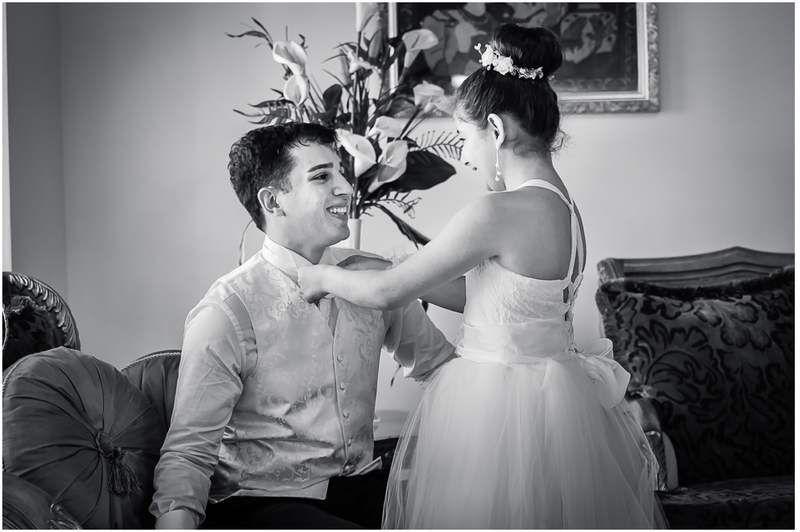 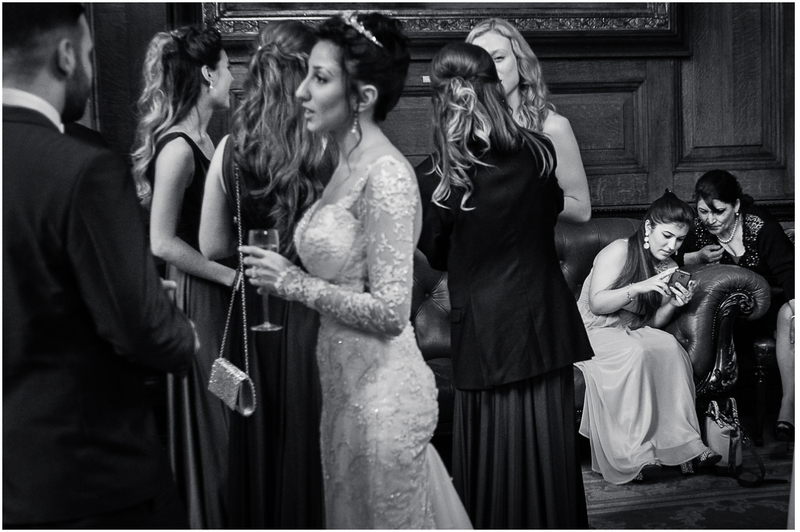 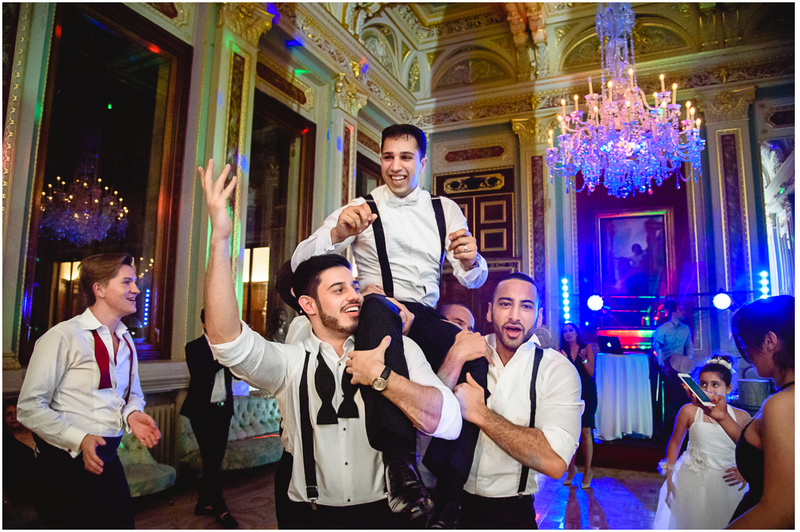 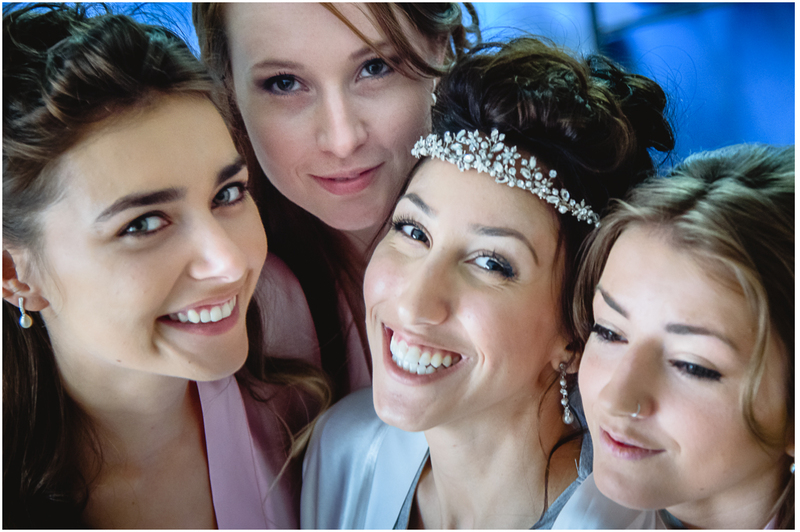 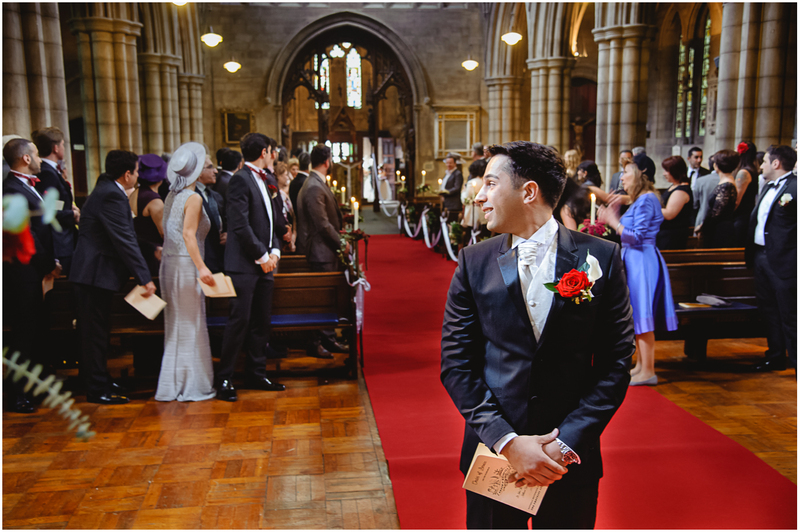 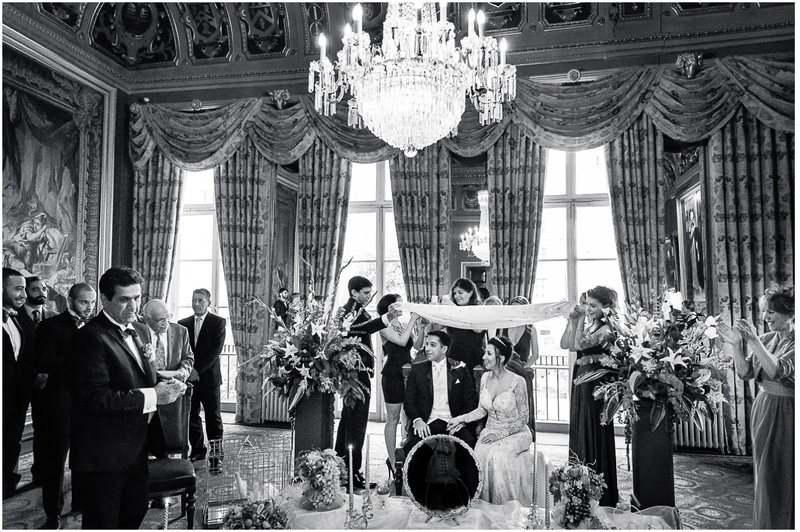 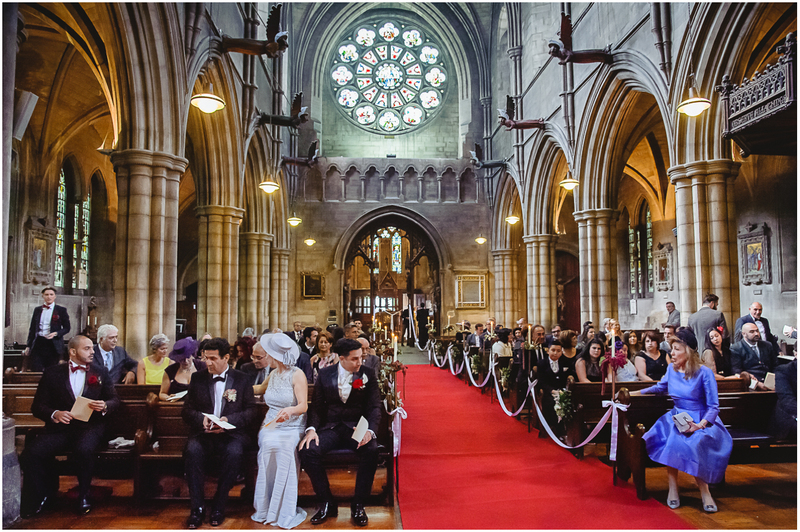 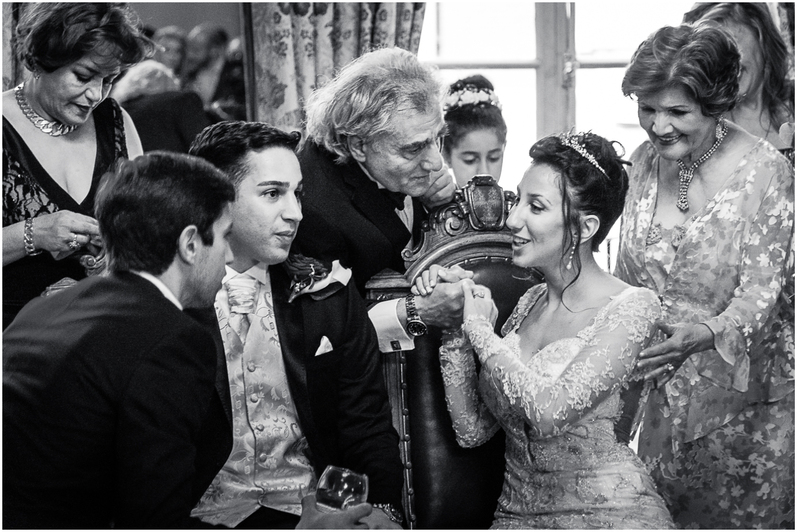 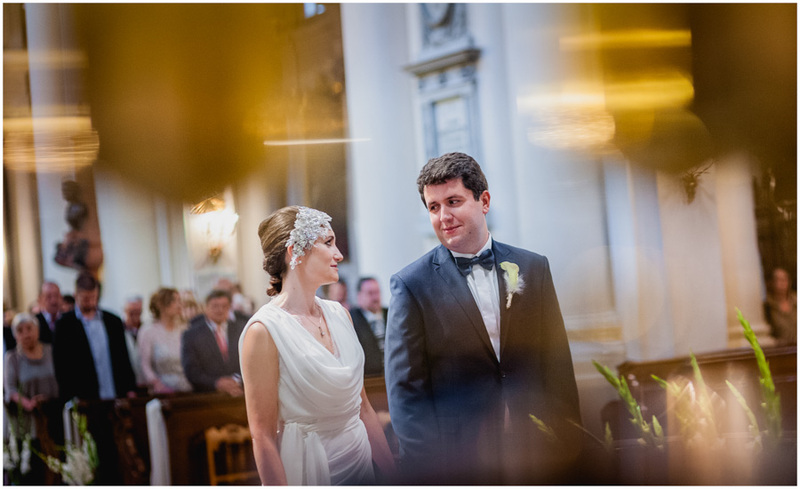 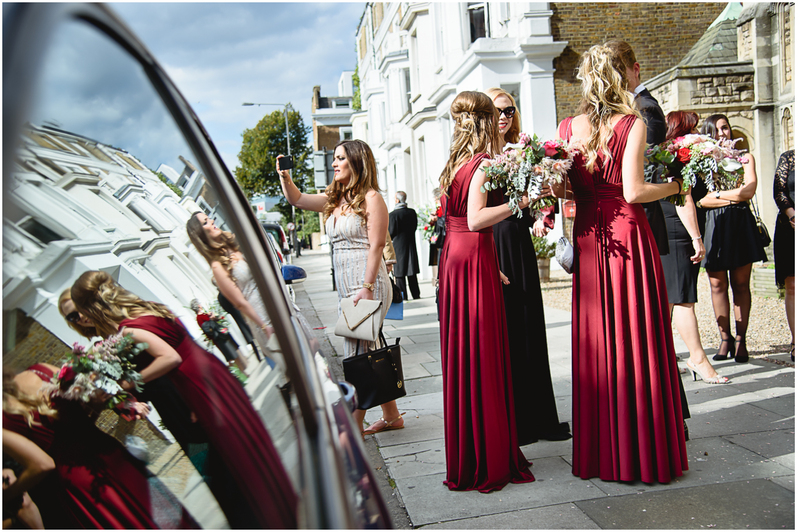 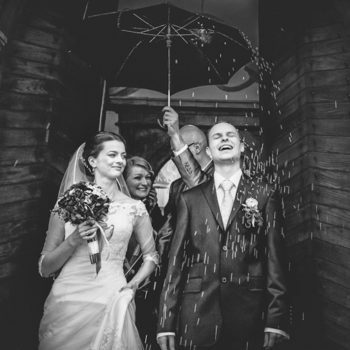 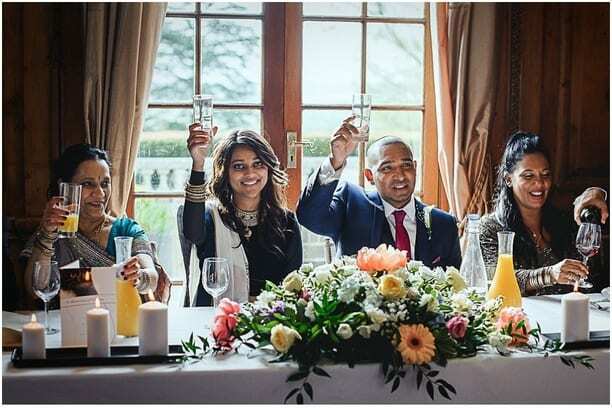 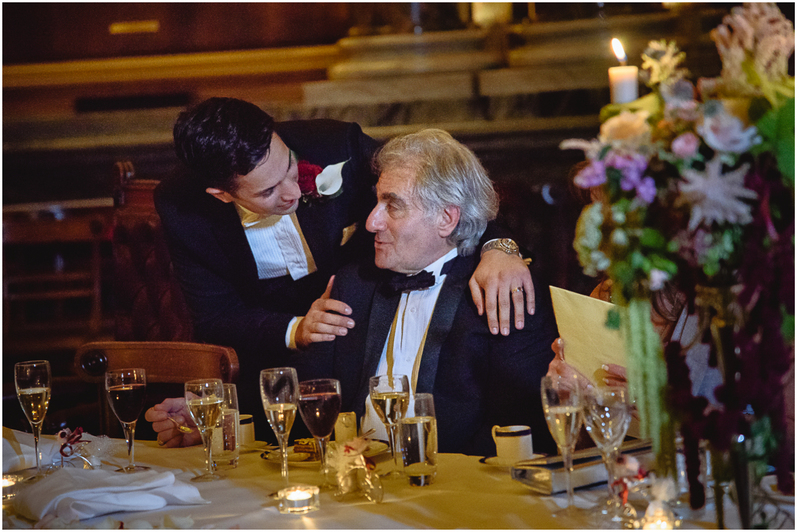 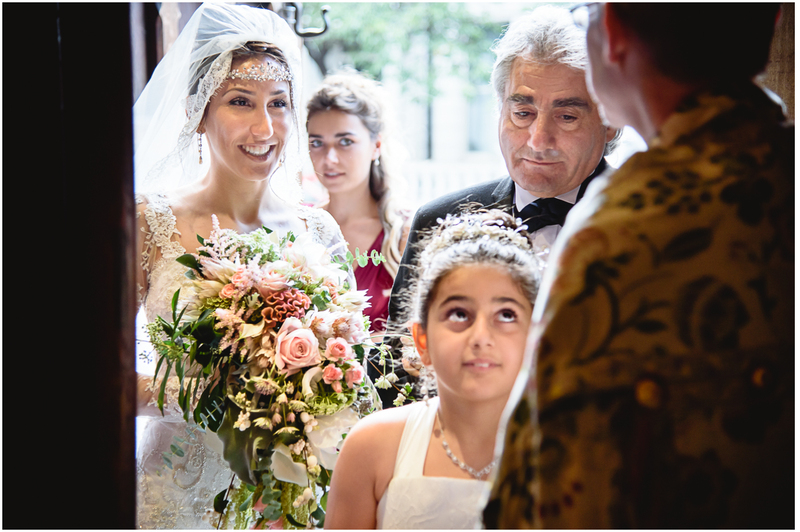 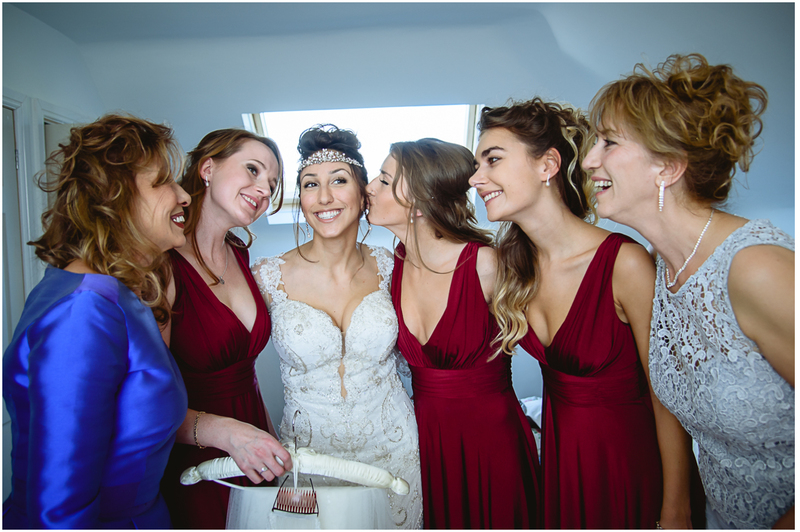 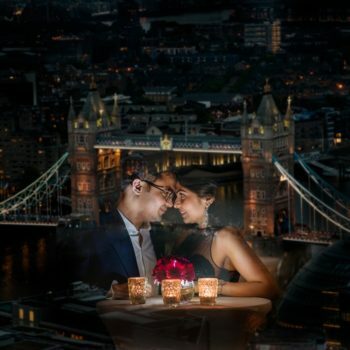 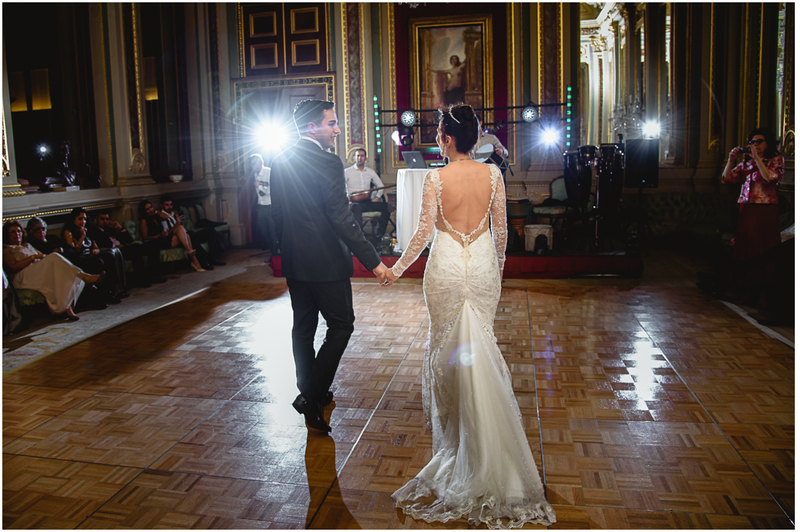 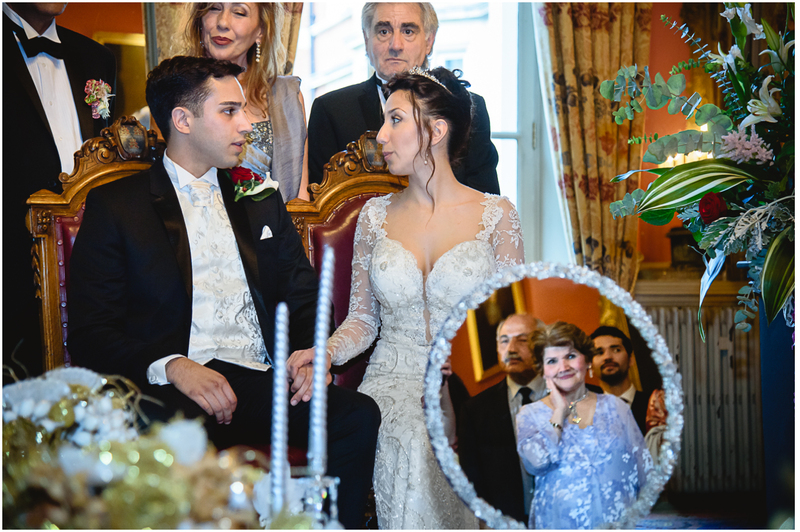 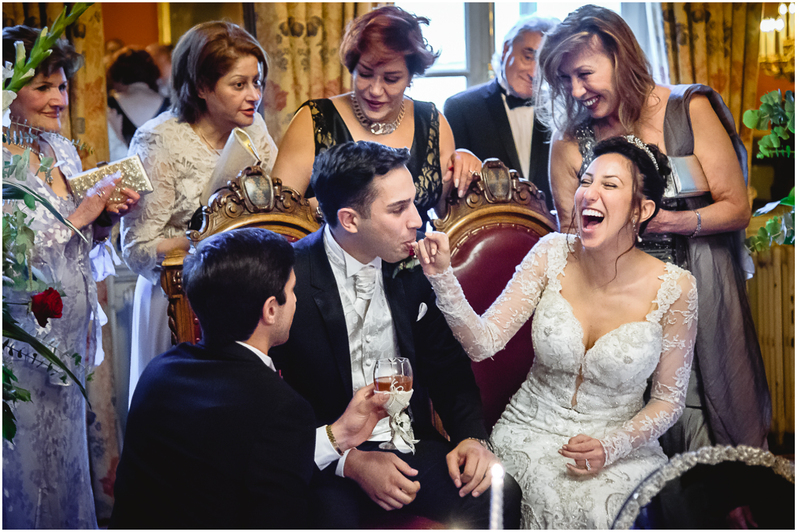 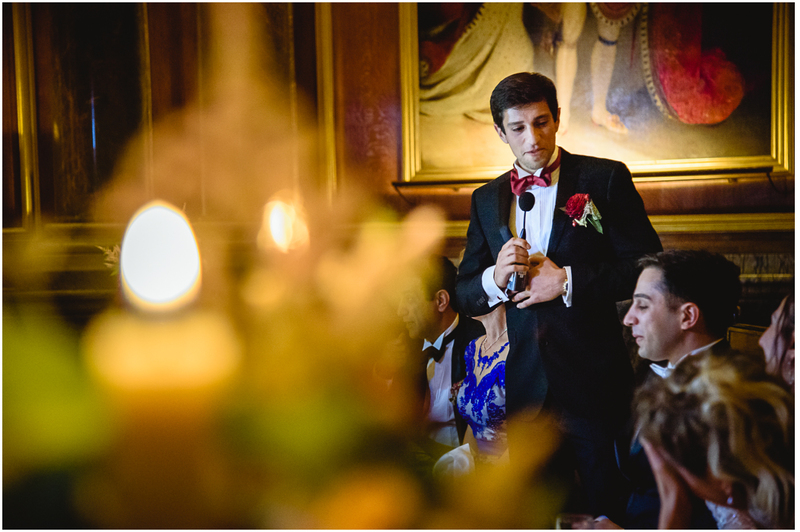 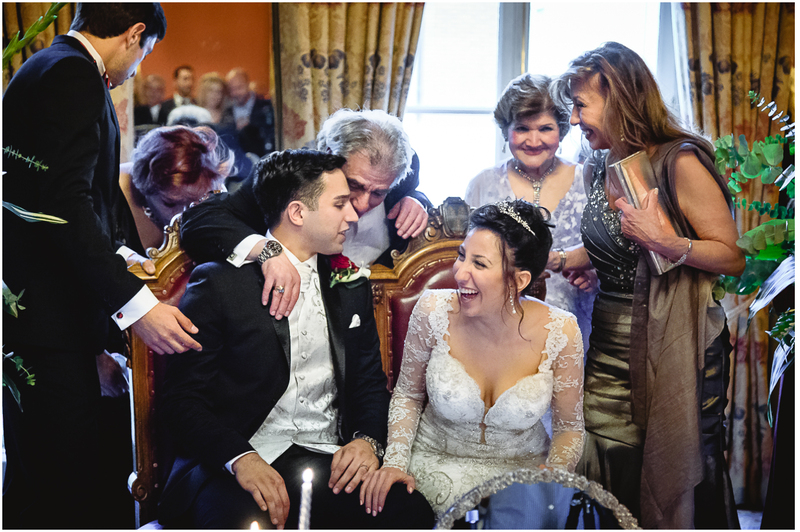 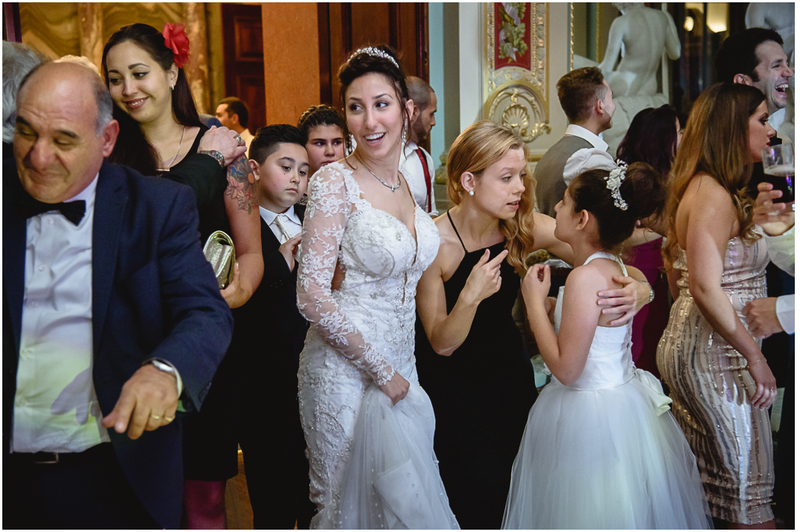 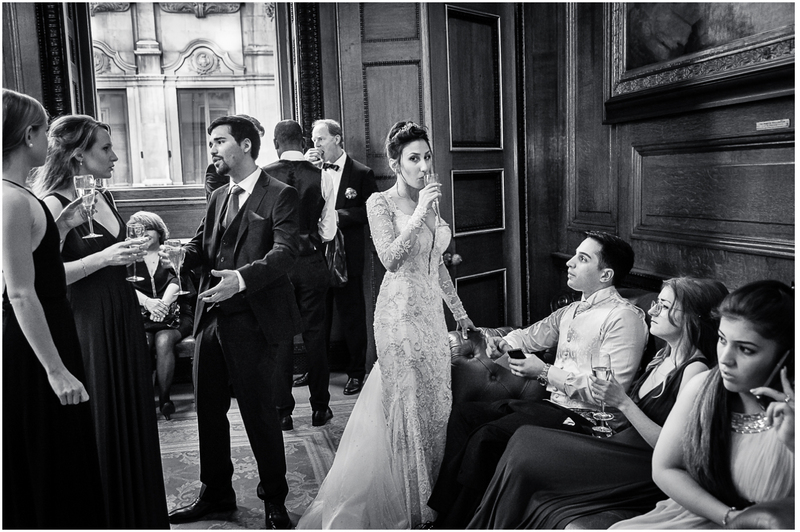 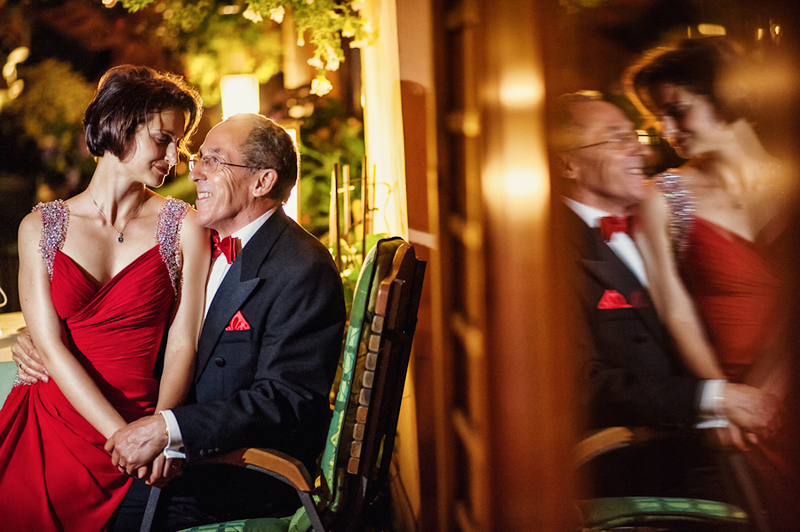 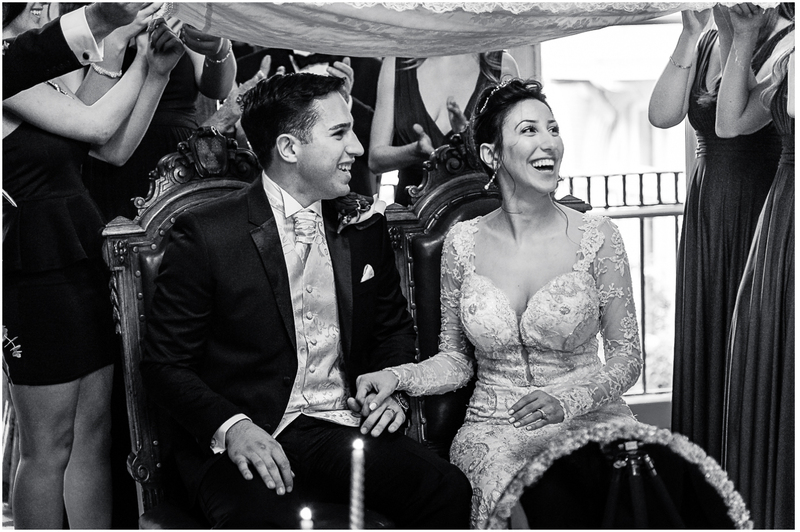 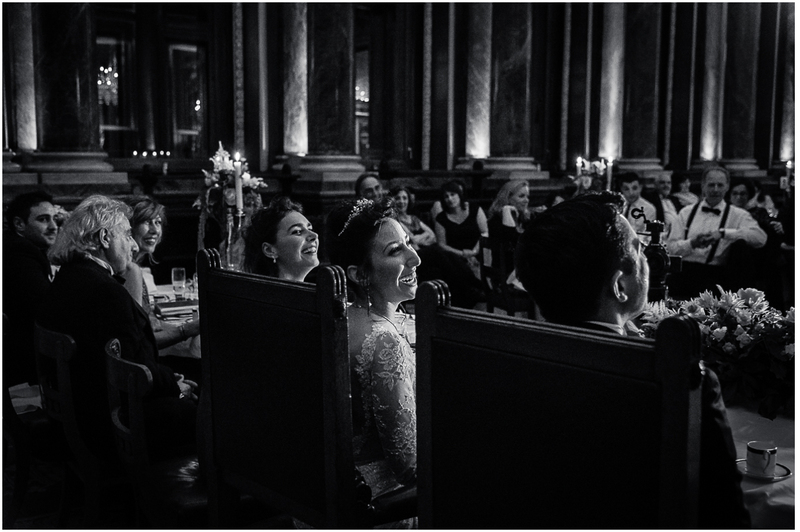 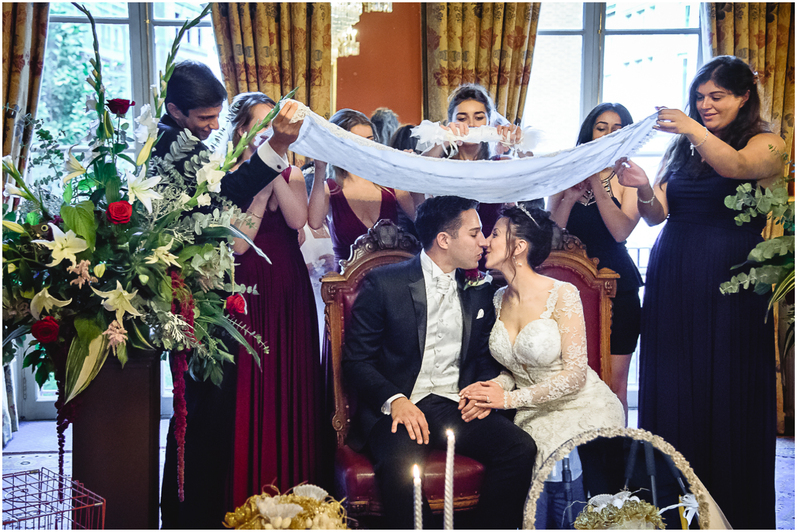 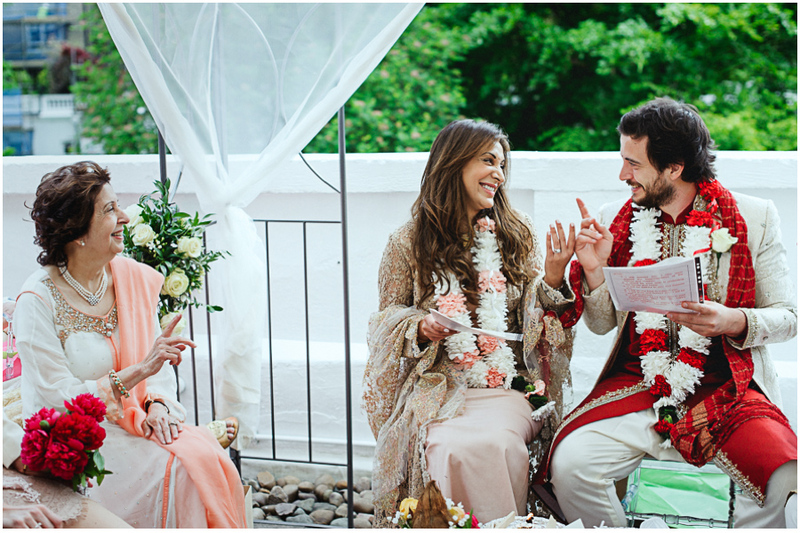 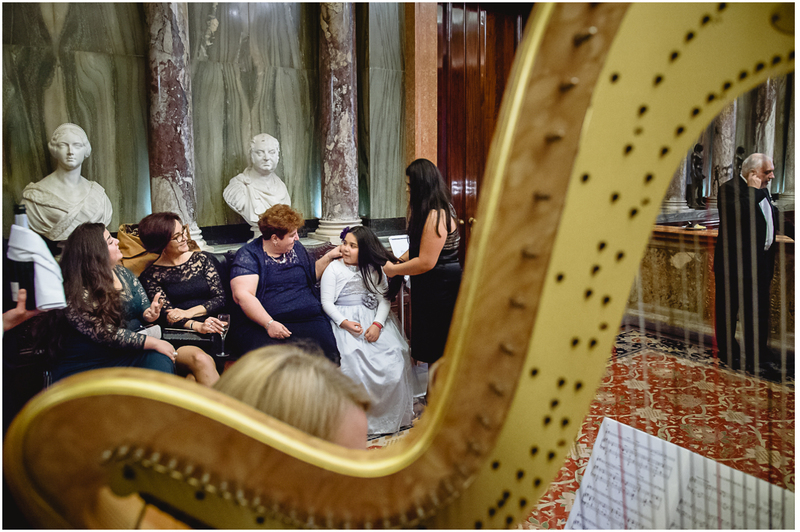 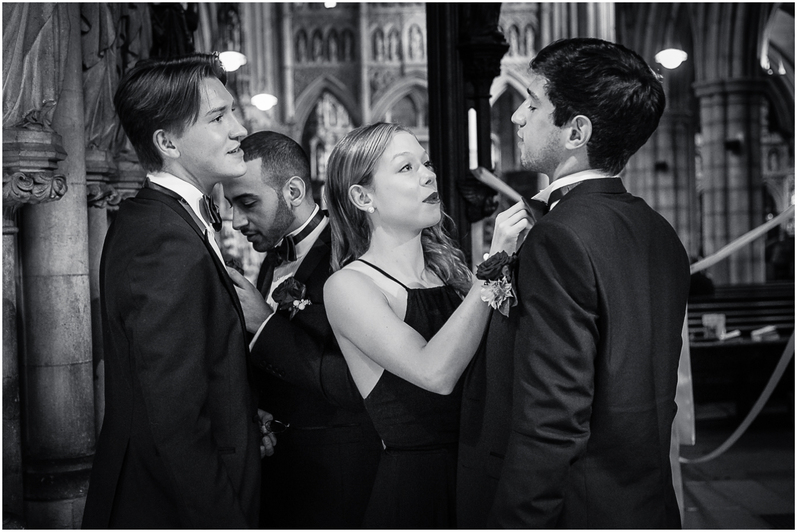 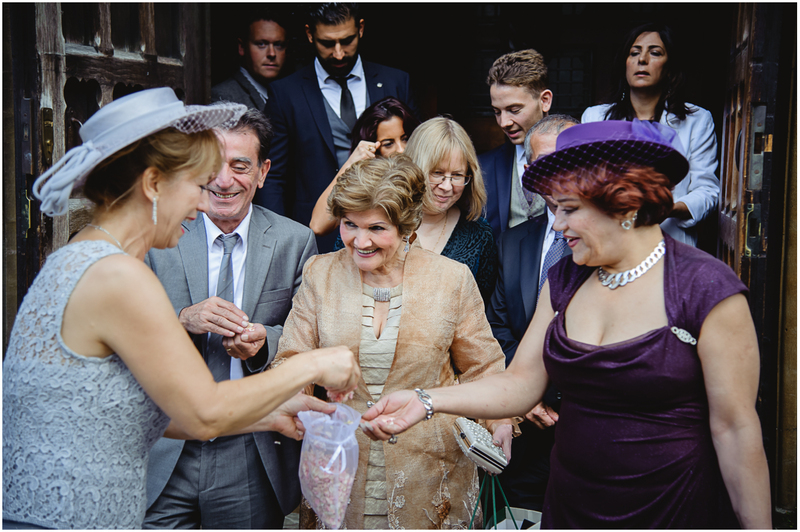 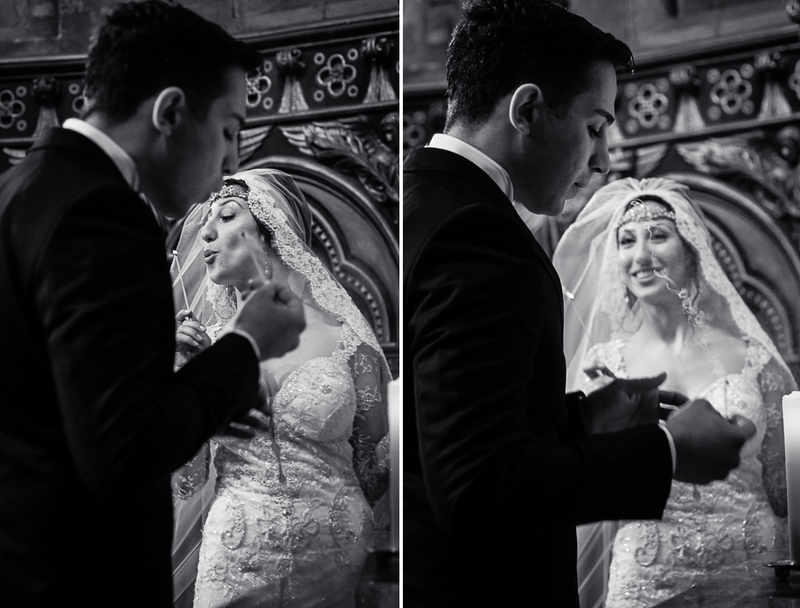 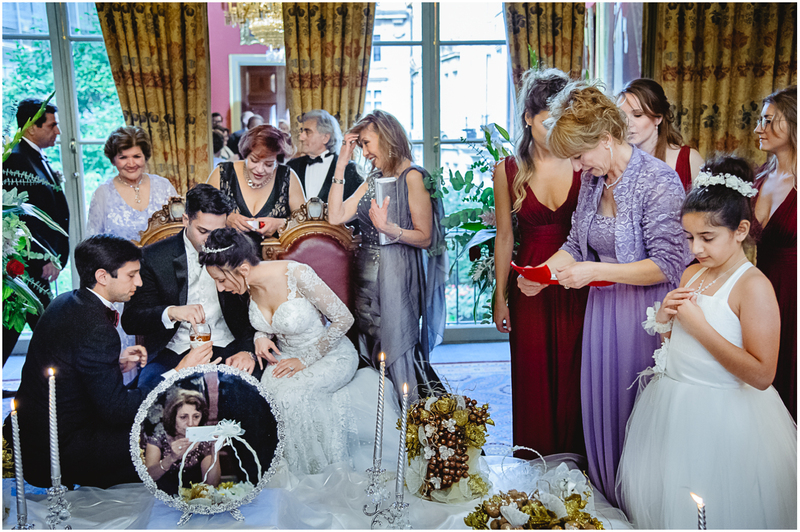 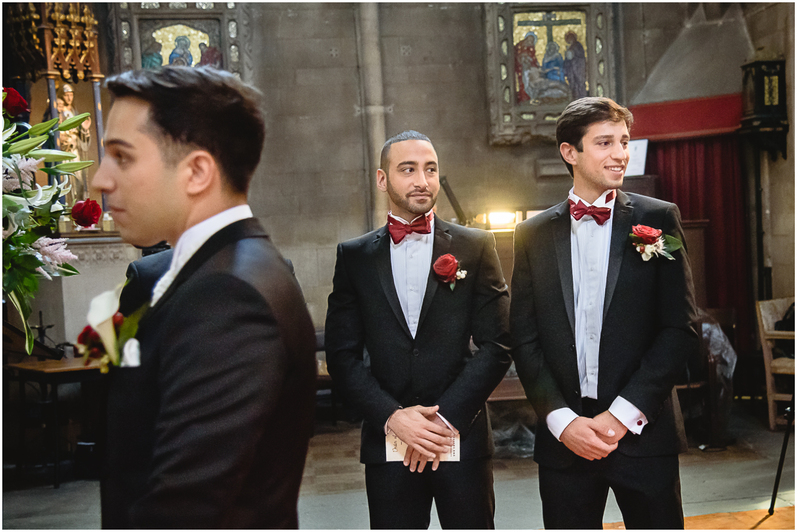 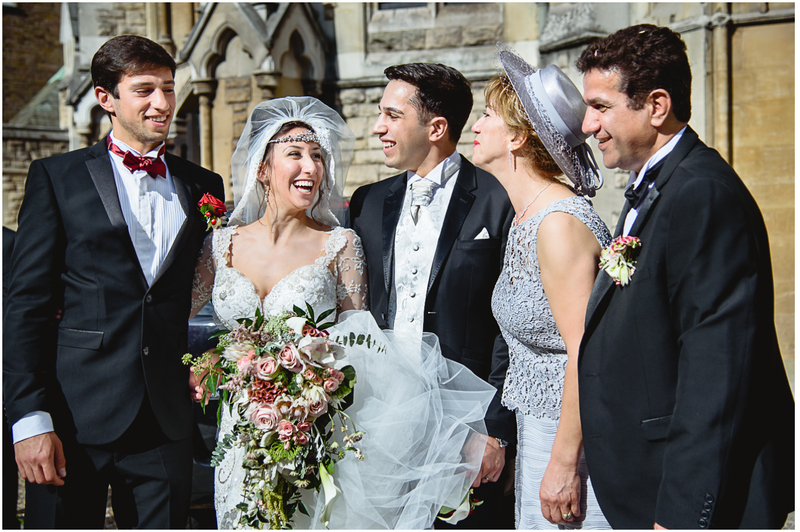 During the ceremony, a London wedding photographer has many occasions to capture remarkable moments. 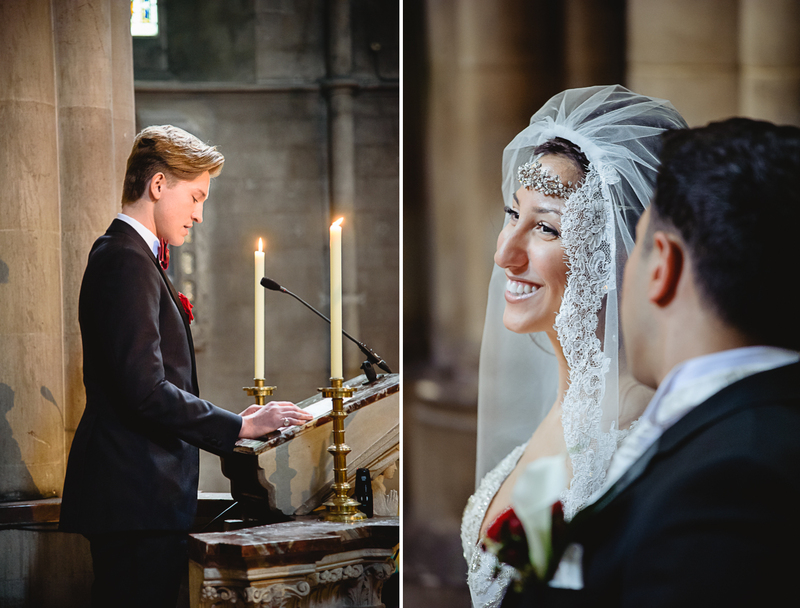 We love to photograph ceremony, especially the moment when the newlyweds. 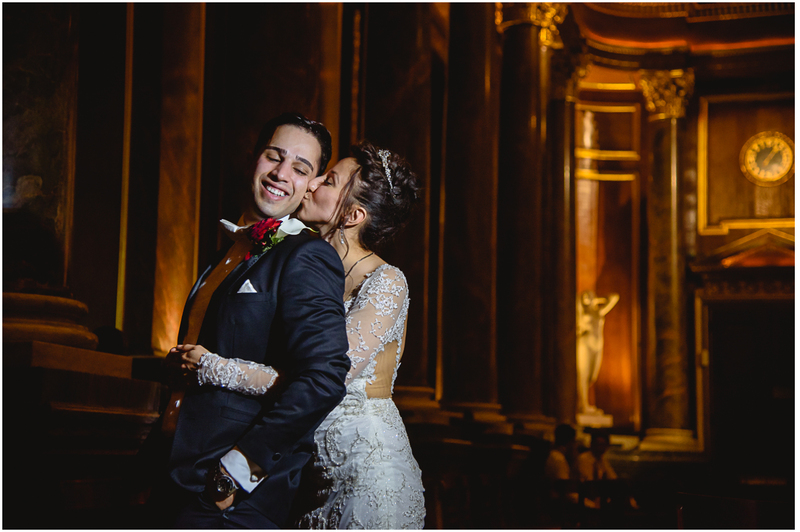 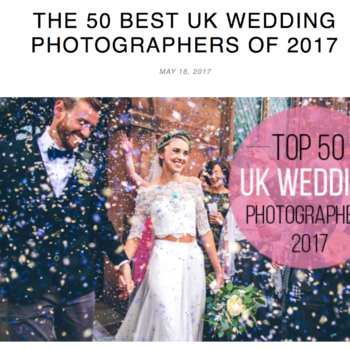 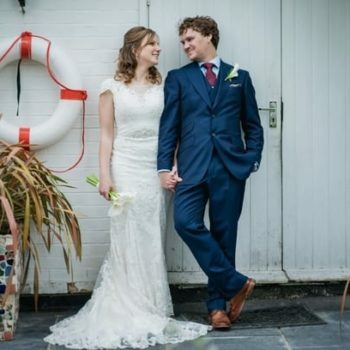 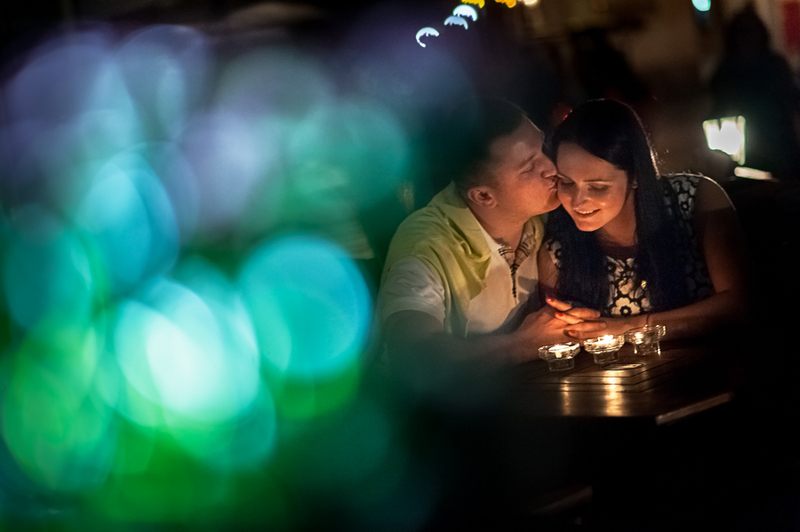 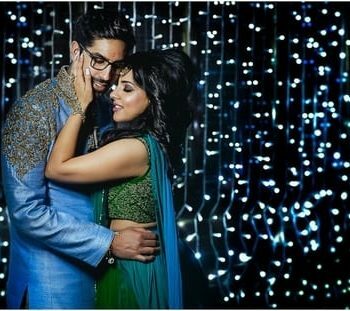 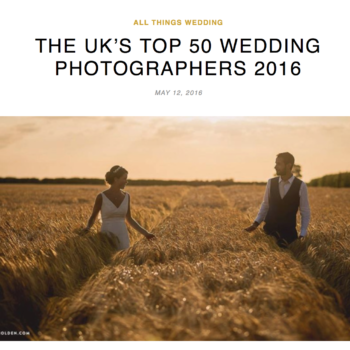 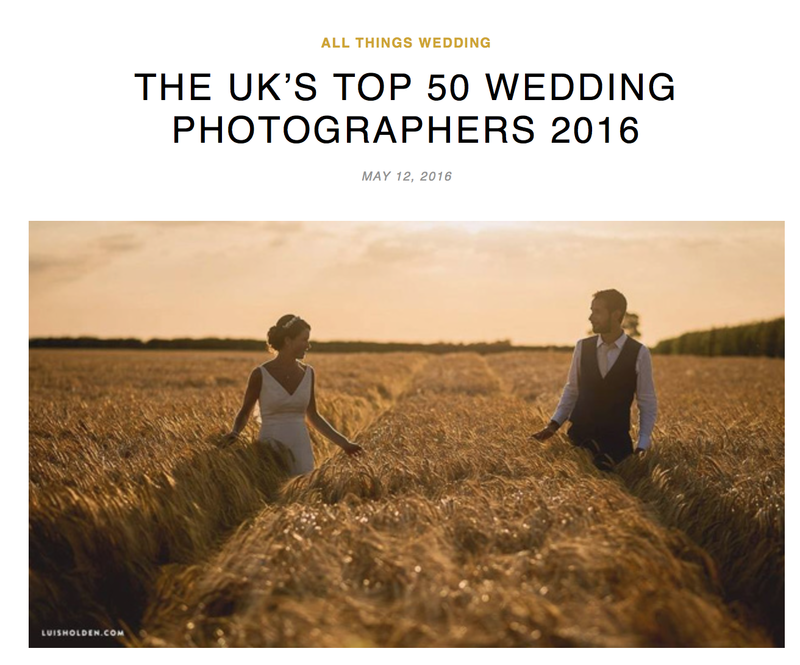 We think that every wedding photographer loves to photograph the couples who are really in love and don’t hesitate to show that to the world. 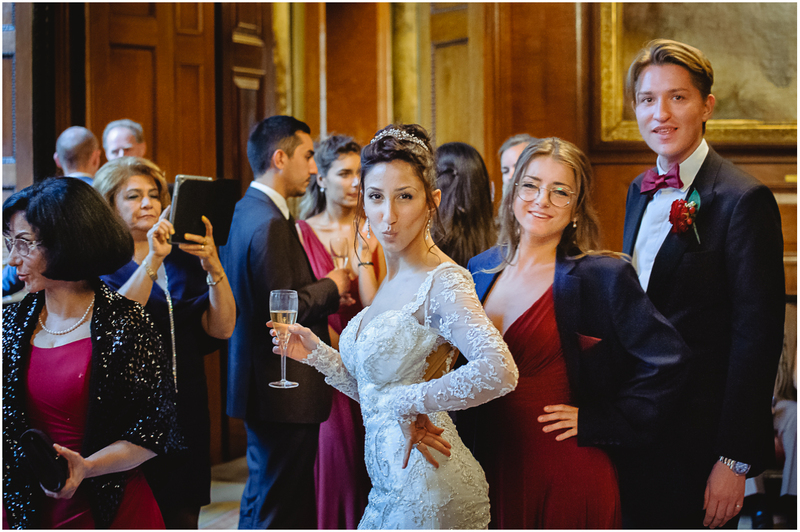 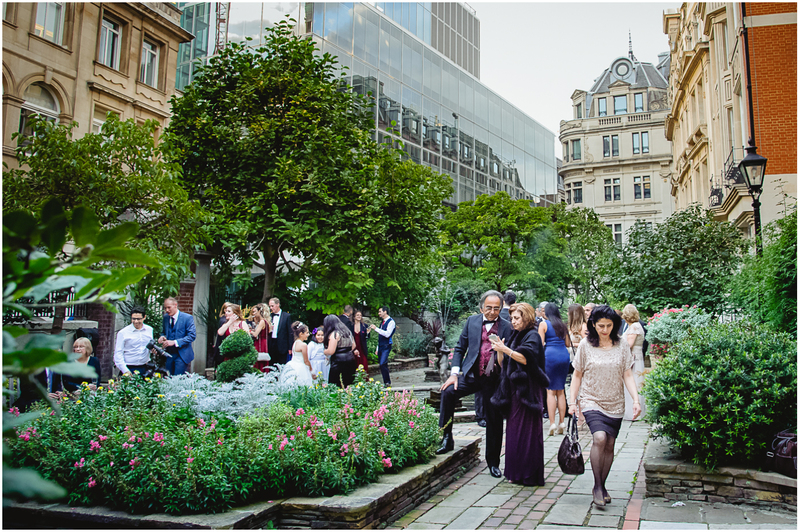 After the ceremony, all the guests went straight to the cocktail party, which was held in one of the most outstanding venues we have a chance to work – a Drapers Hall London in the heart of the City. 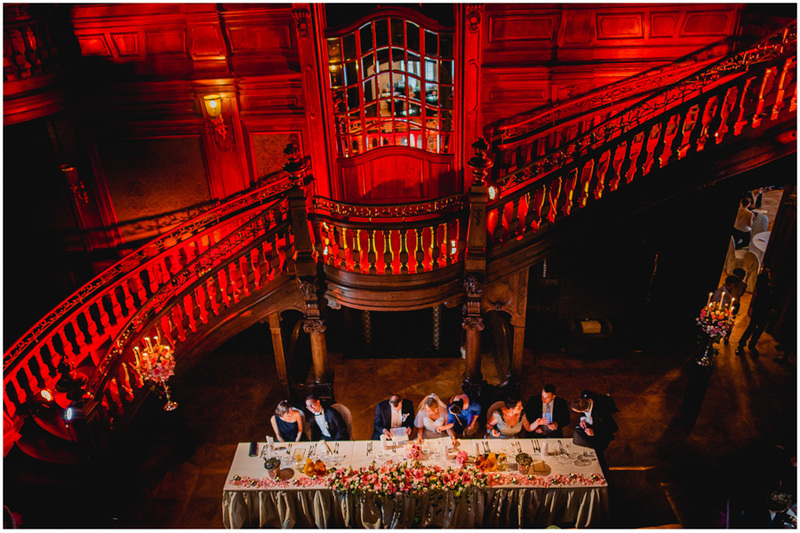 The guests were drinking champagne and chatting and we prepared the lighting for the first dance and took some pictures of the gorgeous venue itself. 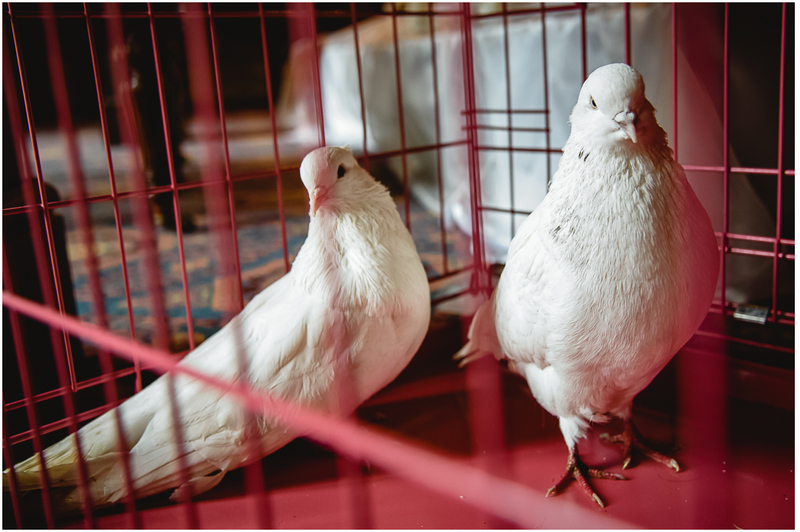 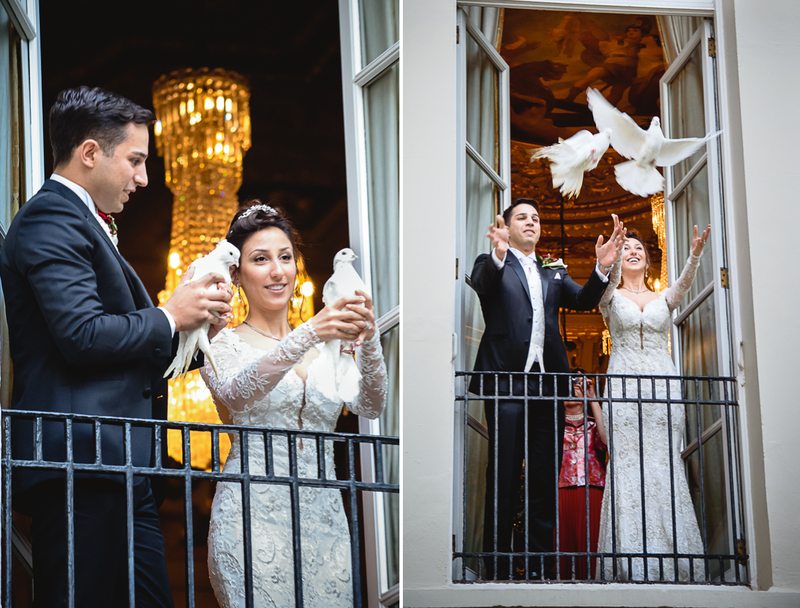 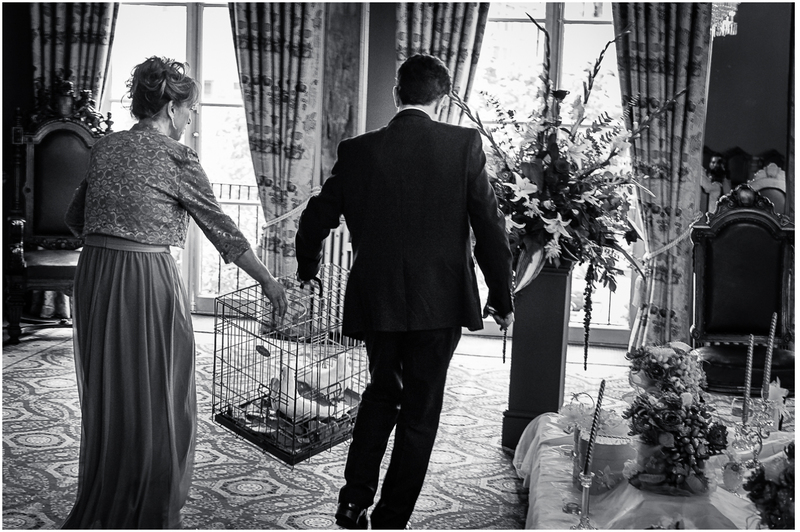 The next surprise for the bride and groom was a pair of white pigeons which were set free by the bride and groom. 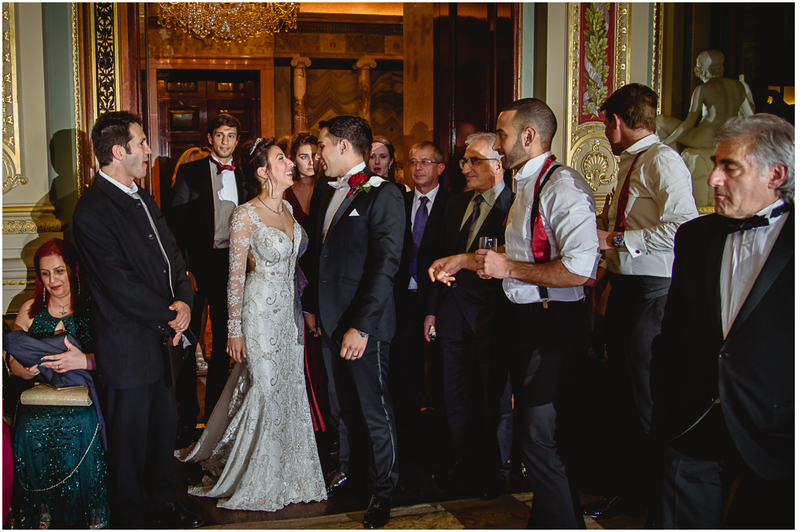 It was a very exciting moment for all of the guests and the newlyweds of course. 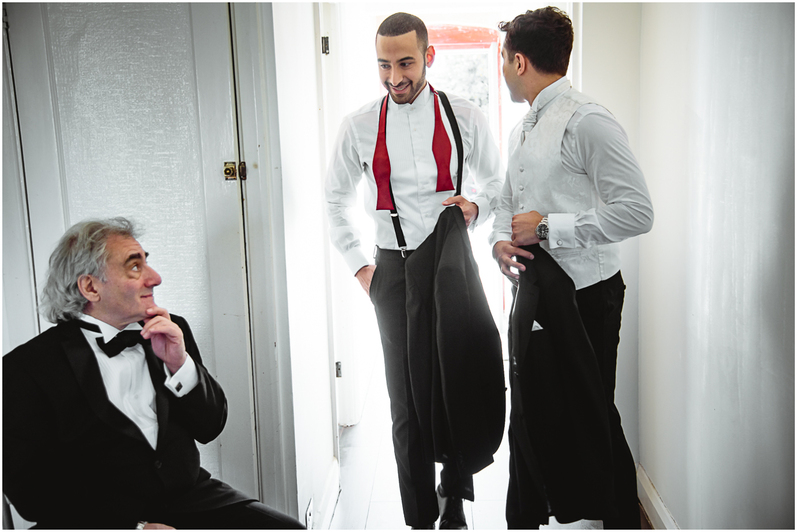 Then we have proceeded with the portrait session. 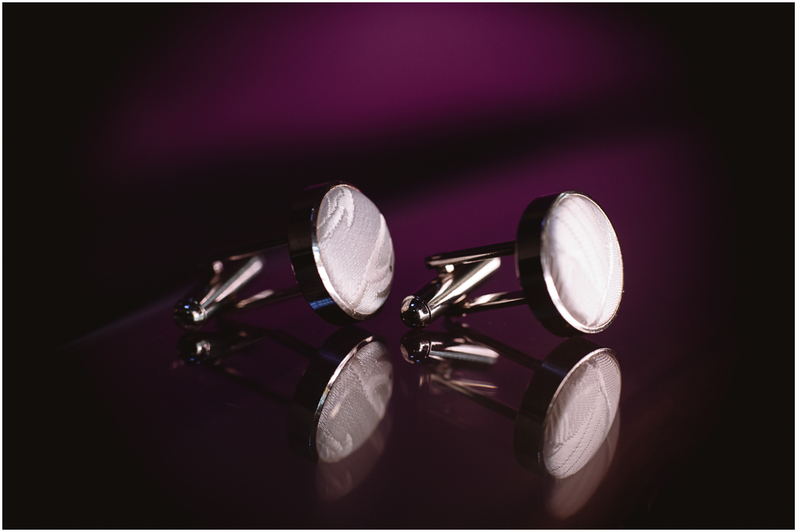 We love to use the Ice Light because it gives us almost the same quality as the window light. 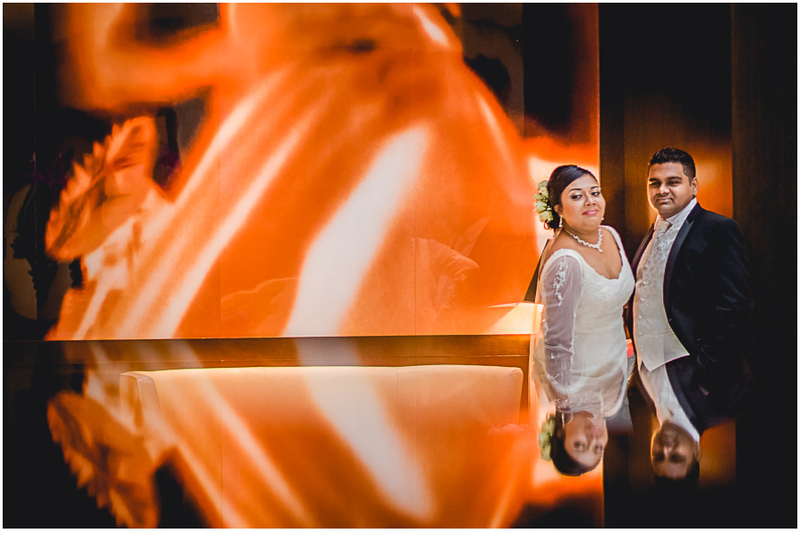 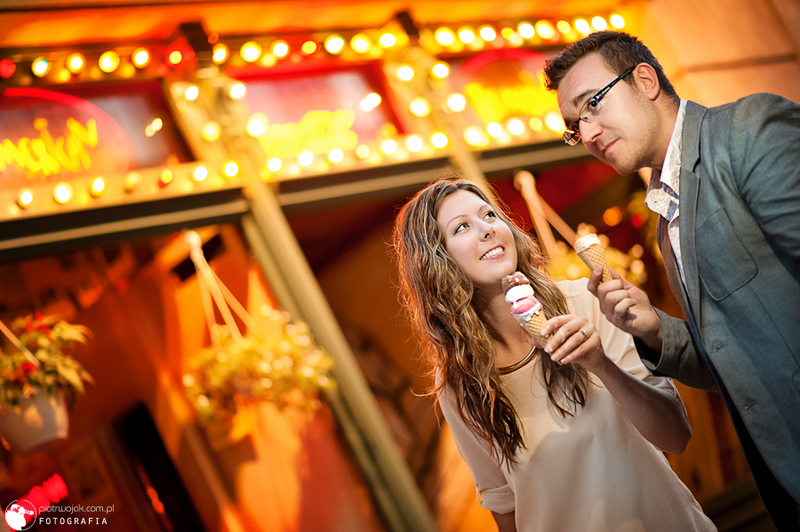 The combination of the Ice Light superb light quality and the nice background always do the magic. 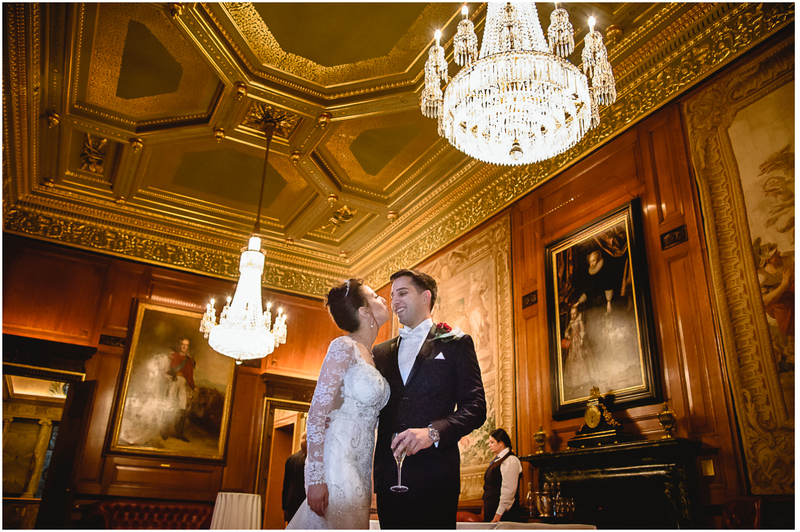 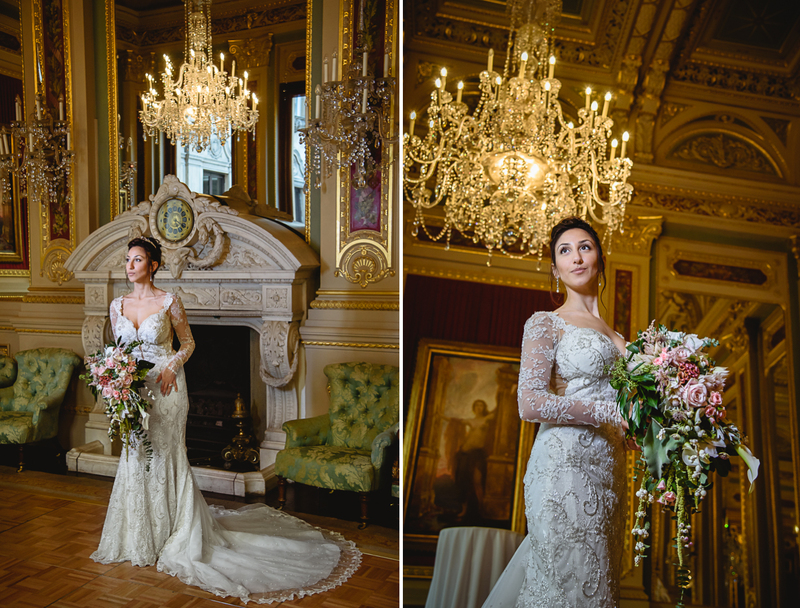 The beautiful interiors od the Drapers Hall London are very inspiring for the London wedding photographer. 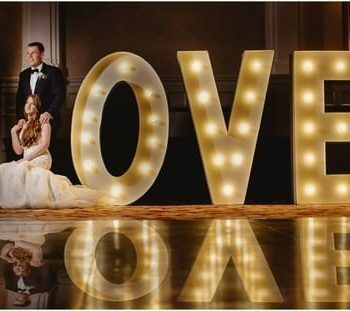 All we need is like 15 minutes to make a dozen of good portraits when everything is right and the bride and groom are not ashamed to show their love. 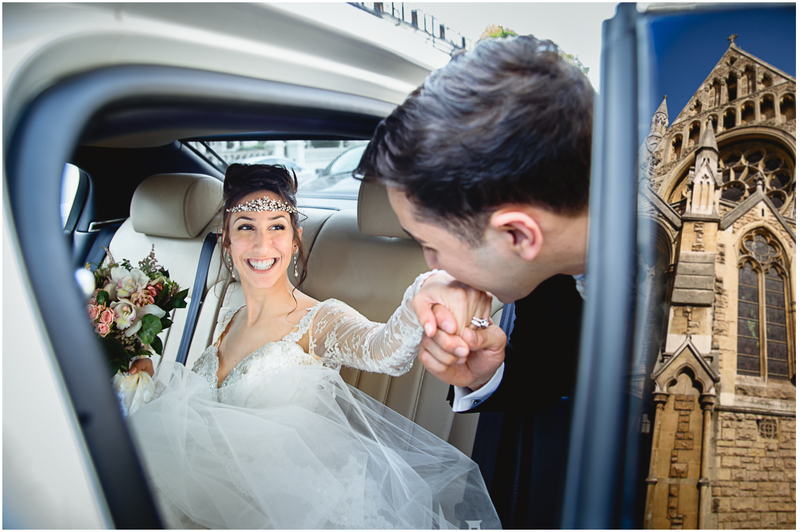 Kristina and Abtin, we would like to thank you very much for your trust, enthusiasm and energy. 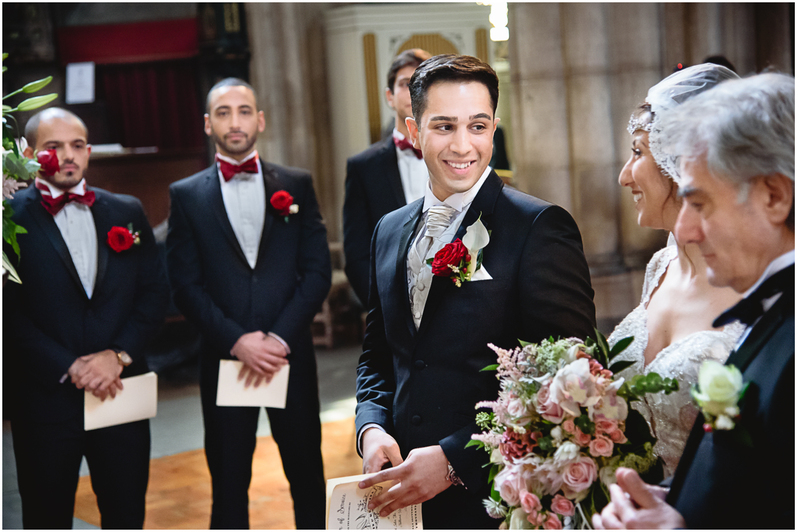 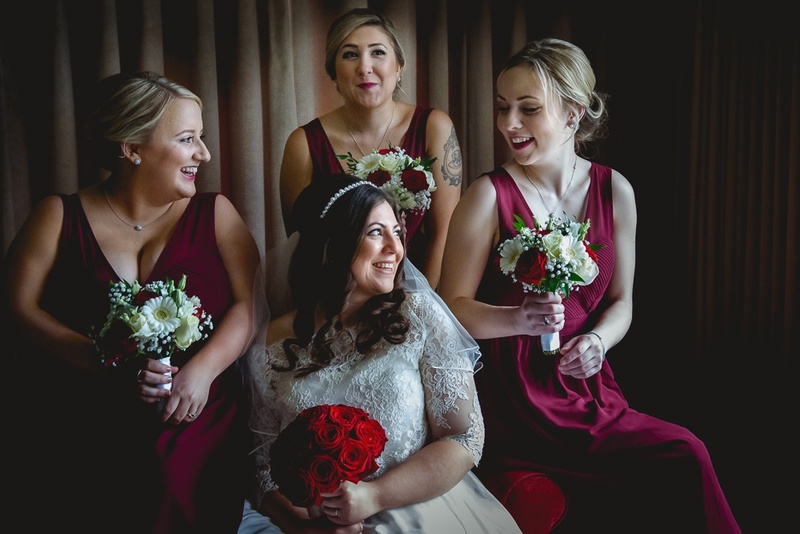 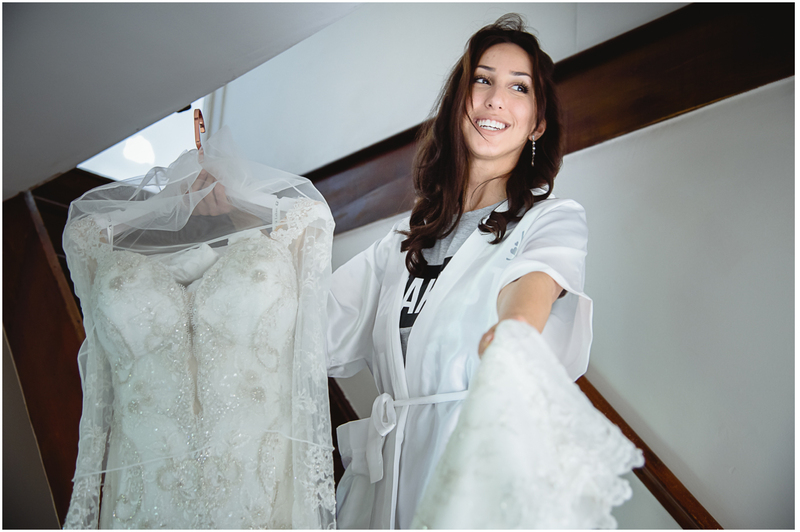 We know how wedding photography is important for you, and we thank you for your time that you’ve spent with us to create the pictures that we hope you will love as we do. 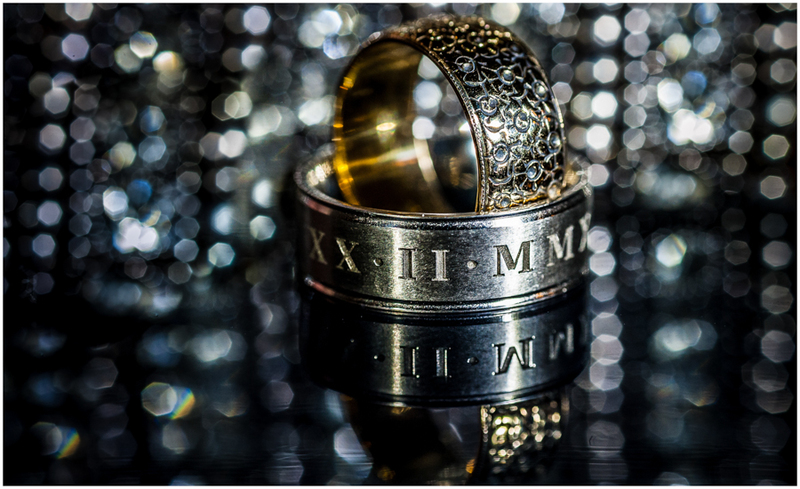 When making photos of details we have used Nikon D750 with Raynox DCR-250 converter. 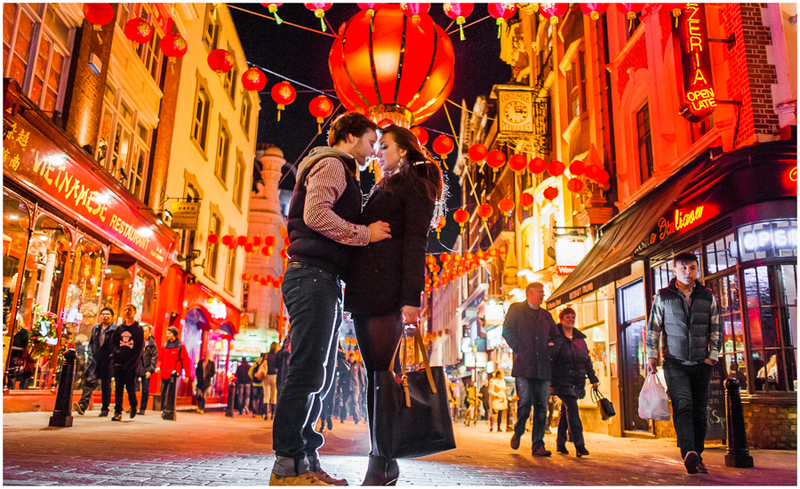 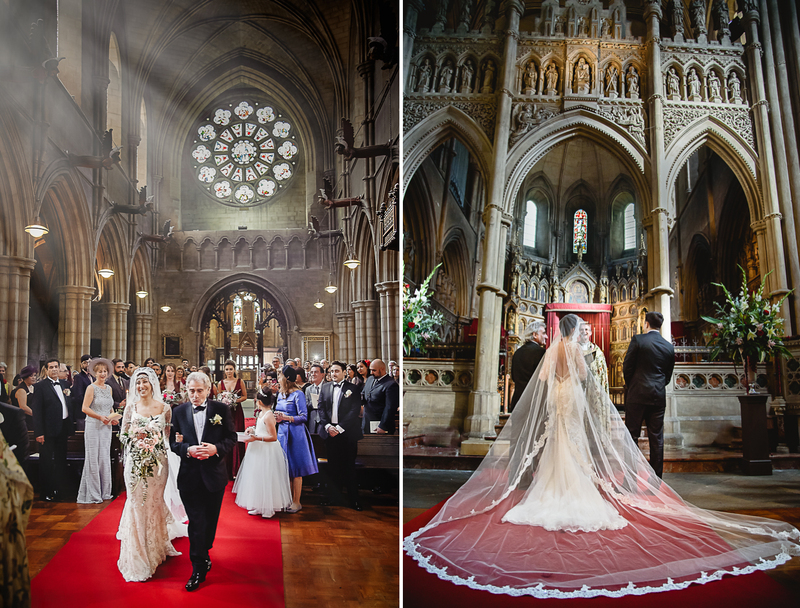 Most of the reportage photos were taken with our favourite light set – Nikon 750 plus Nikkor 24-120. 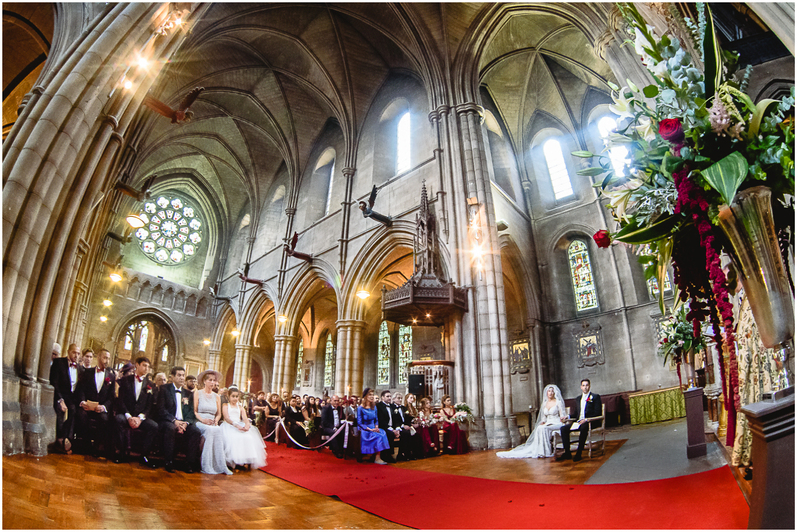 The church interior was photographed with a fisheye 16mm lens. 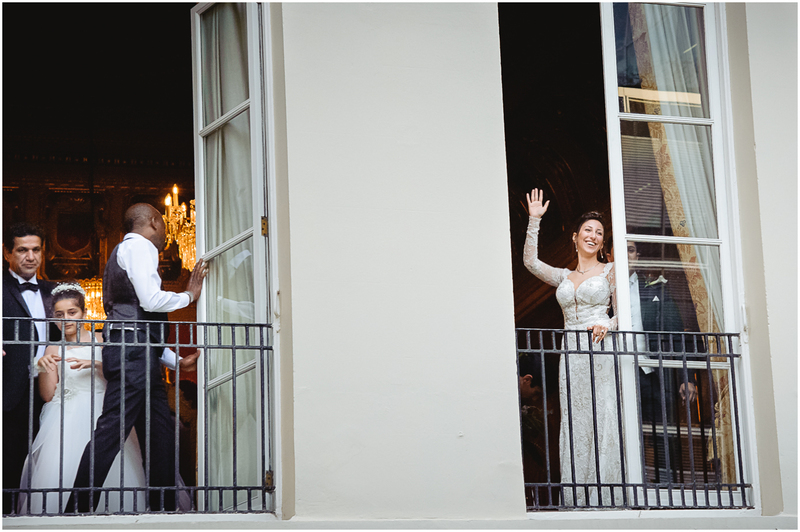 We must say that it was a perfect day. 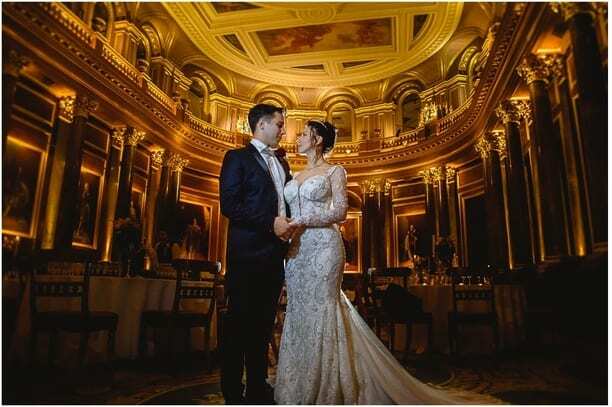 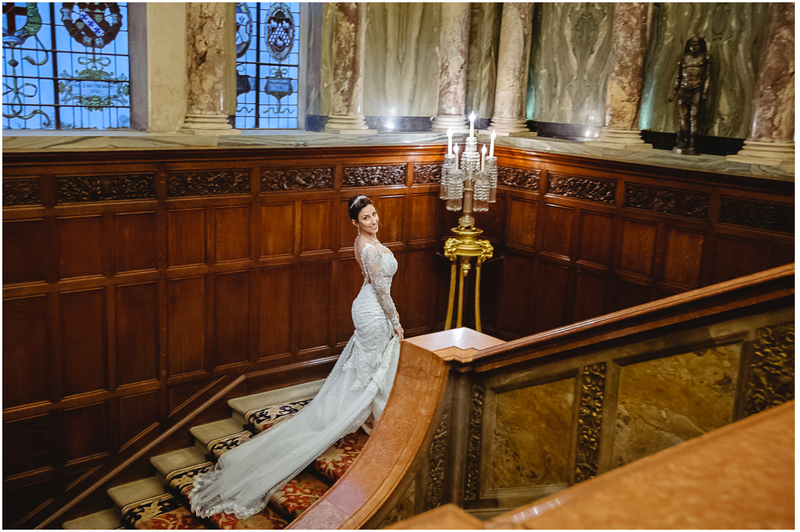 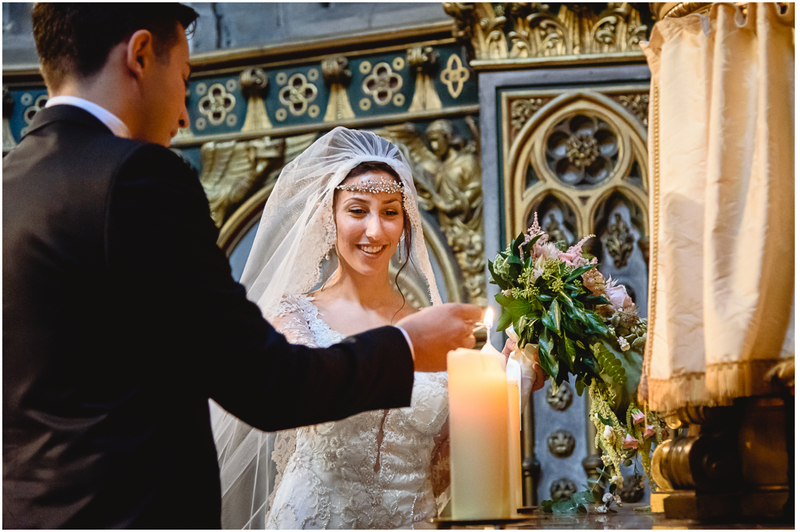 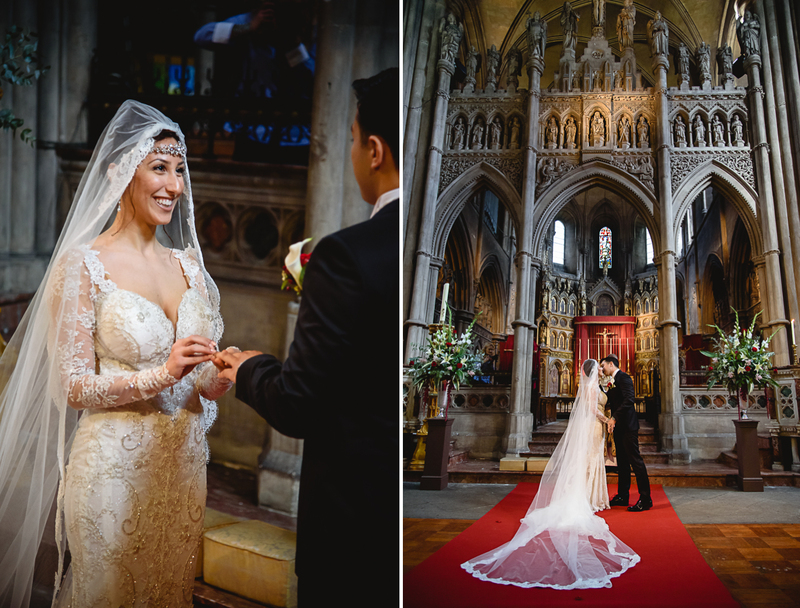 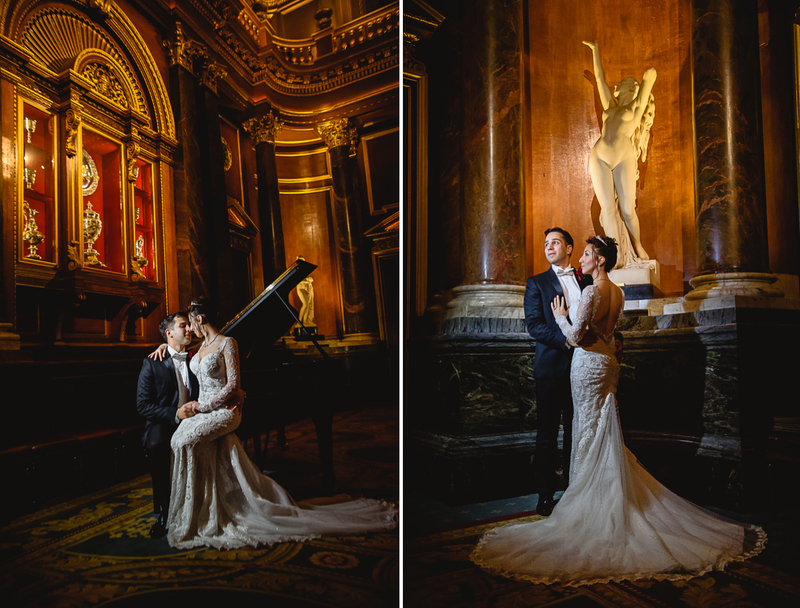 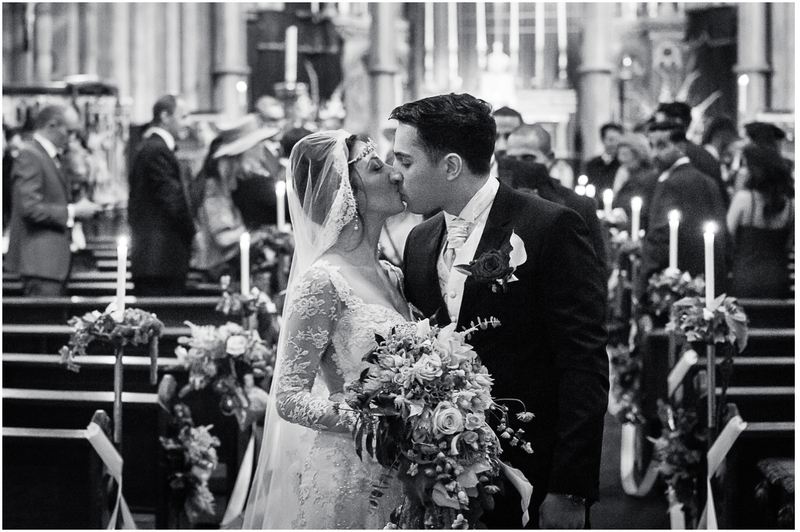 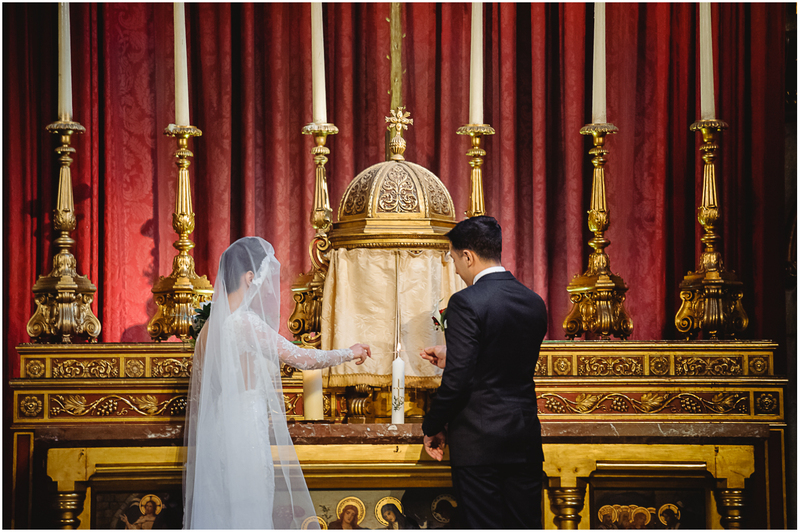 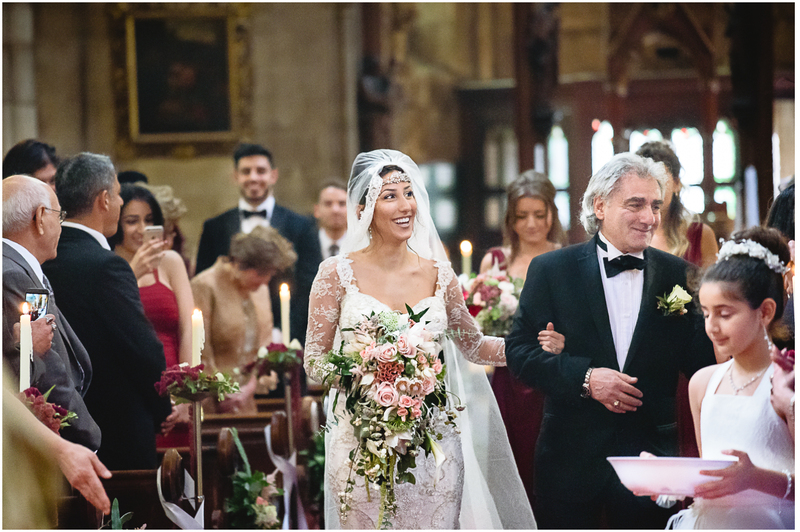 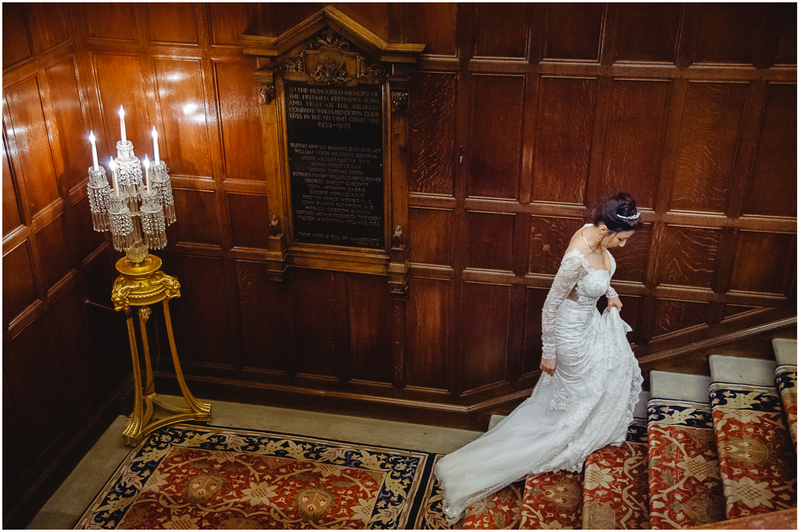 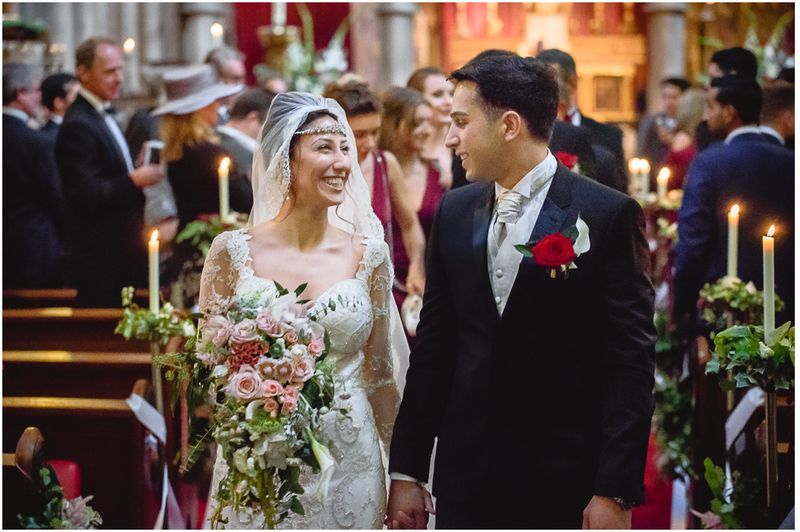 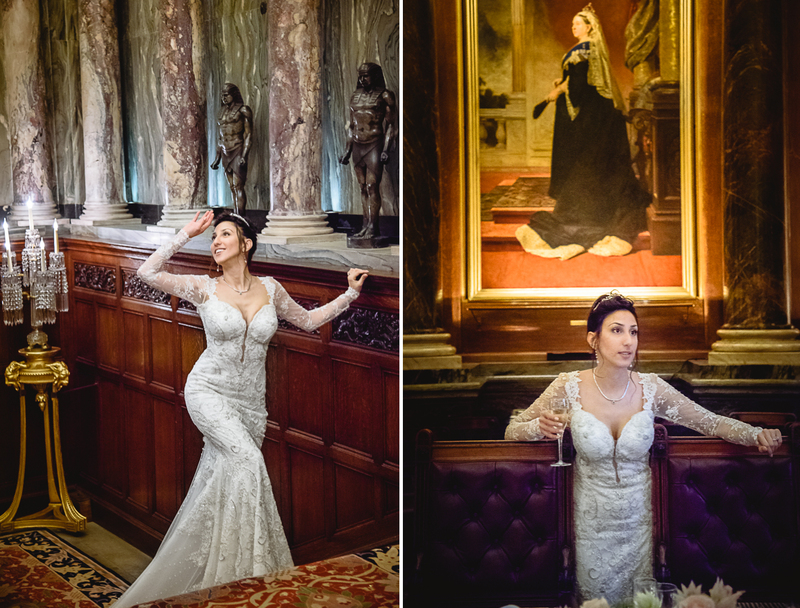 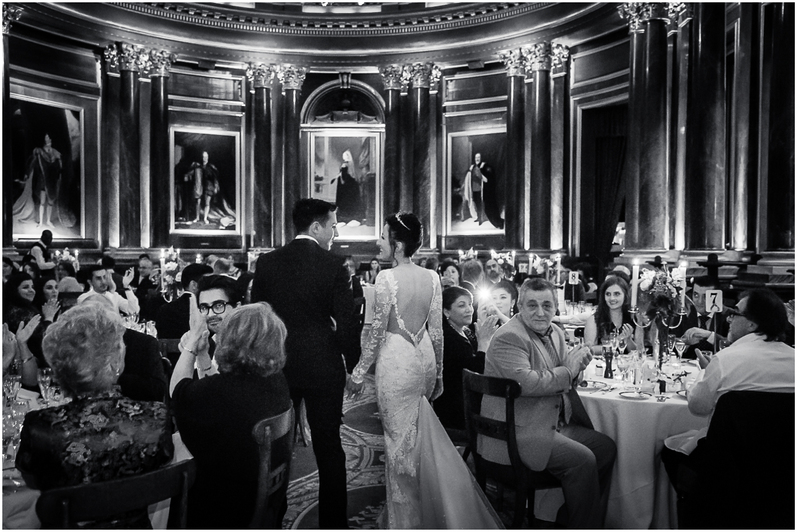 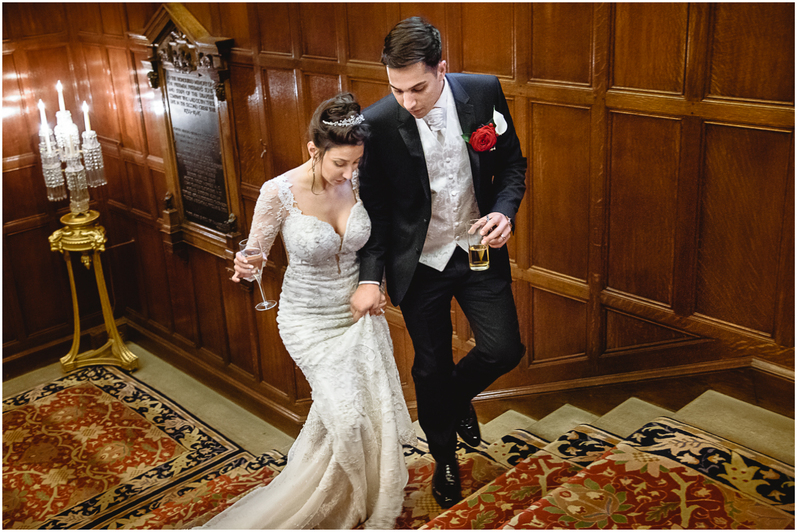 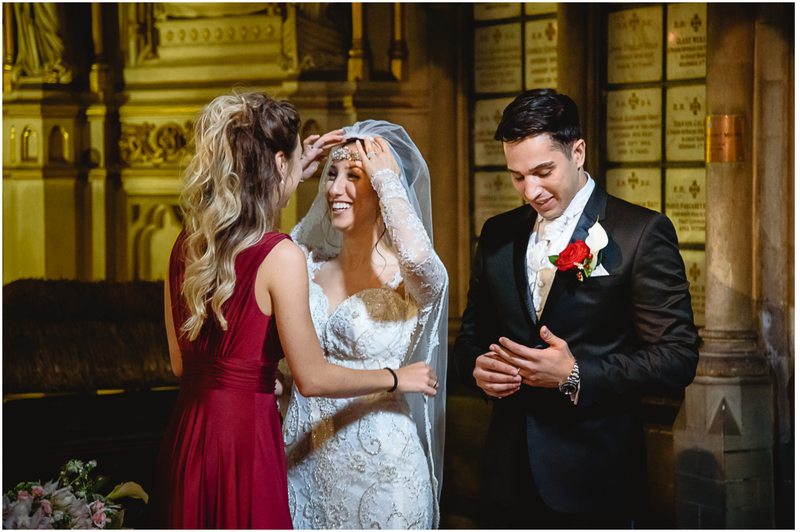 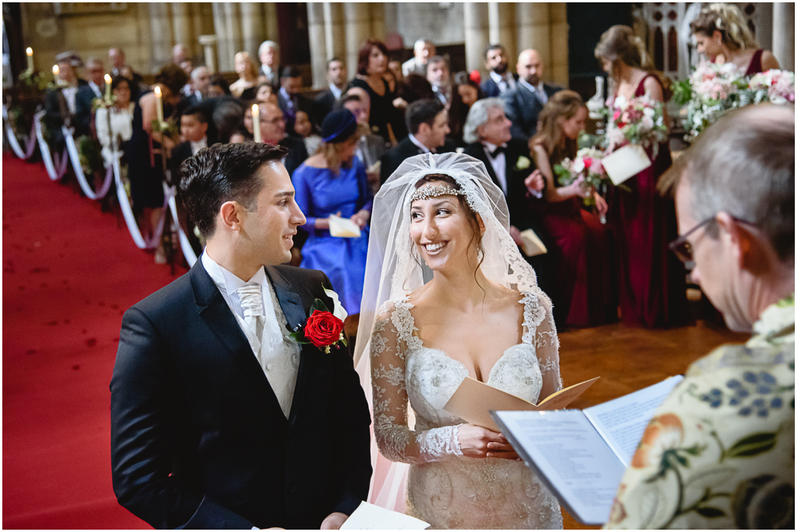 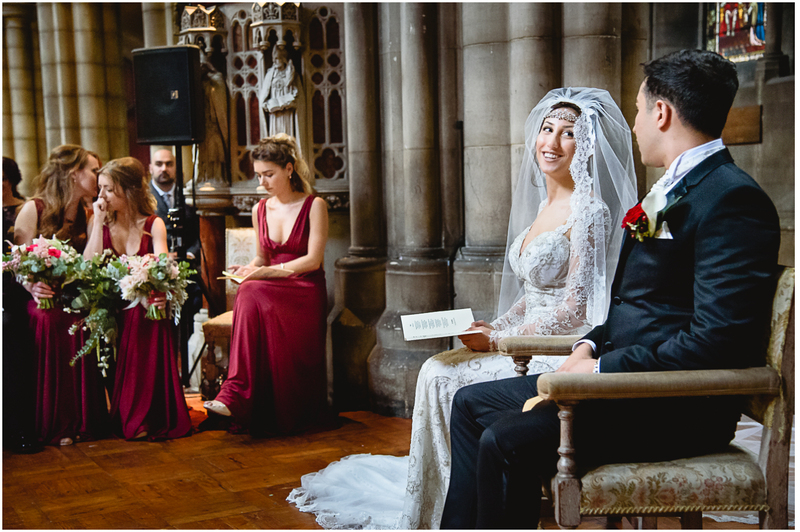 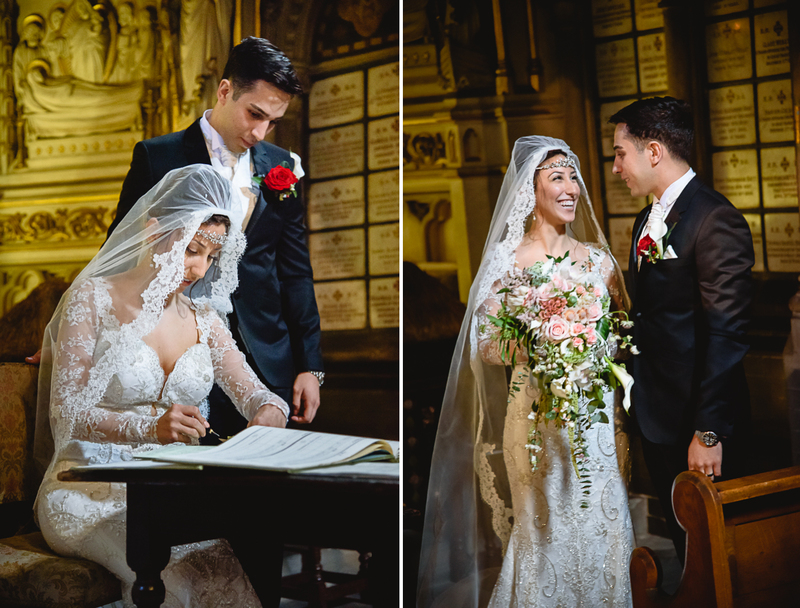 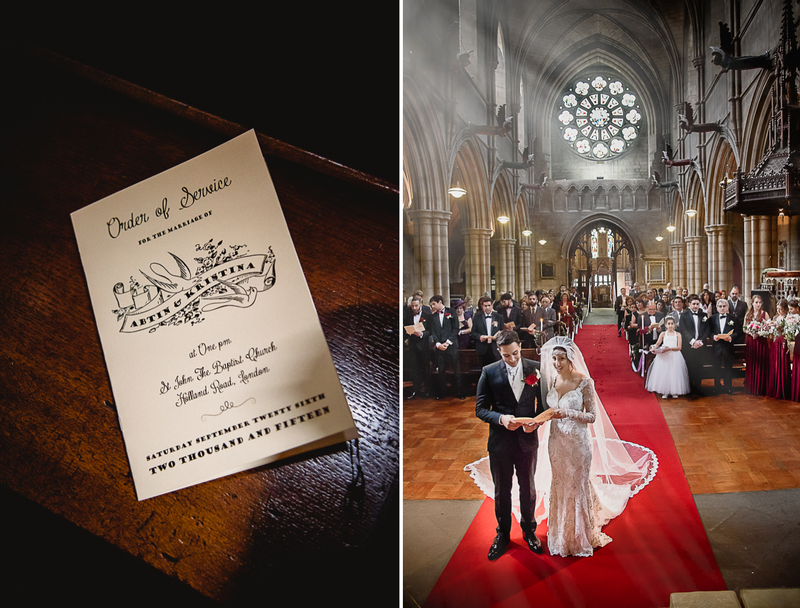 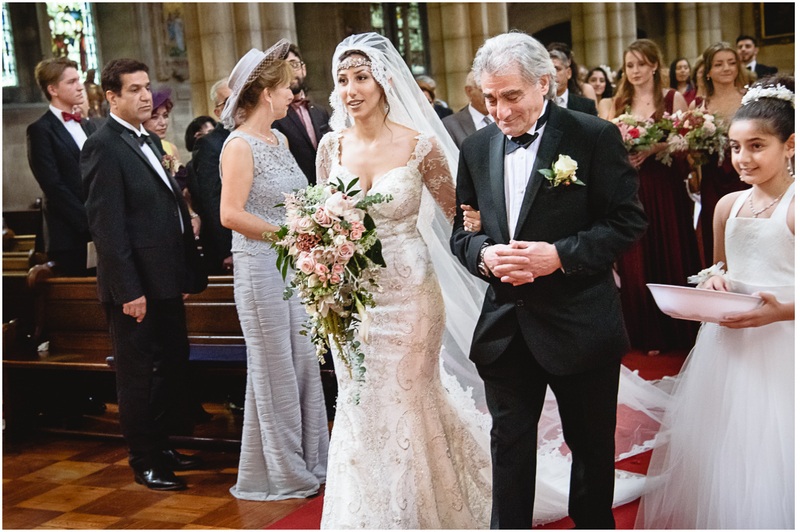 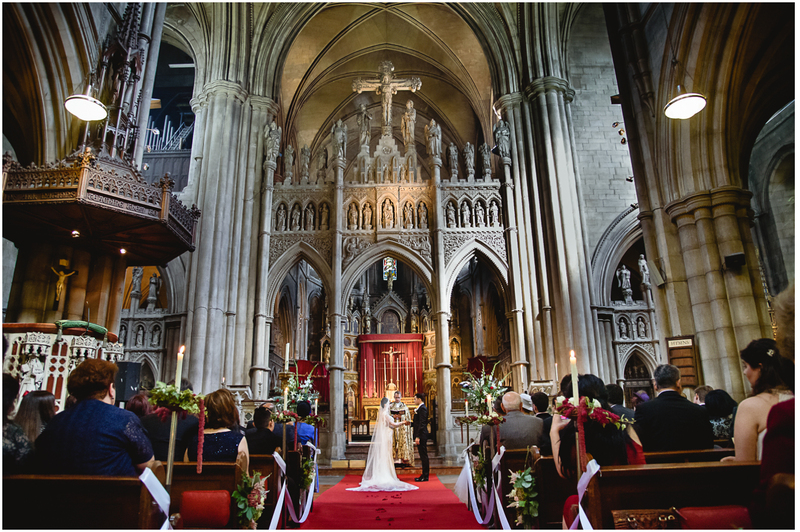 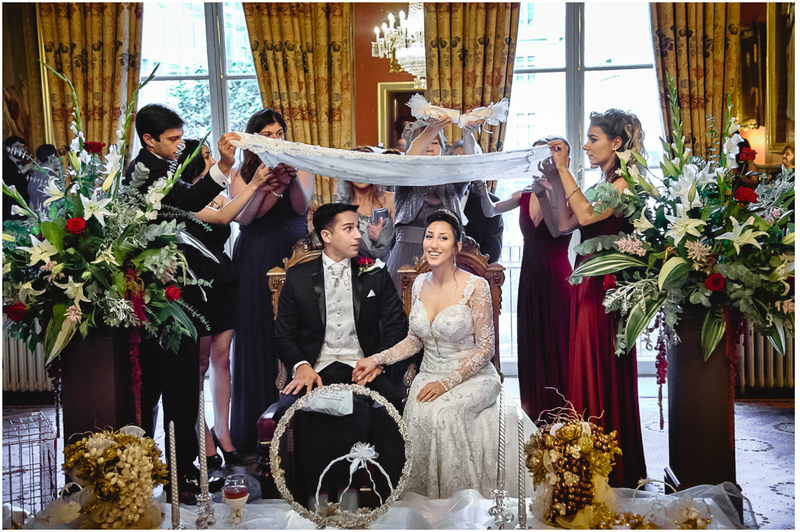 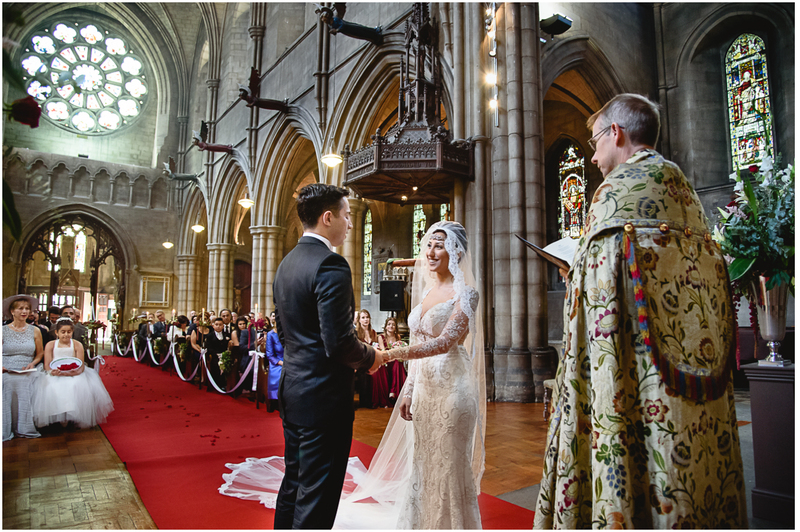 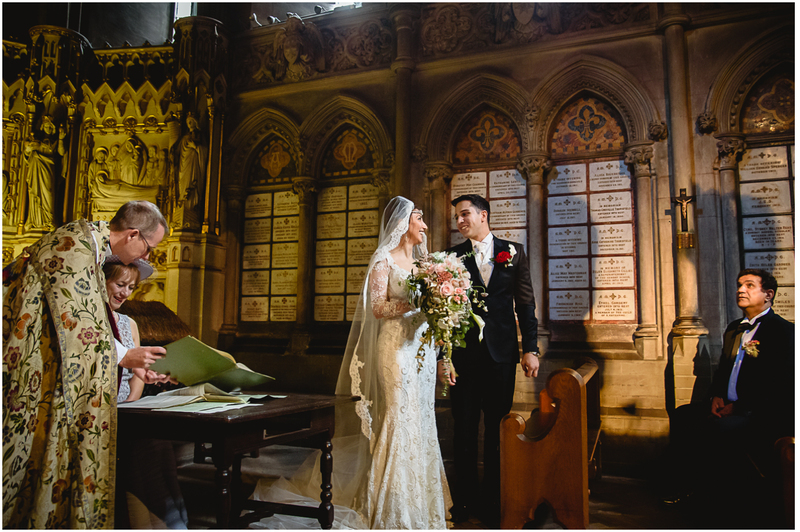 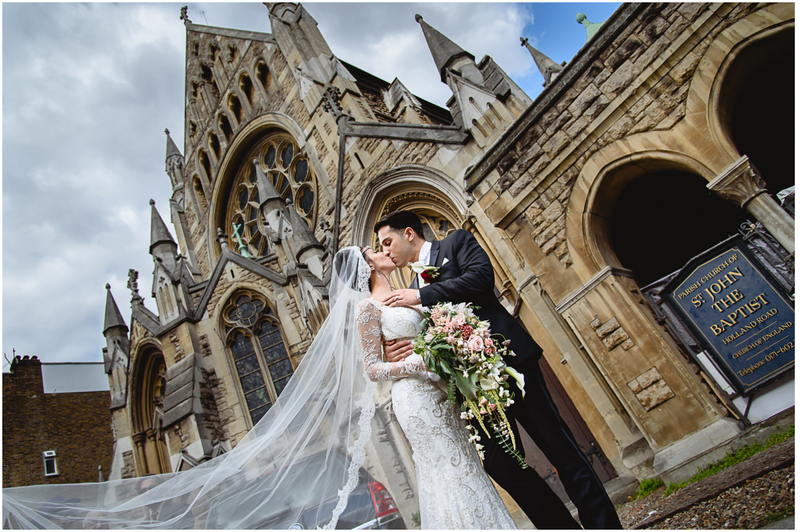 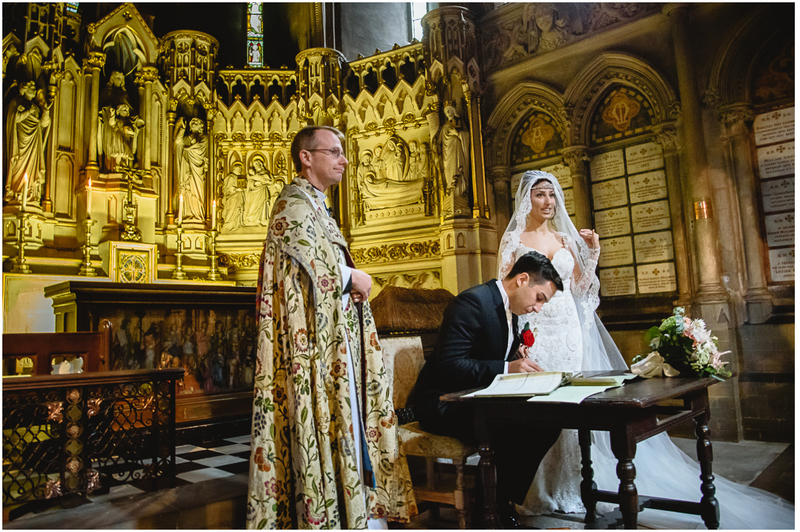 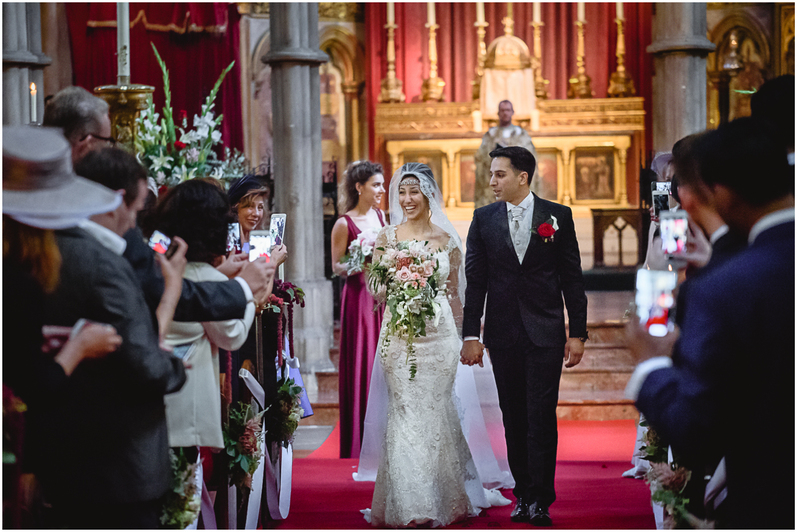 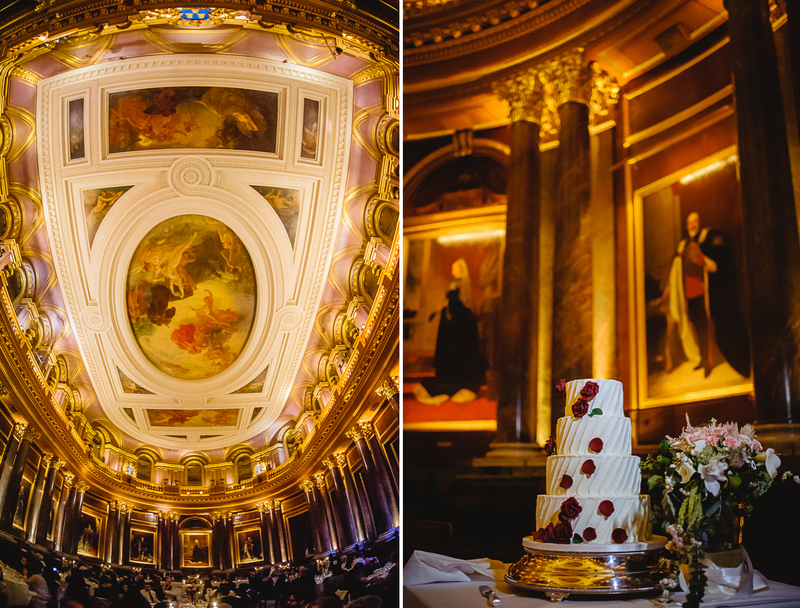 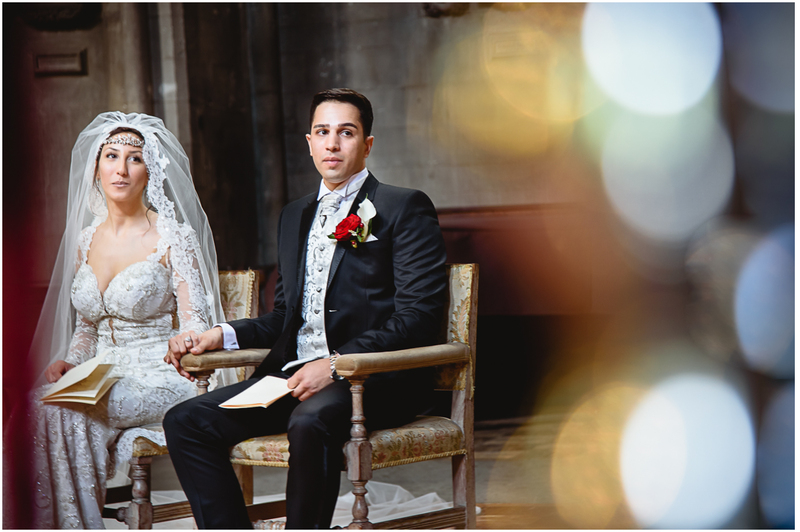 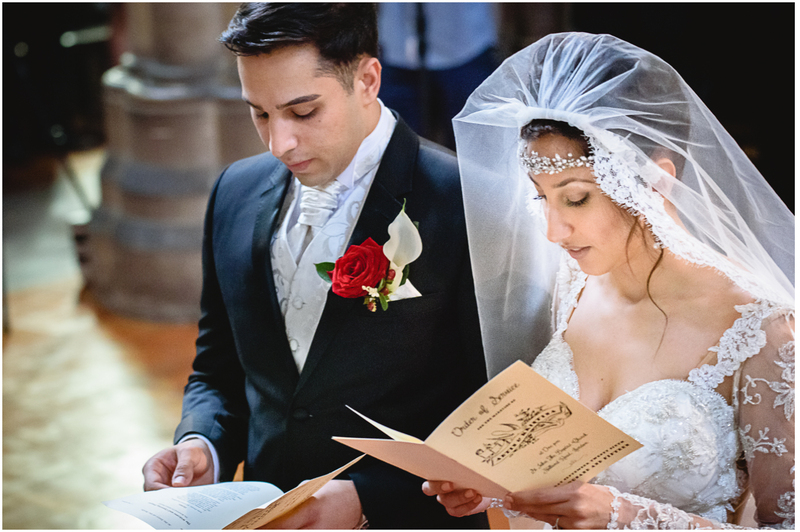 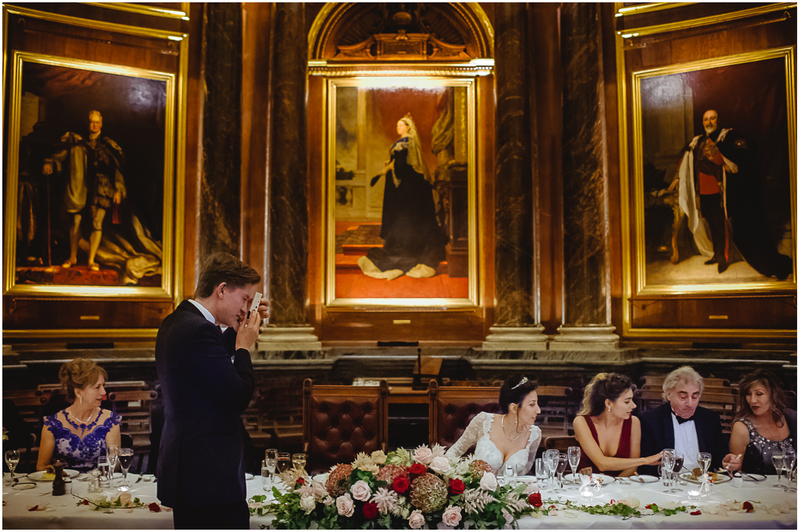 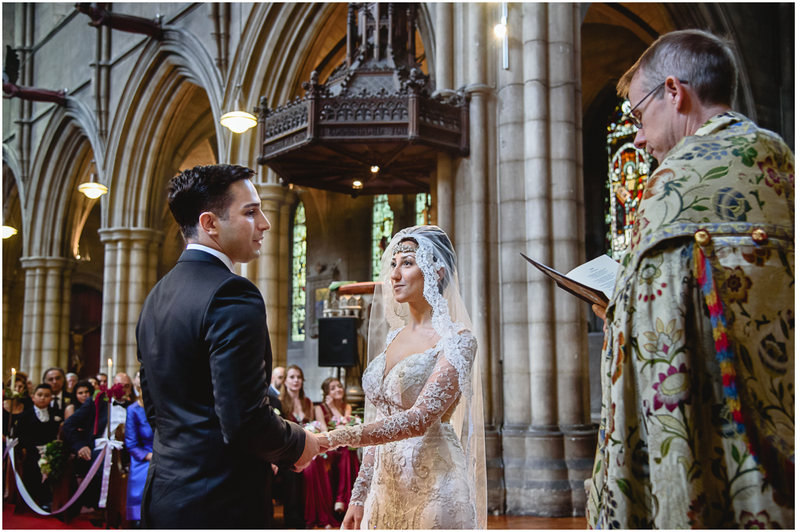 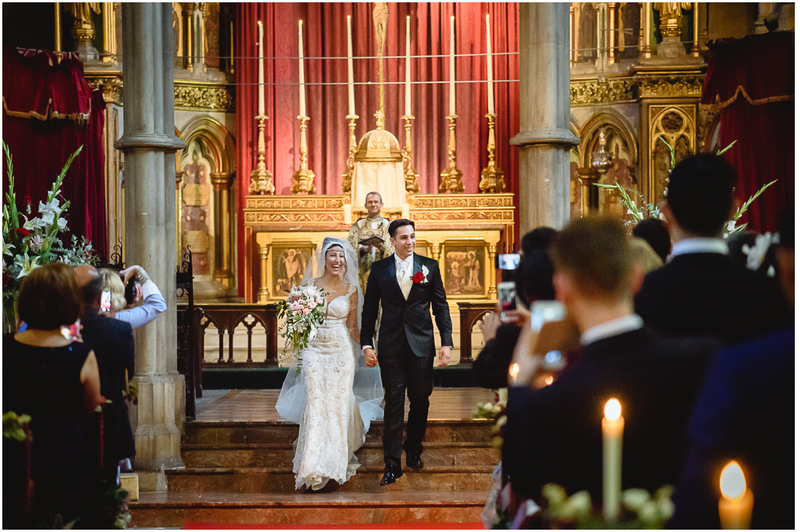 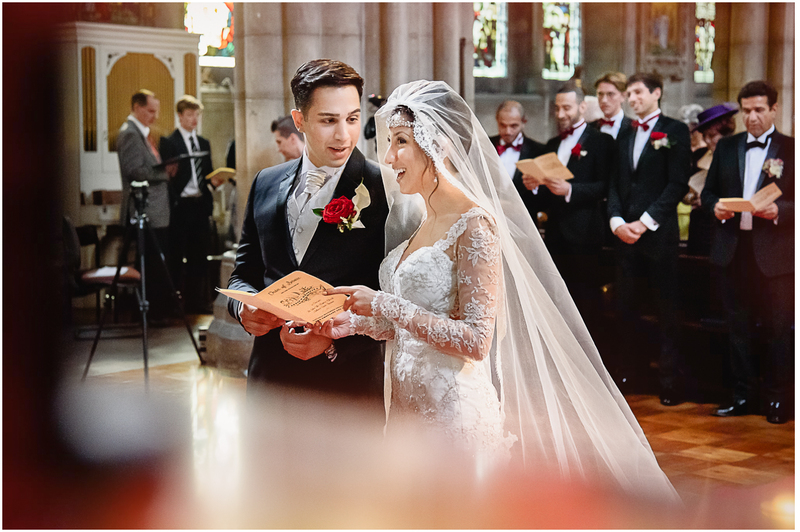 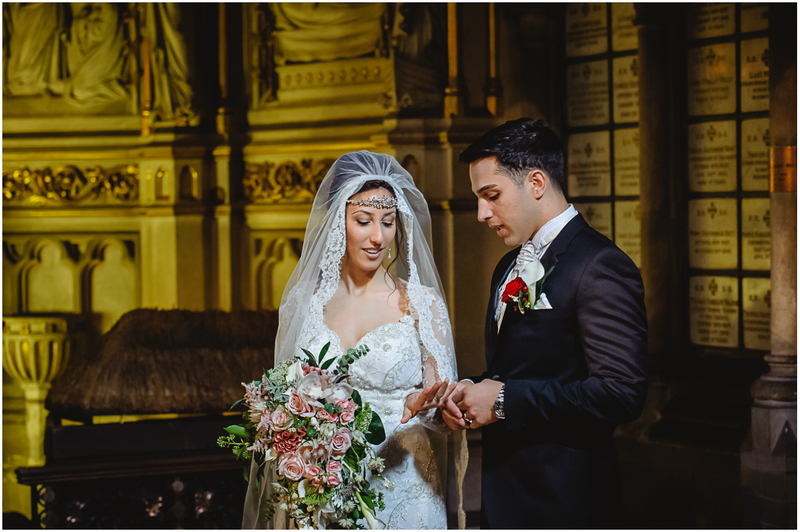 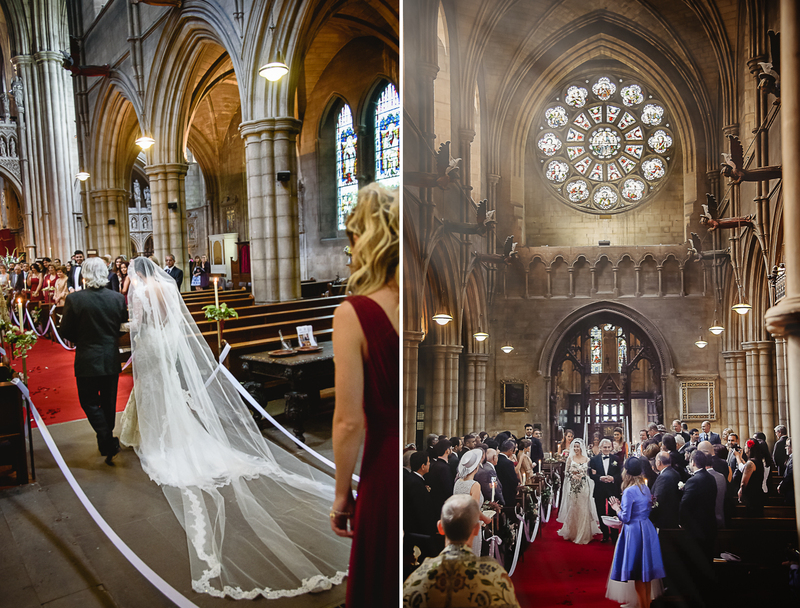 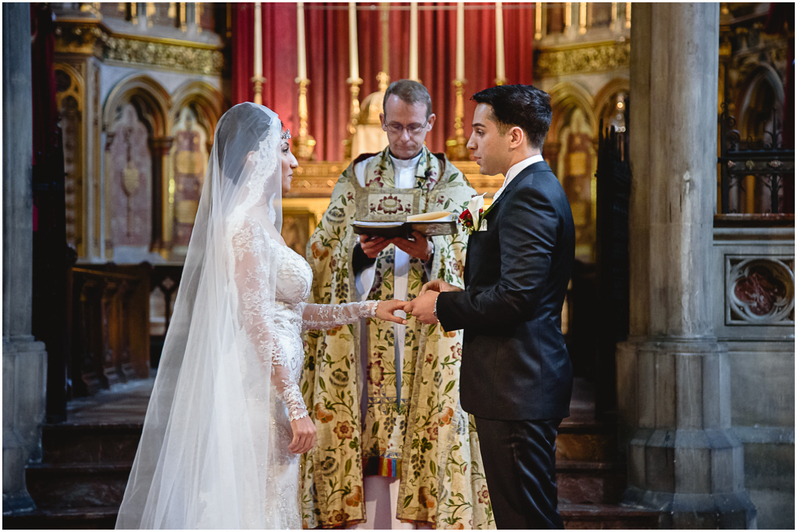 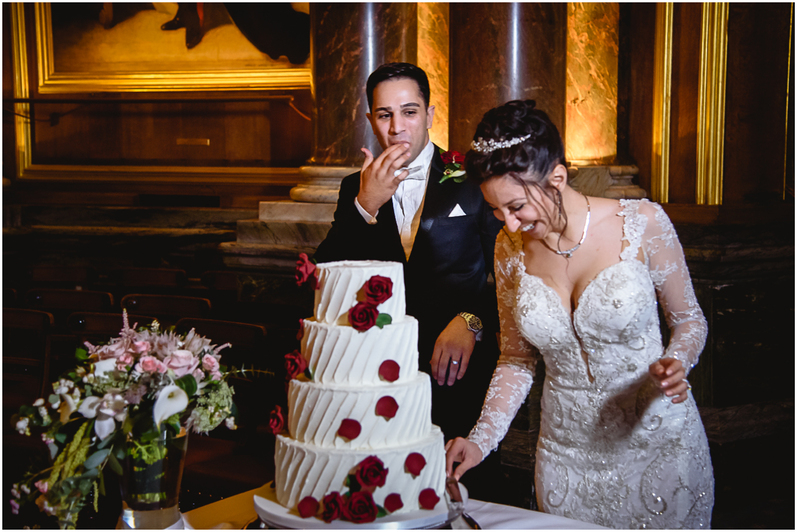 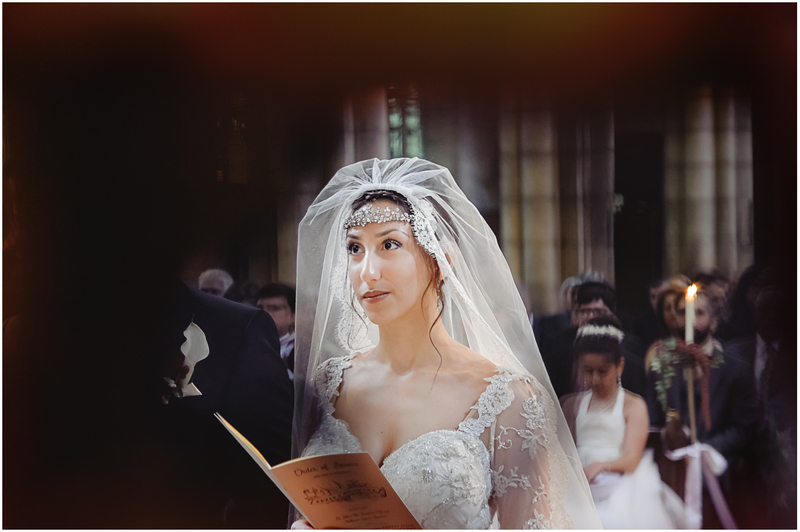 A wonderful church of the St. John the Baptist with beautiful interiors and architecture and one of the most amazing venues that we have ever worked in – the Drapers’ Hall located in the heart of London provided the most exquisite backgrounds for our gorgeous couple. 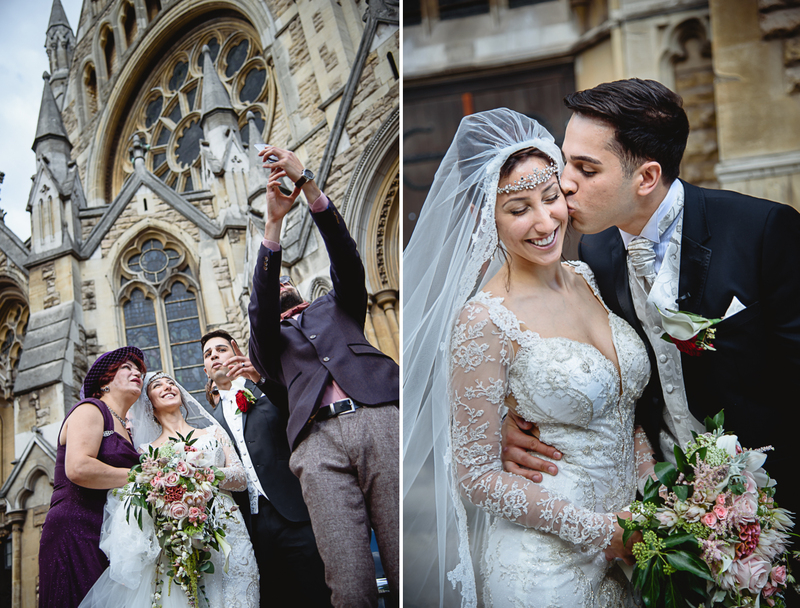 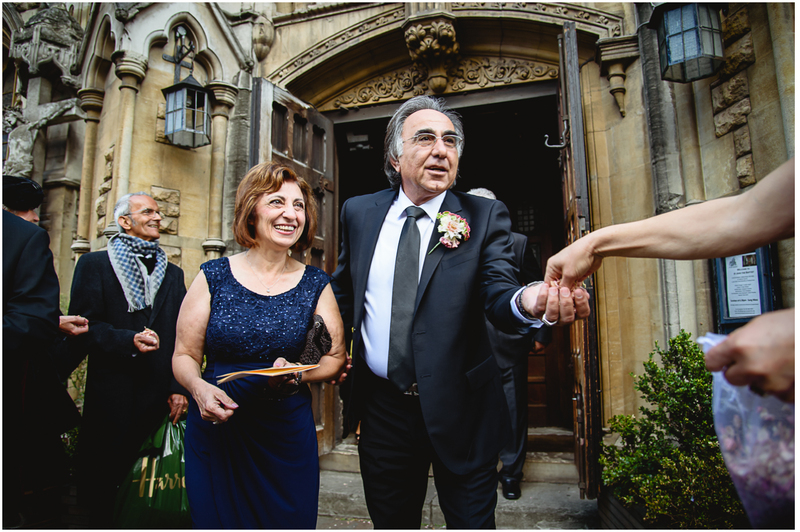 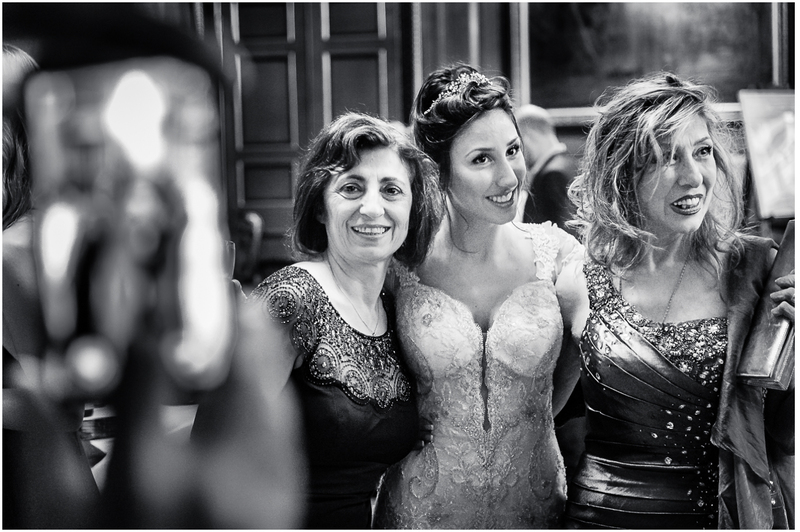 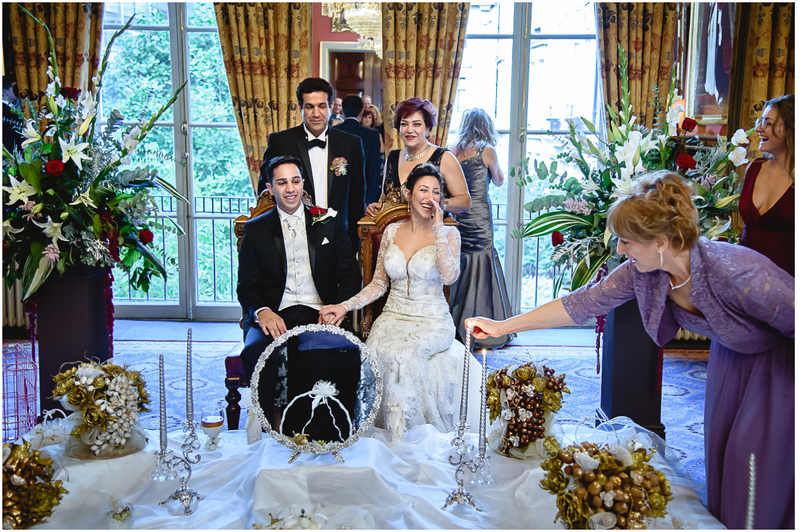 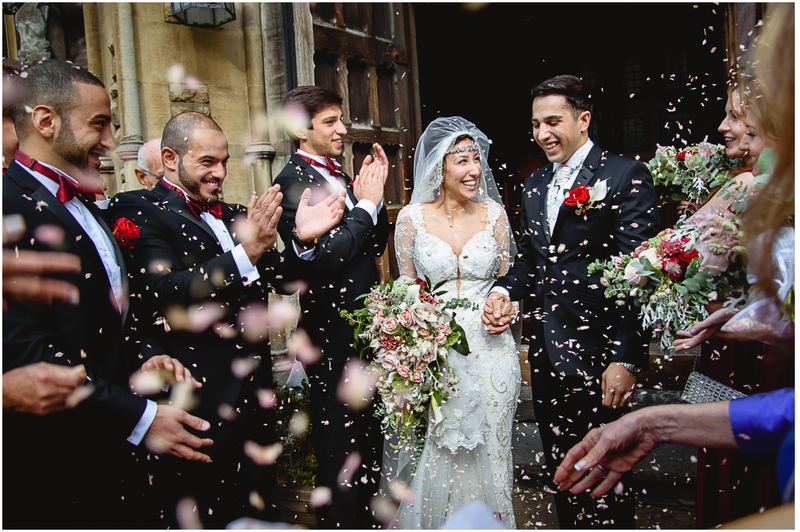 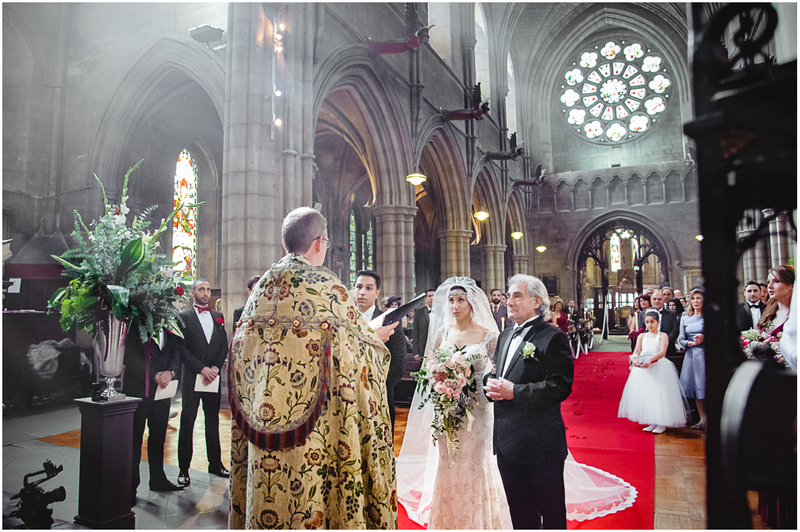 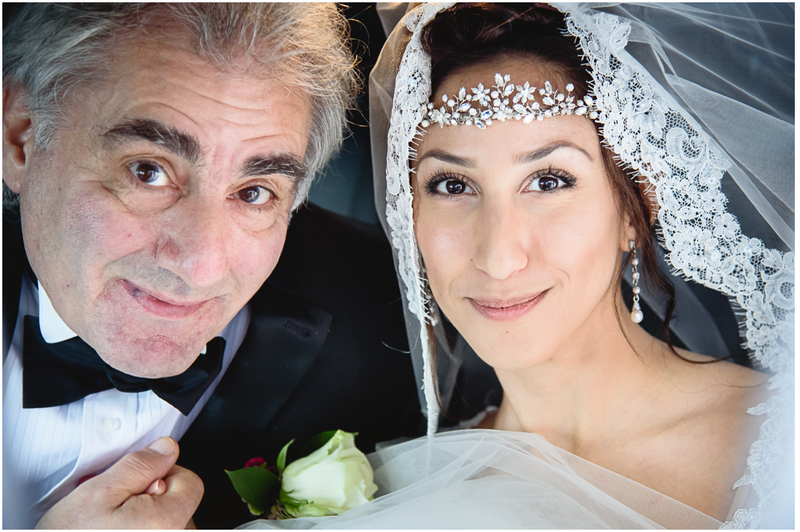 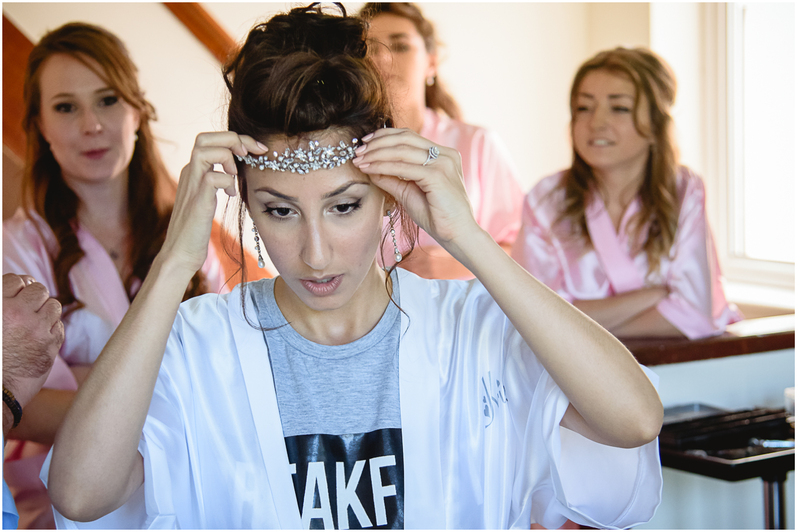 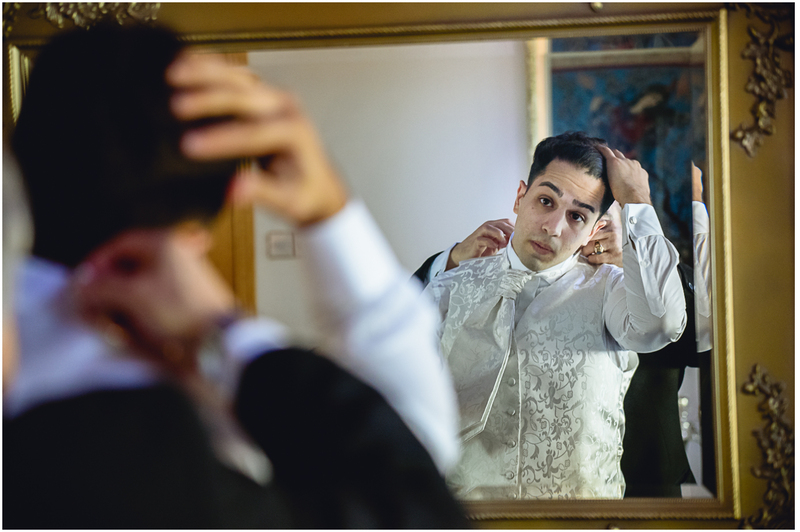 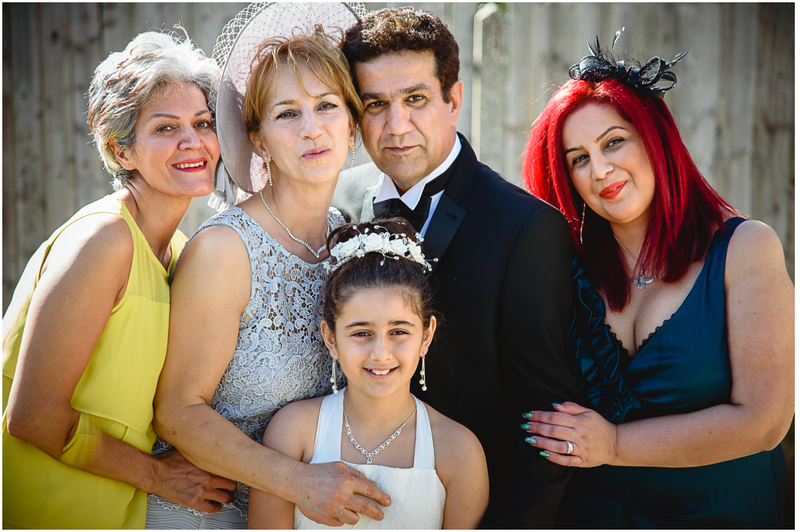 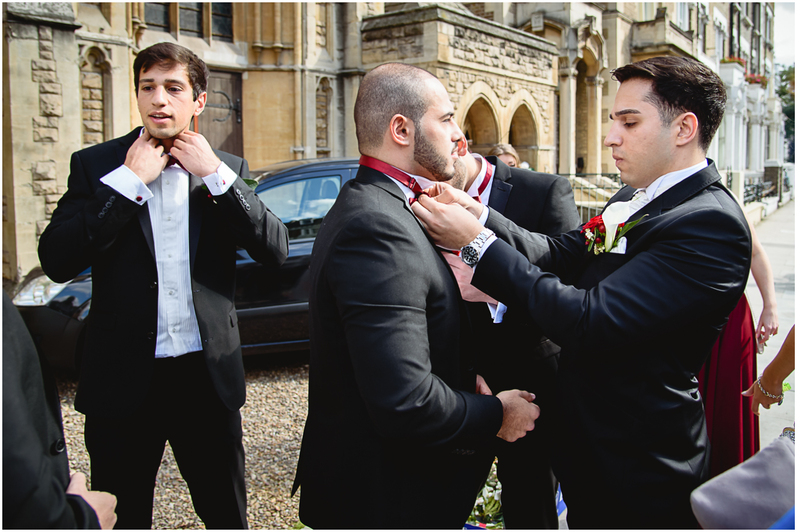 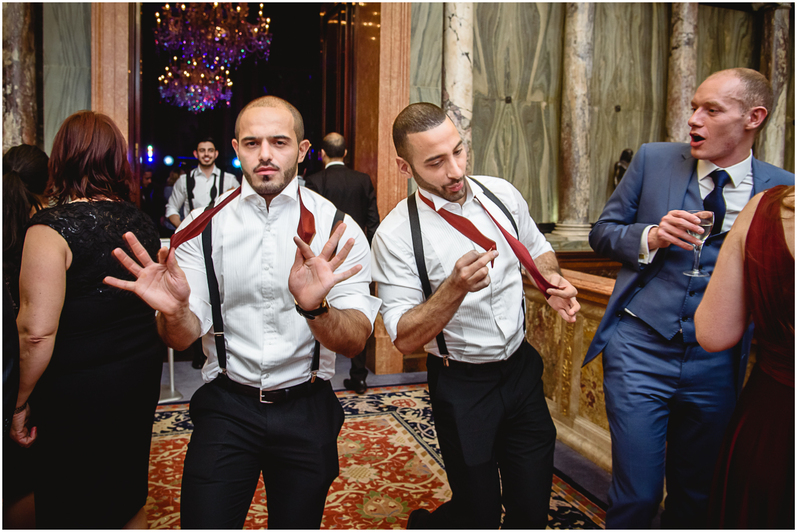 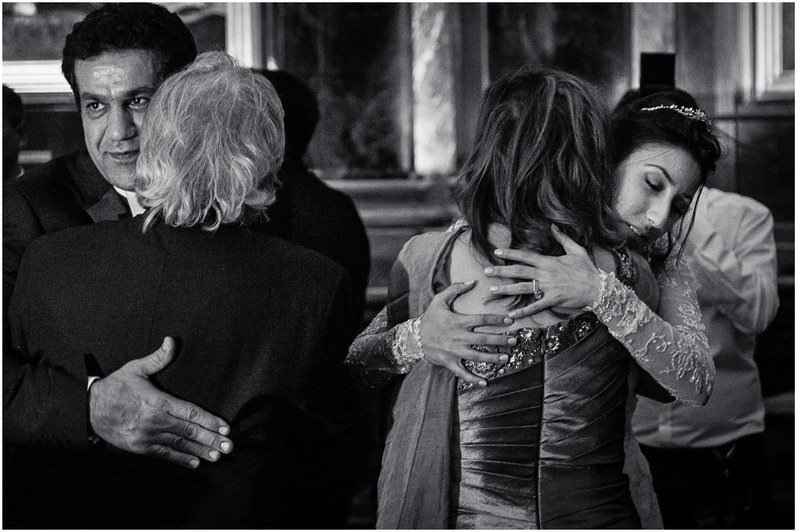 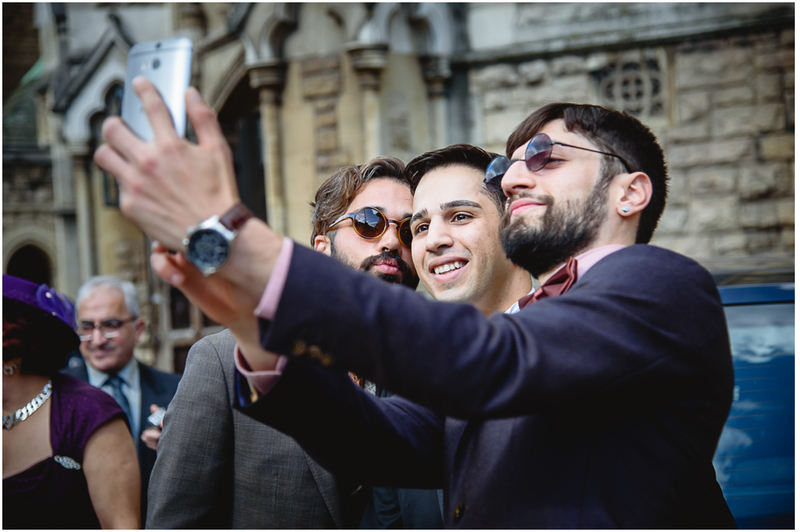 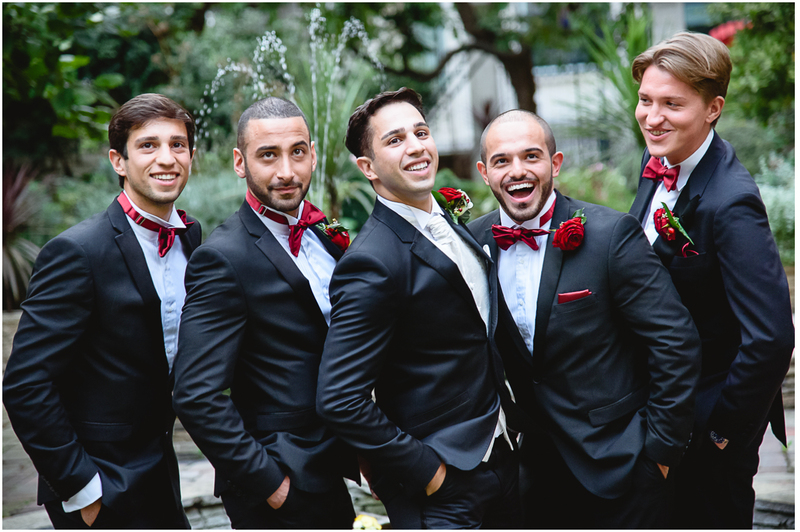 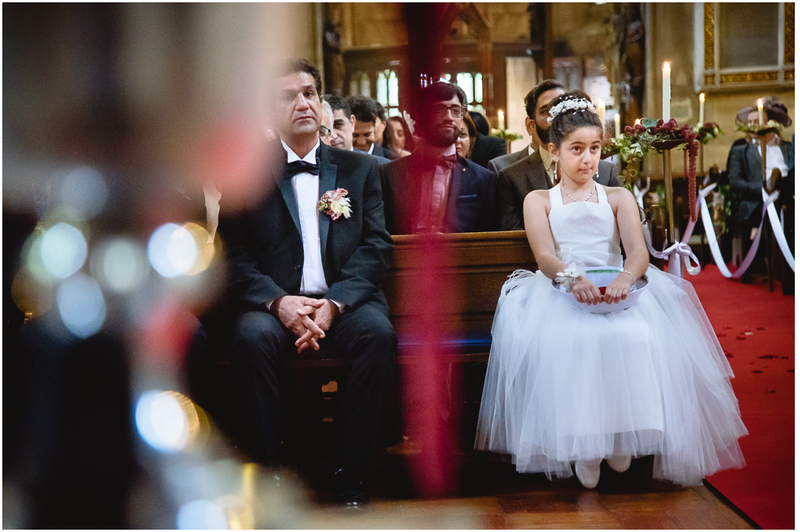 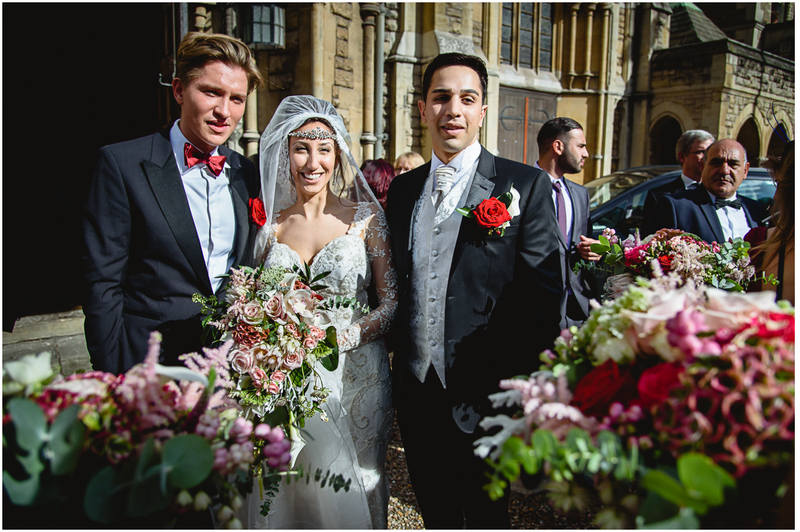 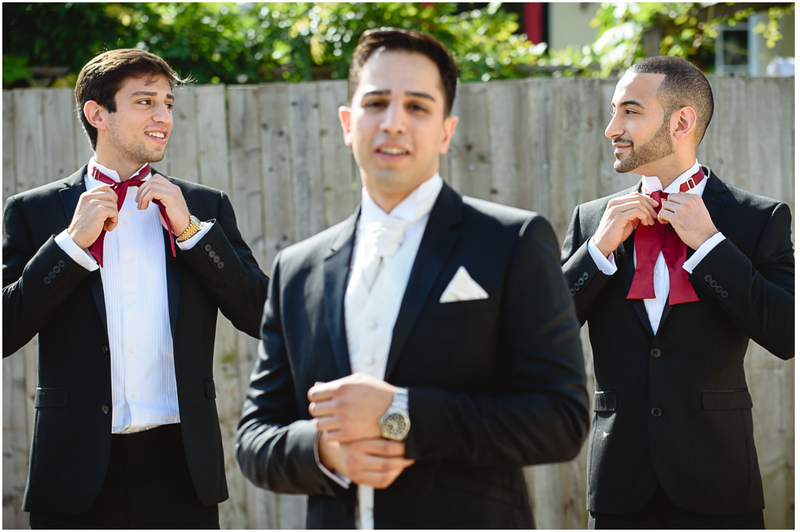 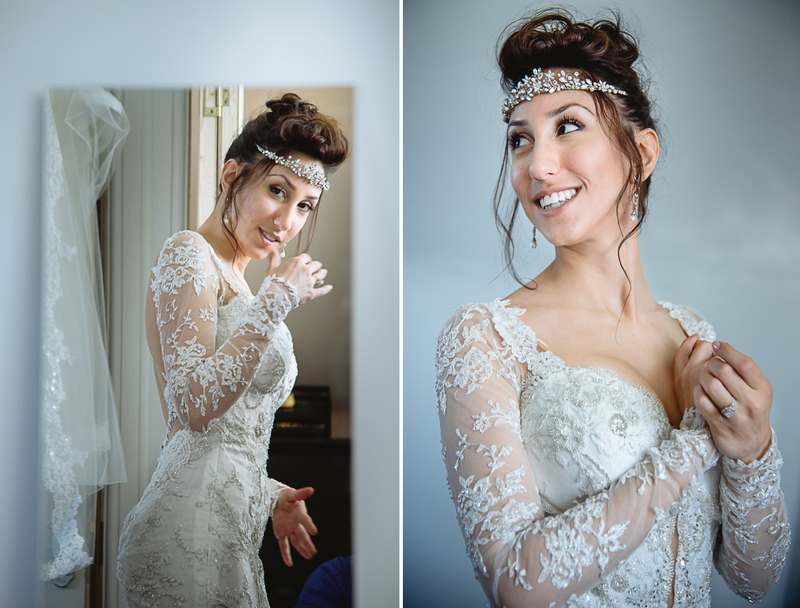 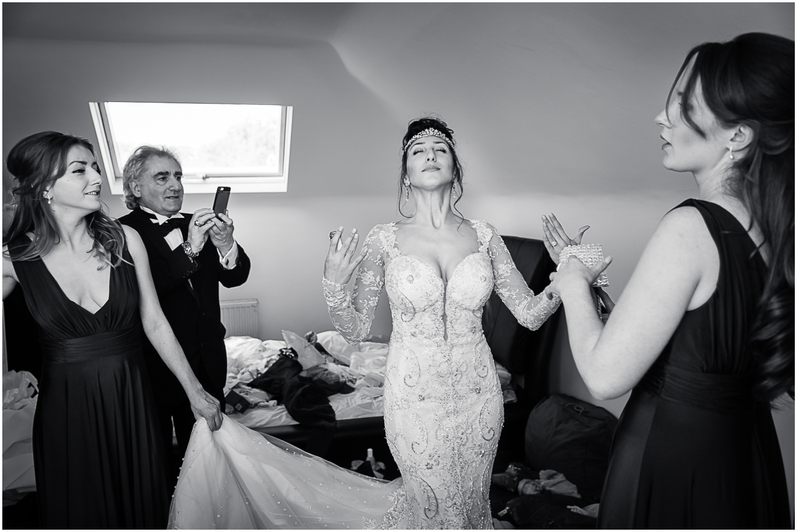 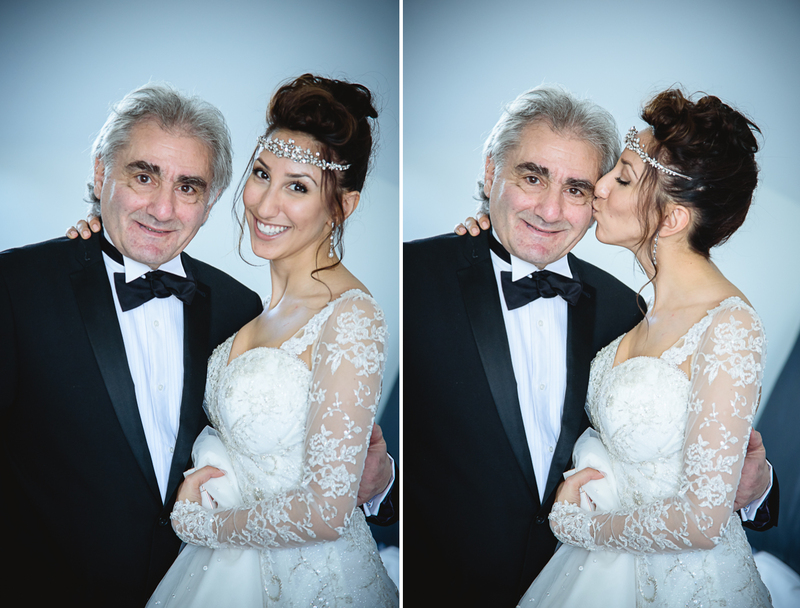 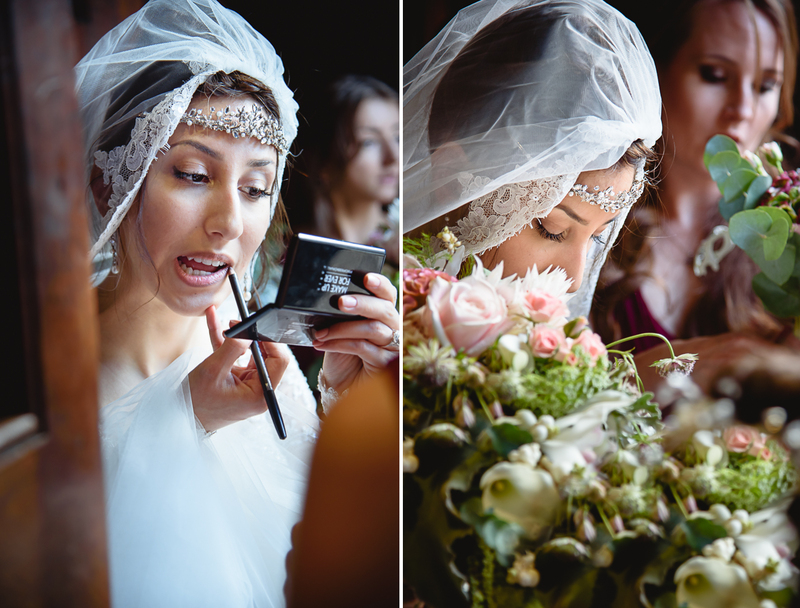 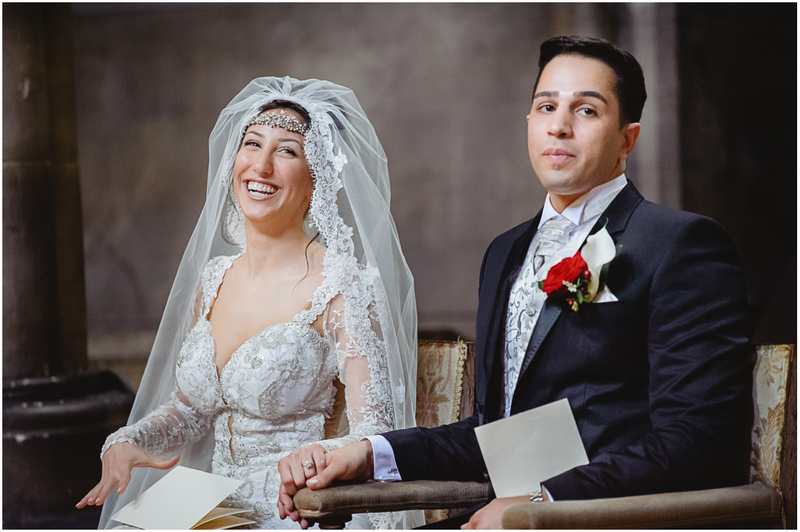 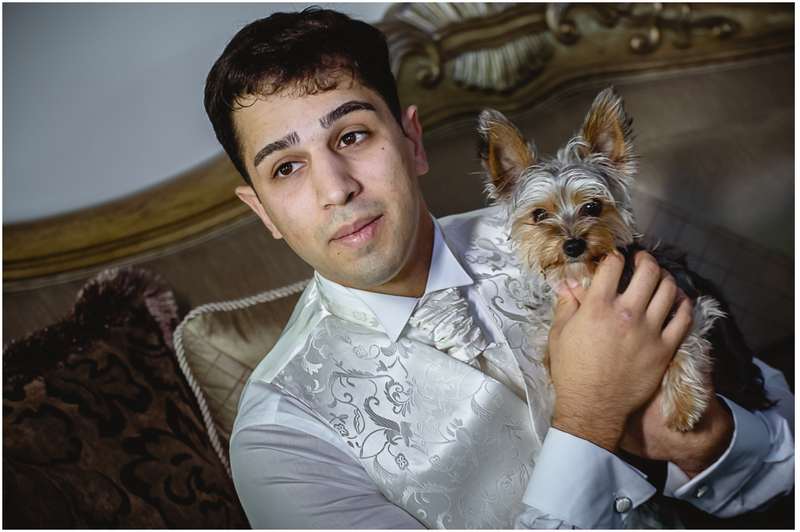 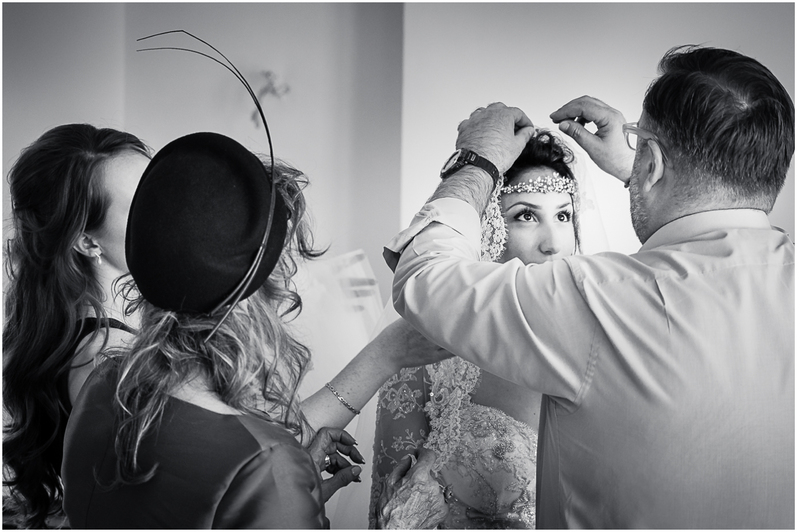 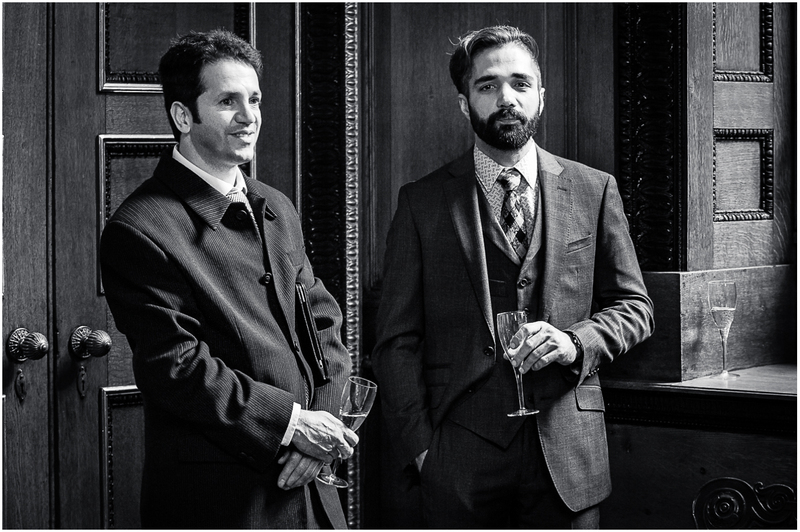 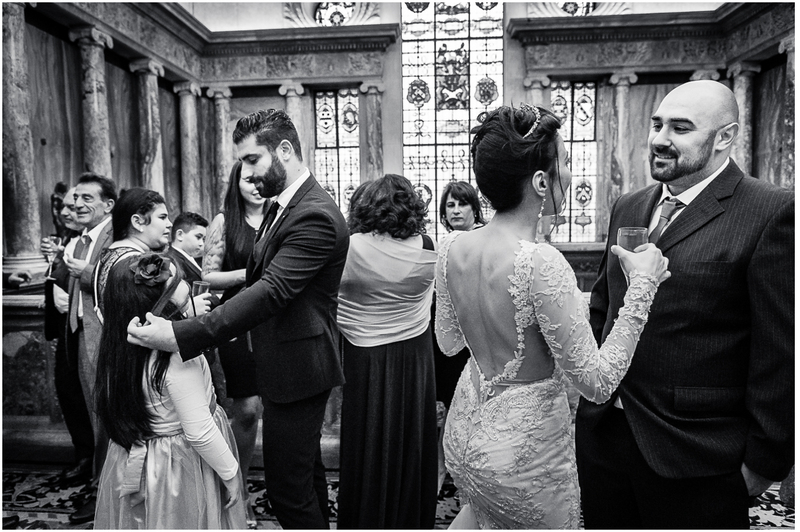 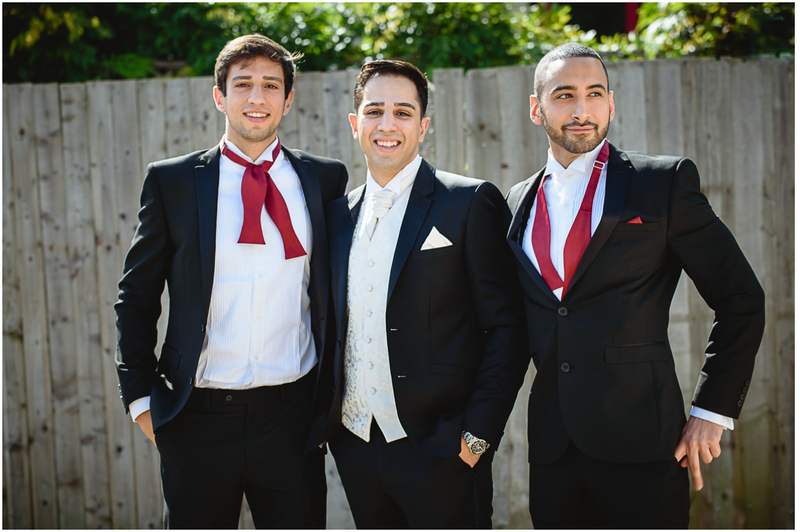 Iranian wedding is quite an experience for a London wedding photographer. 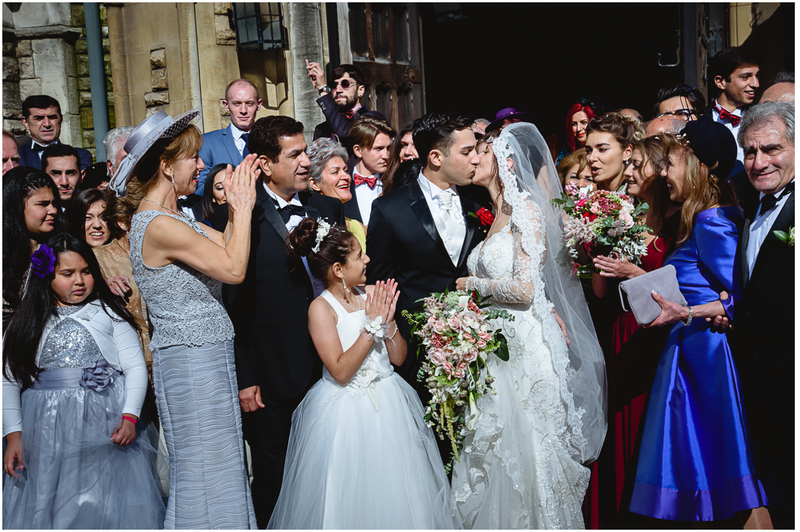 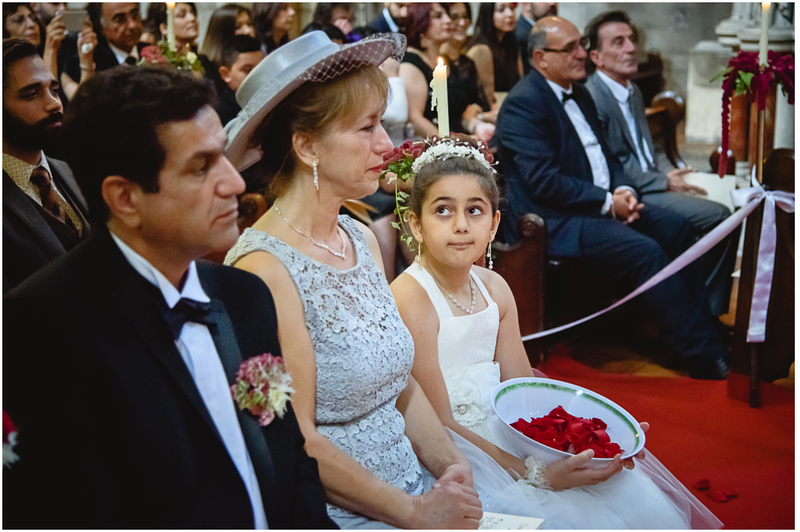 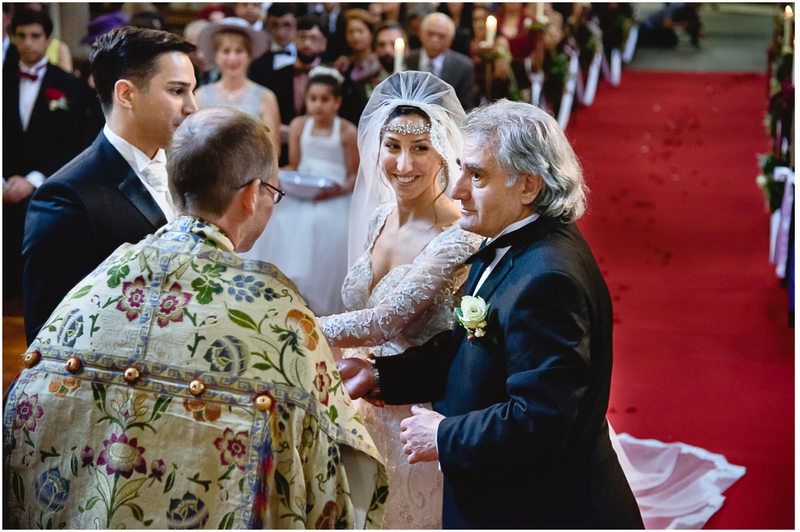 The church ceremony and traditional Iranian Sofreh Aghd ceremony were both outstanding and we were stunned by the beauty of both. 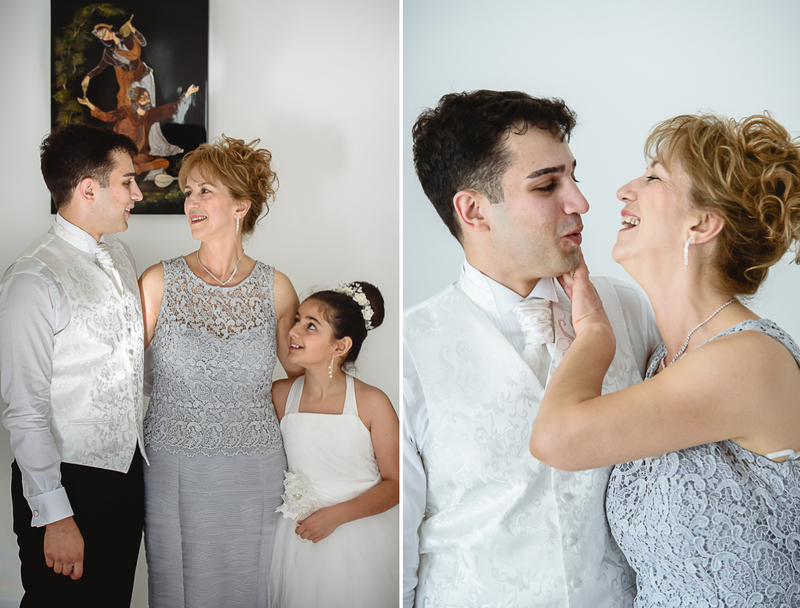 Abtin and Kristina were posing as supermodels and we spend a wonderful time with them. 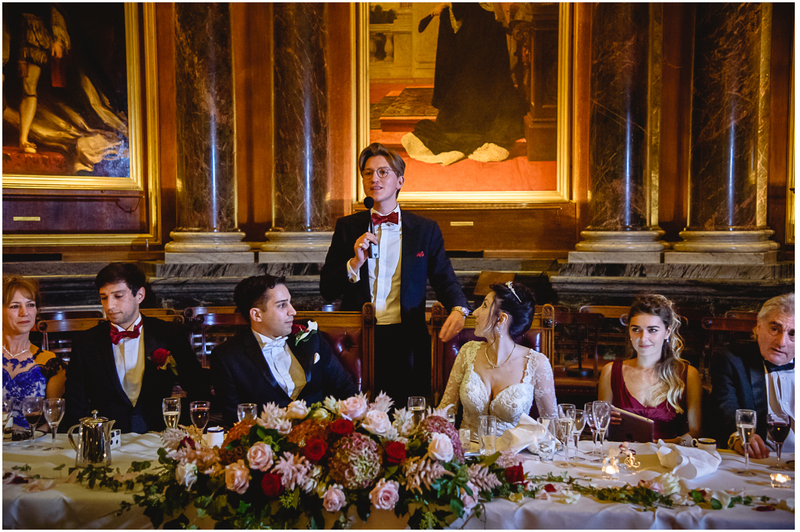 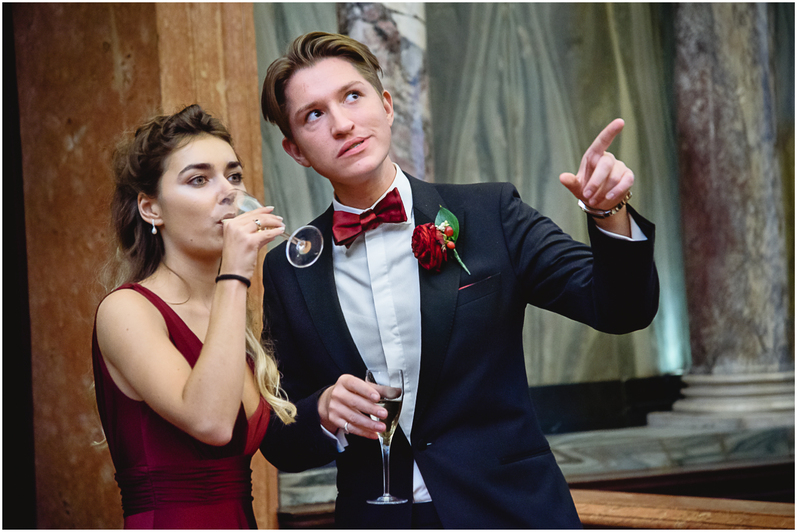 Just a few words about the Drapers Hall London for the couples that consider having their wedding party there. 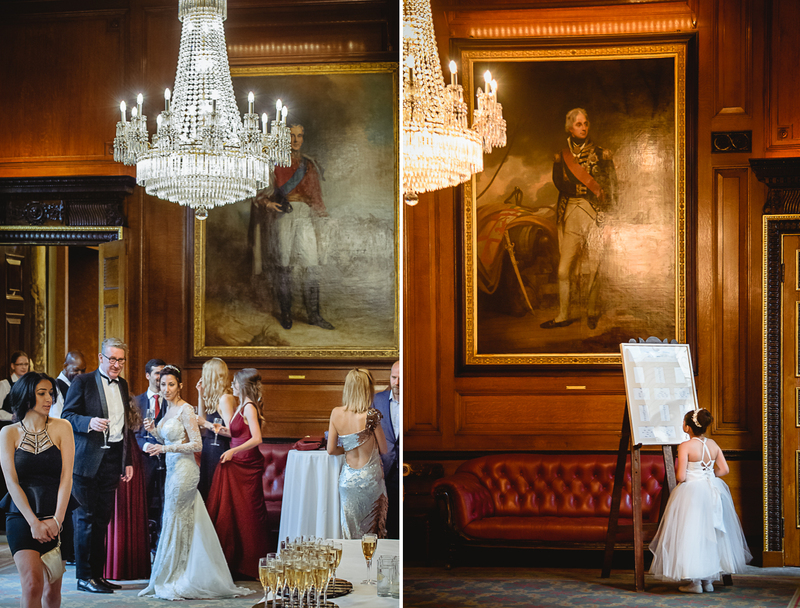 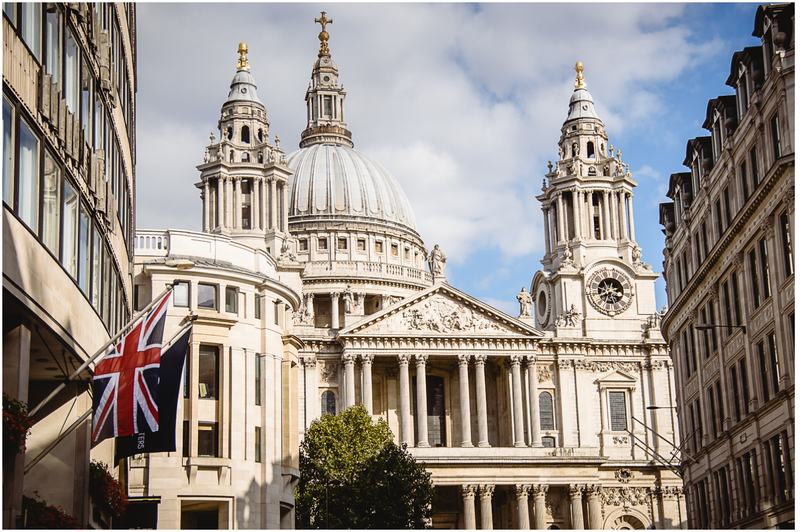 The Drapers Hall known also as a Livery Hall is located in the heart of the City of London, next to the London Wall and it has a very long history. 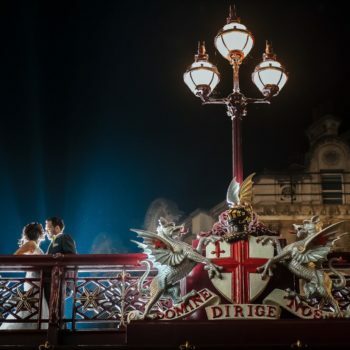 It was owned by Drapers Company since 1543. 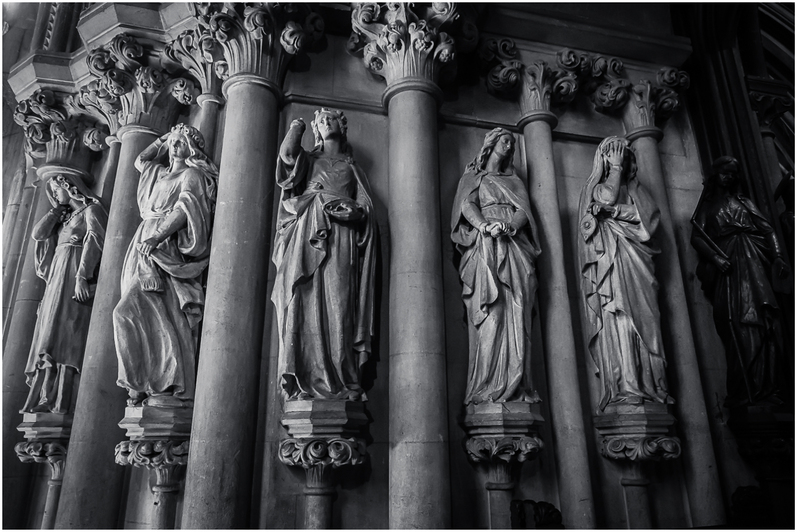 Destroyed twice by the fire was completely rebuilt in 1772 by the architect John Gorham. 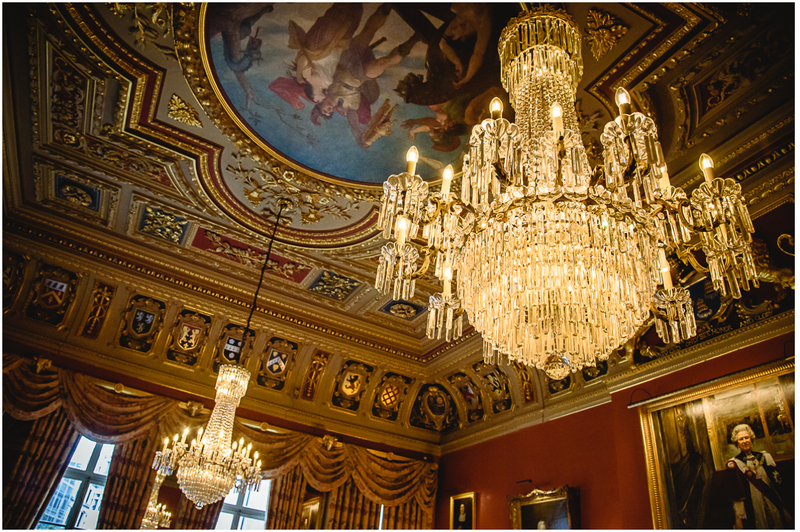 The whole interior is very beautiful and consists of many lovely rooms. 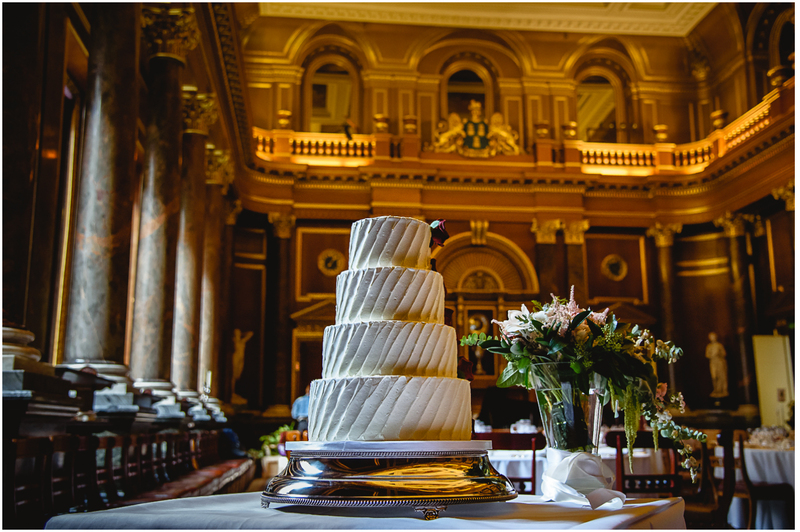 It is ideal for a big wedding party. 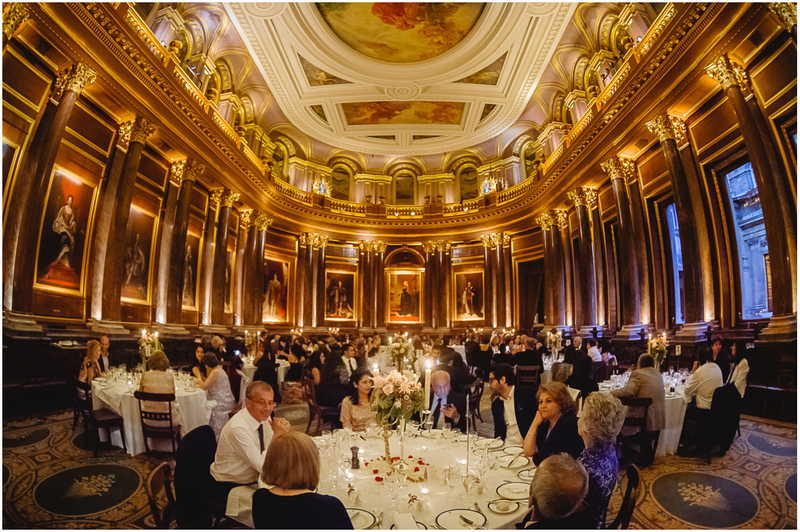 The largest room called Livery can fit up to 260 guests and it is very spacious, very high class and posh. 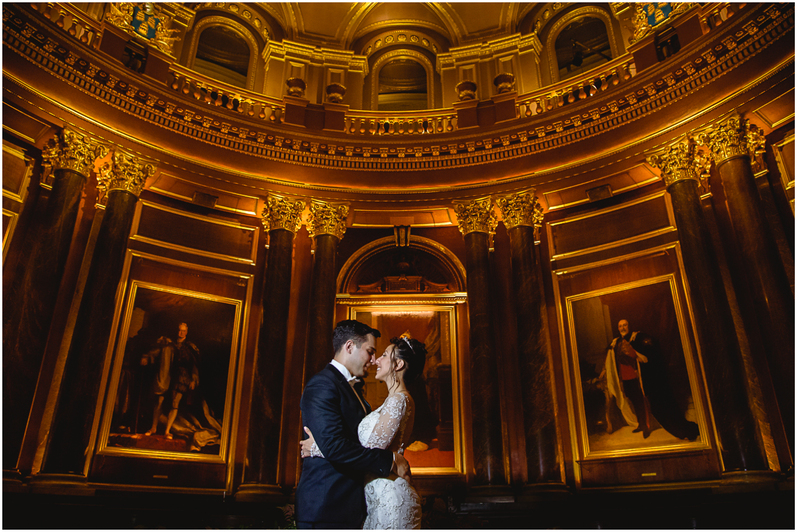 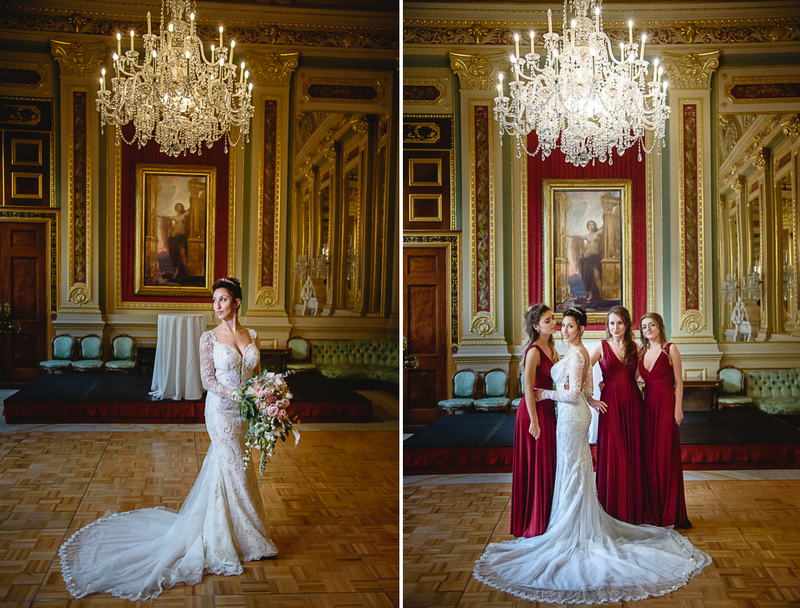 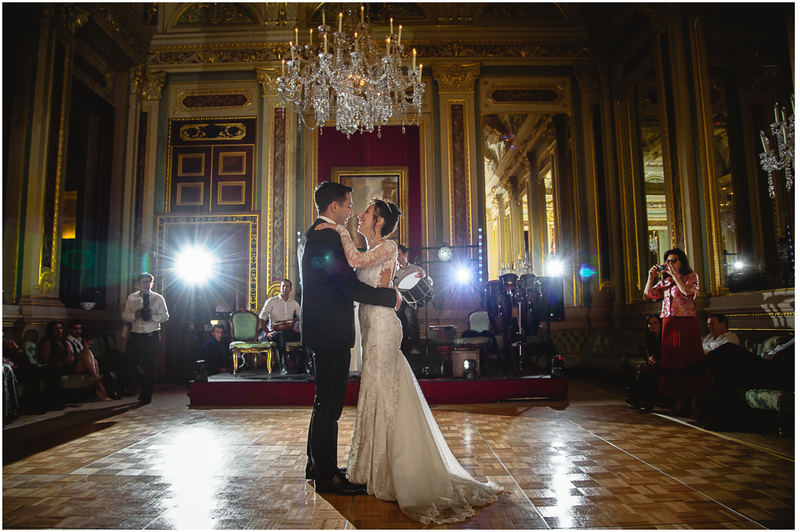 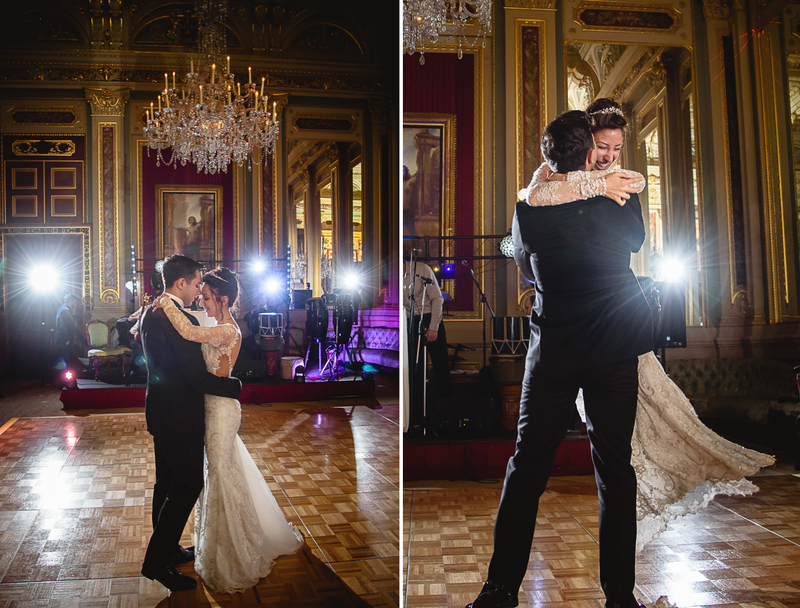 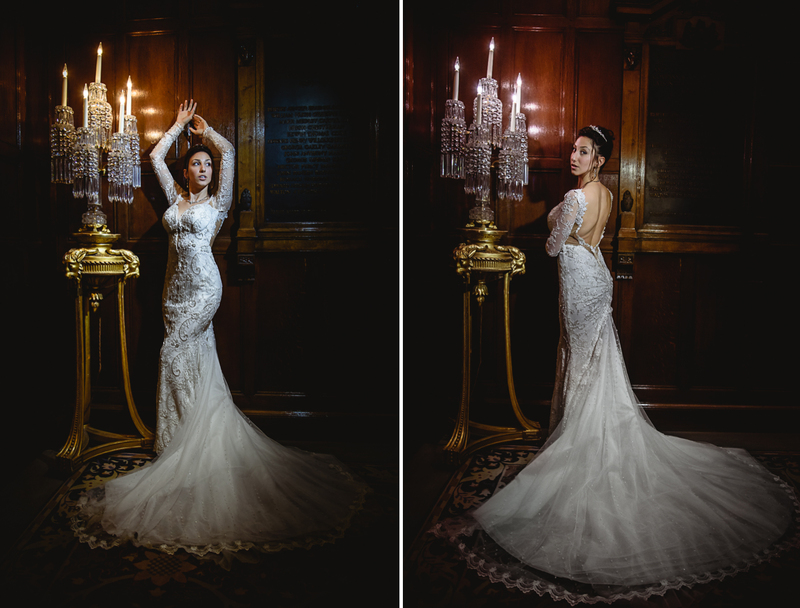 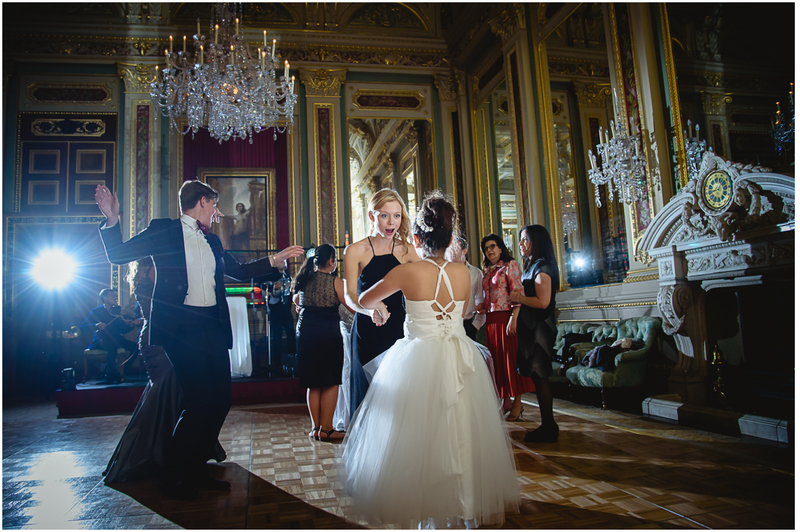 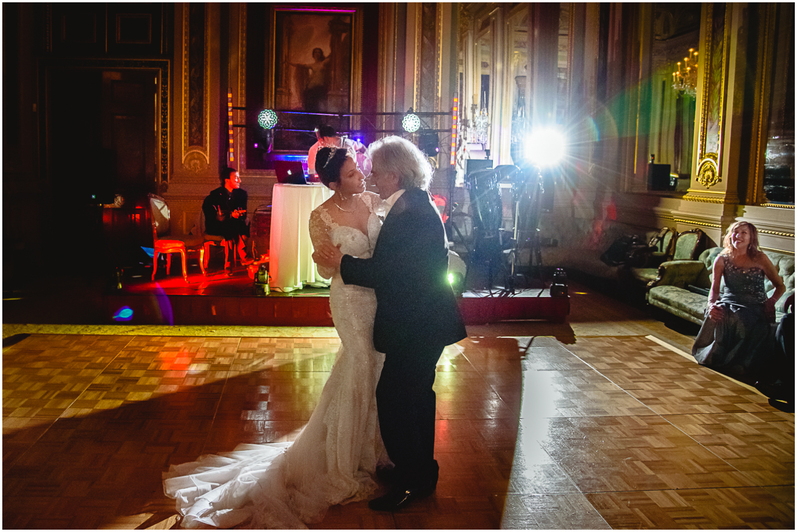 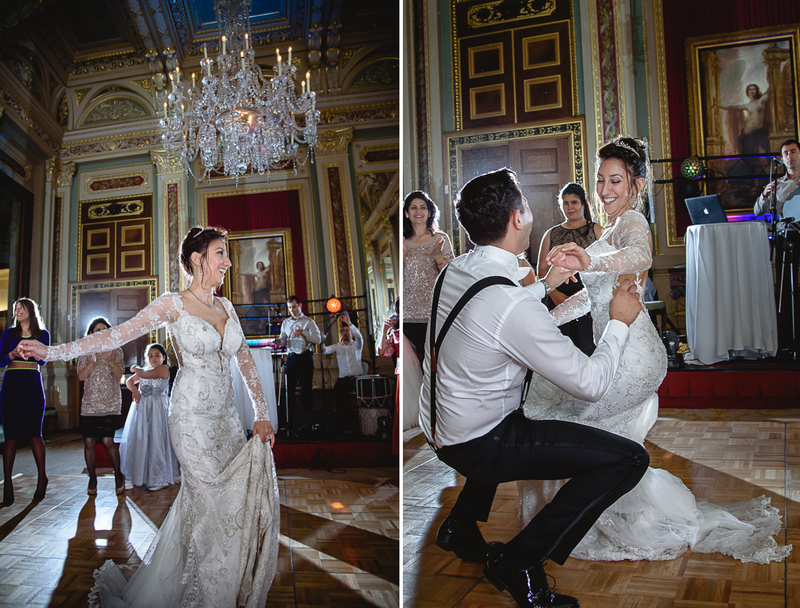 The Drapers Hall London is a dream comes true for every wedding photographer London. 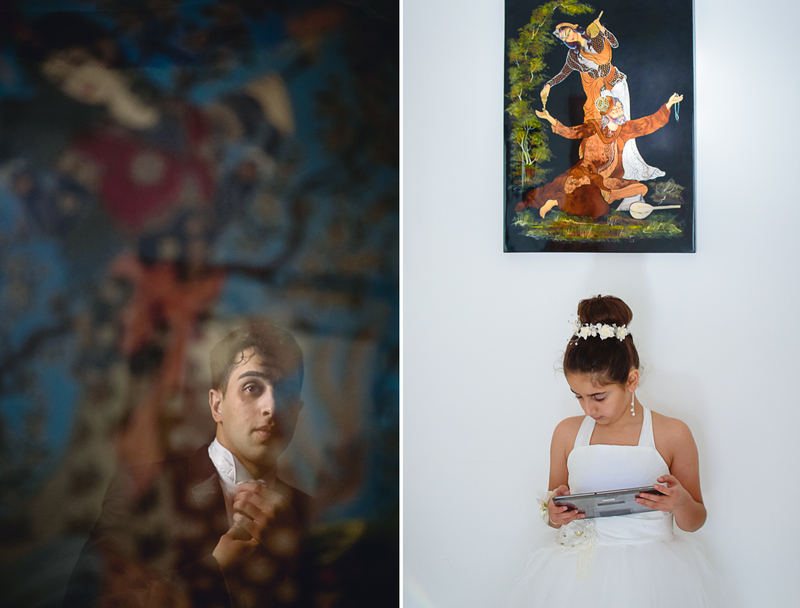 All the rooms have lots of artwork. 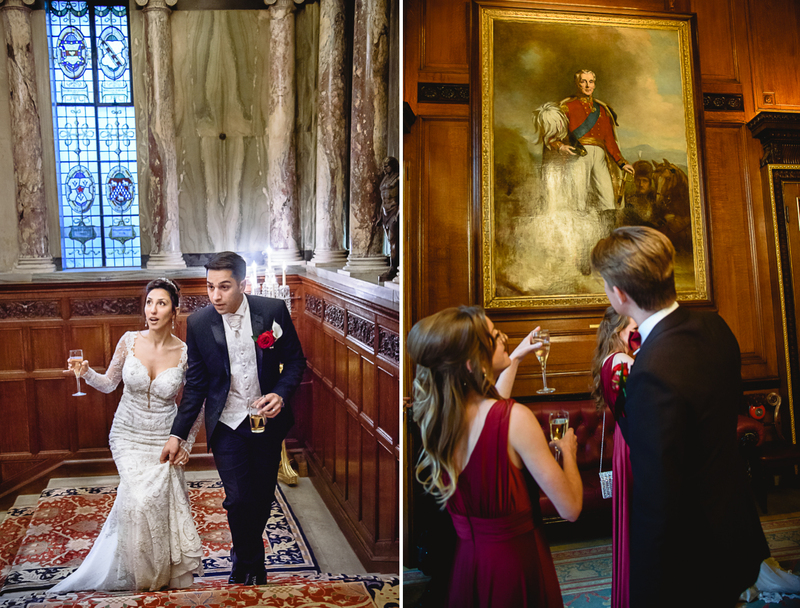 Beautiful paintings and statues are creating the delightful mood and are really pleasing to the eye. 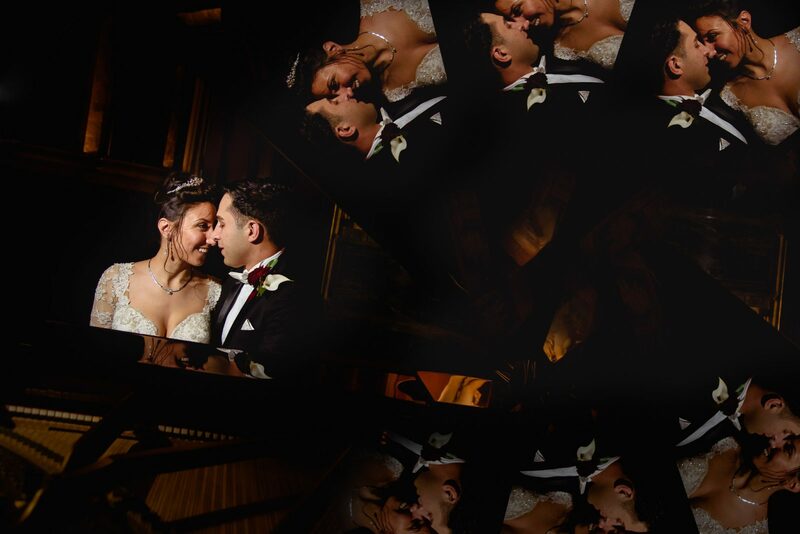 The piano in the main hall and lovely music is a real icing on the cake and makes the wedding breakfast an unforgettable experience. 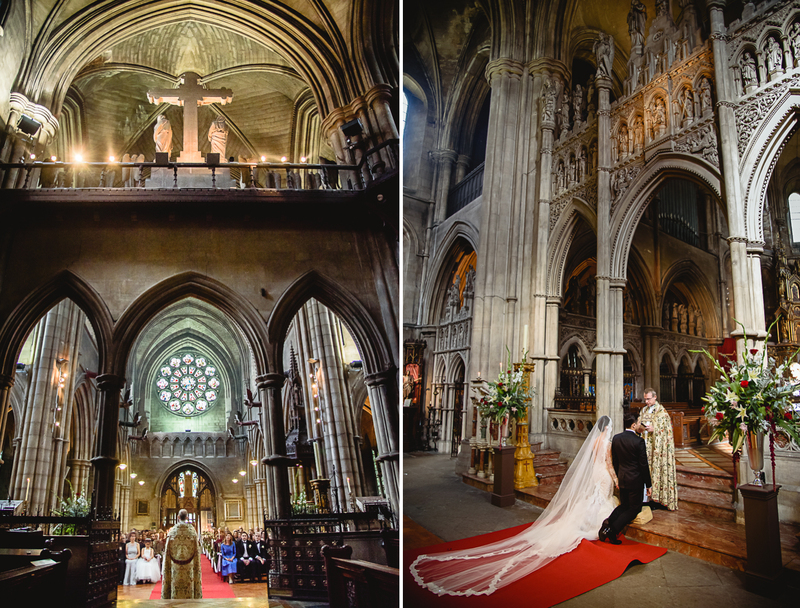 The interior is epic and was in many Hollywood productions, like The Kings Speech, Golden Eye and The Lost Prince. 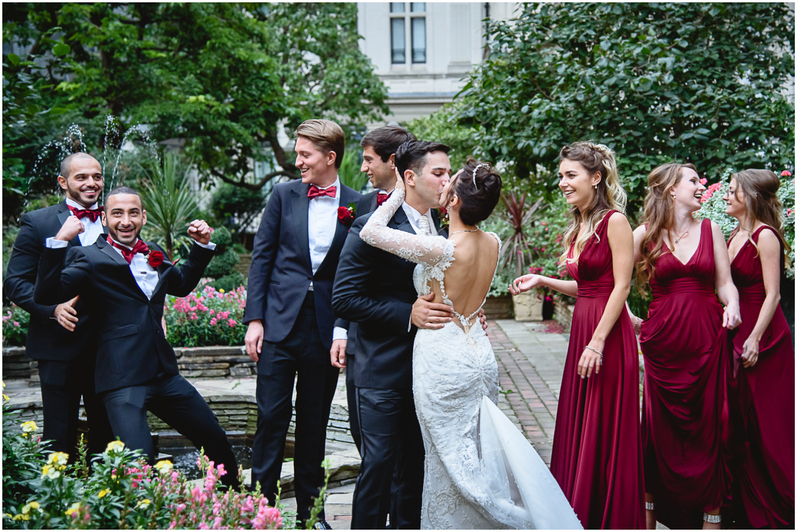 So without further ado, please enjoy the pictures. 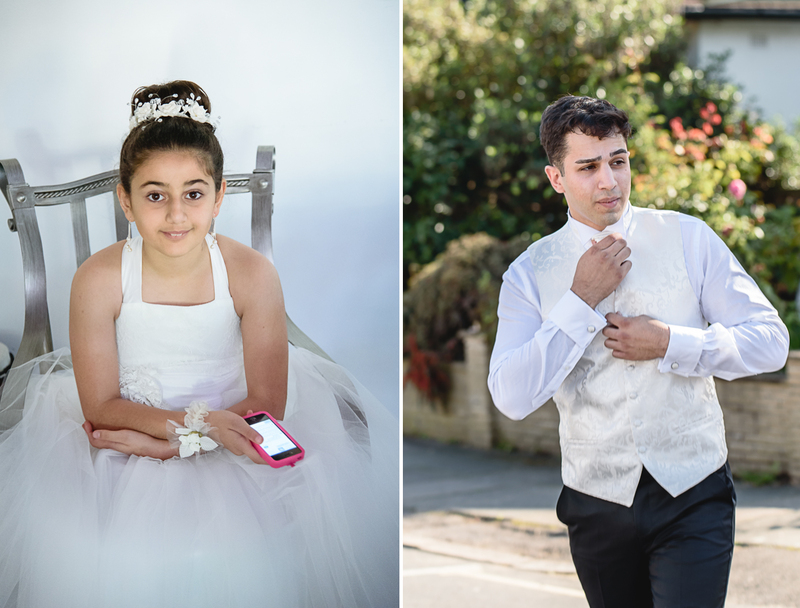 Great pictures well done both of you.